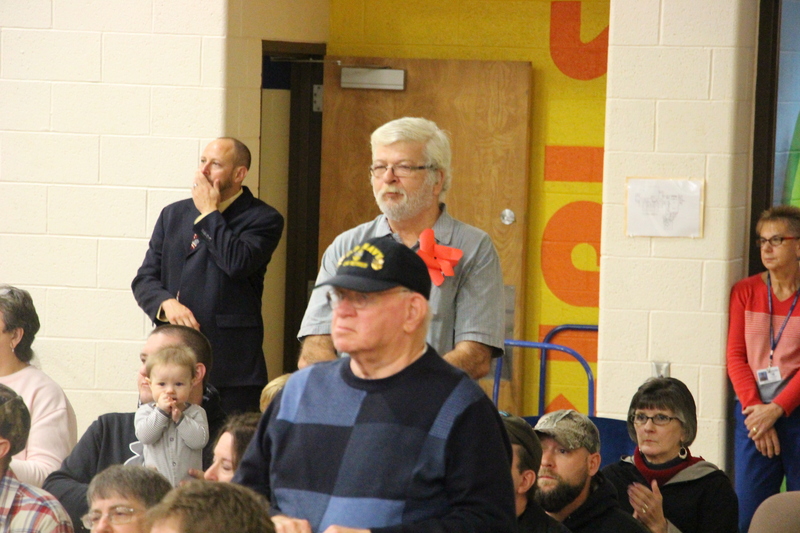 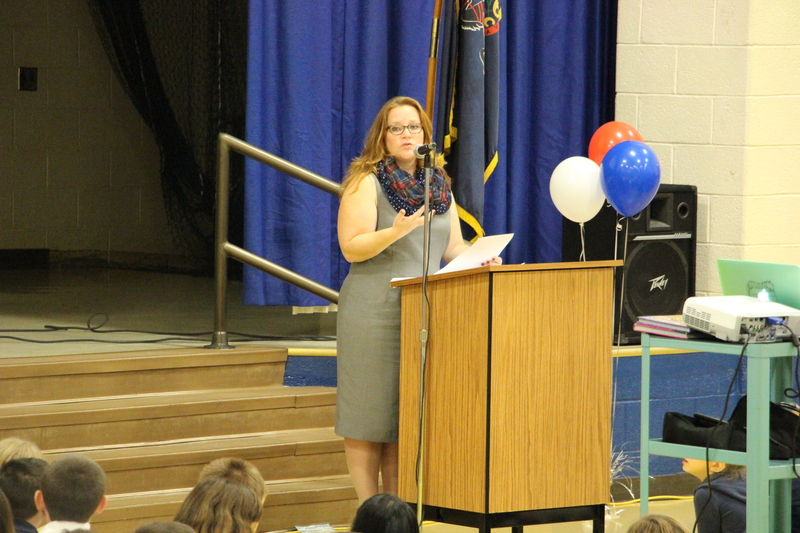 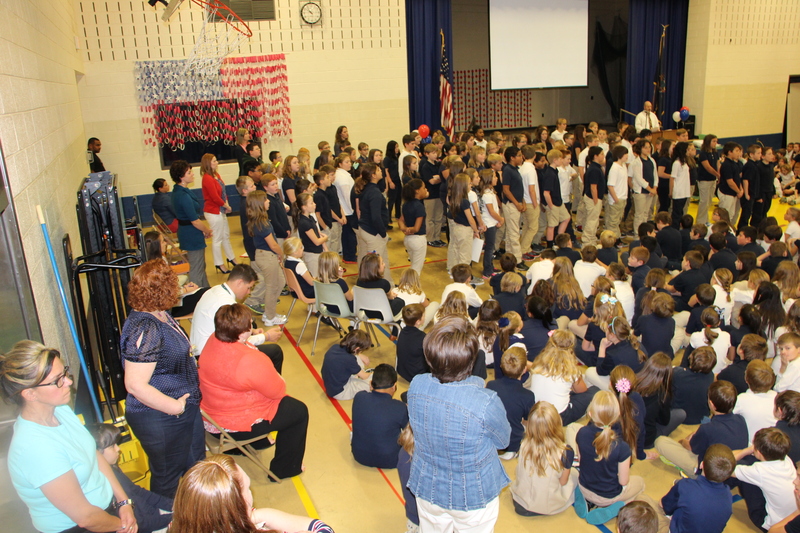 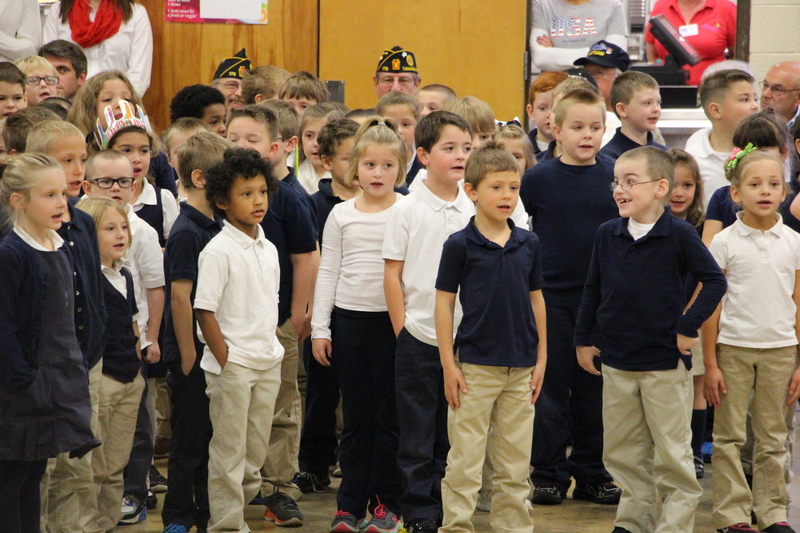 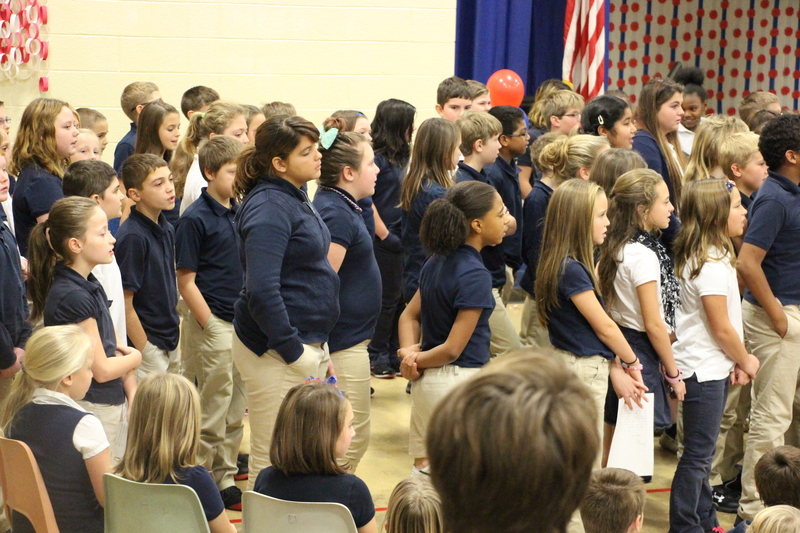 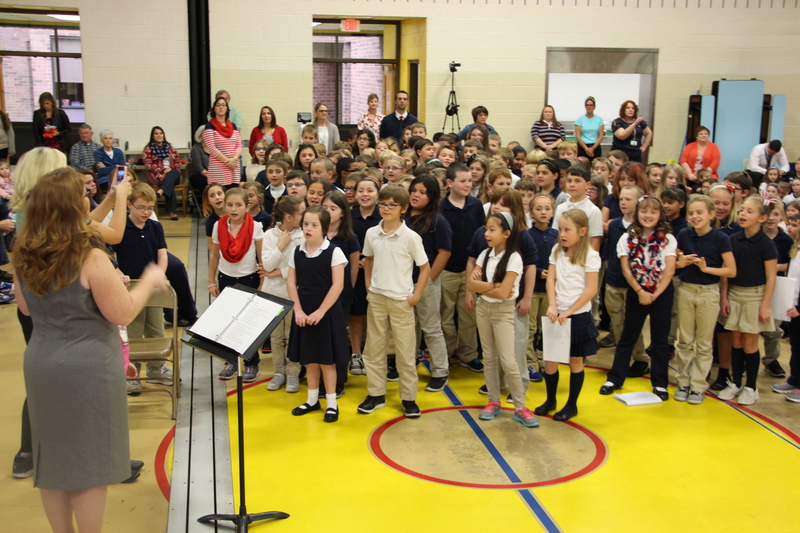 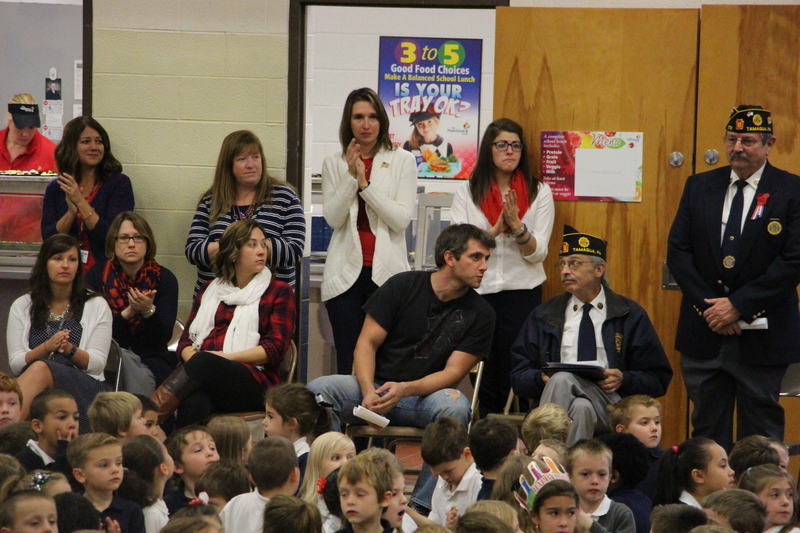 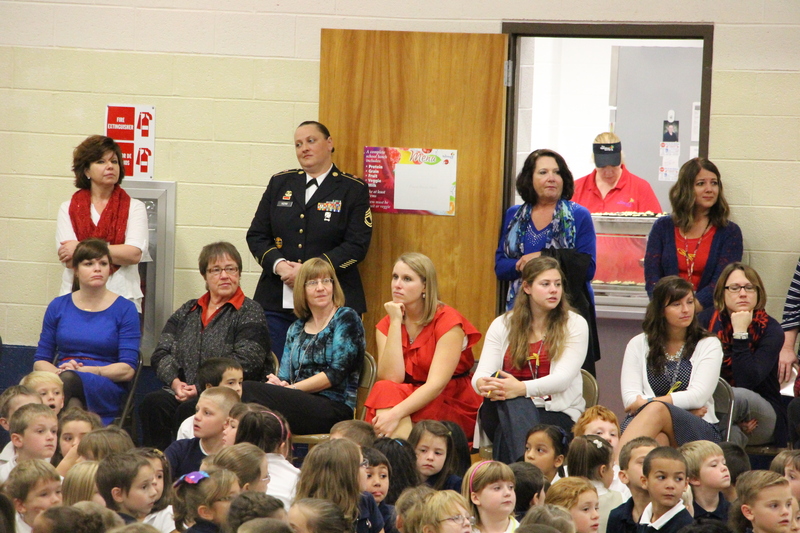 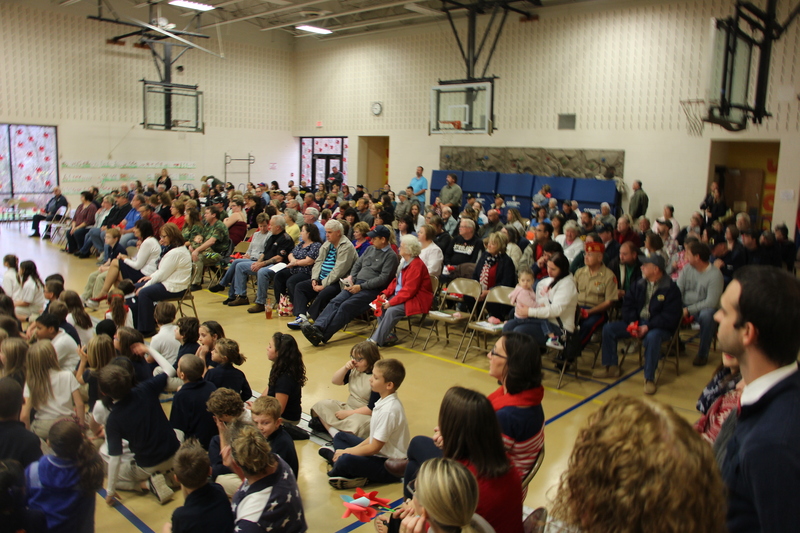 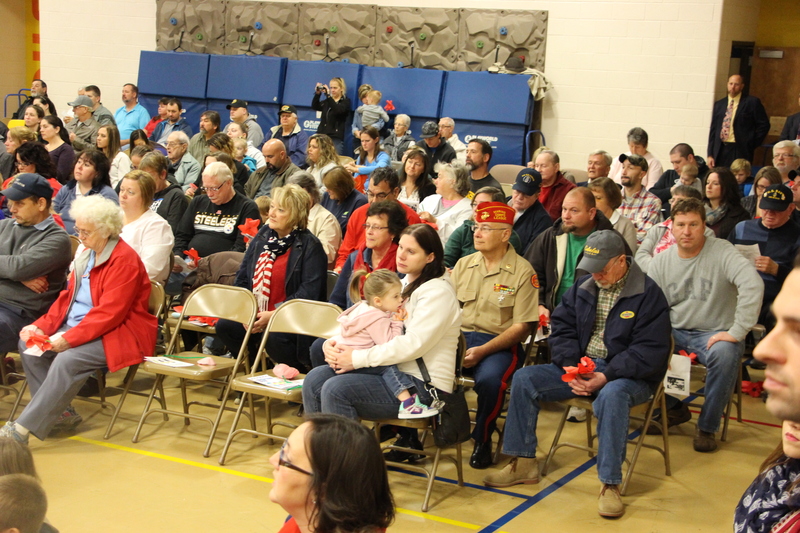 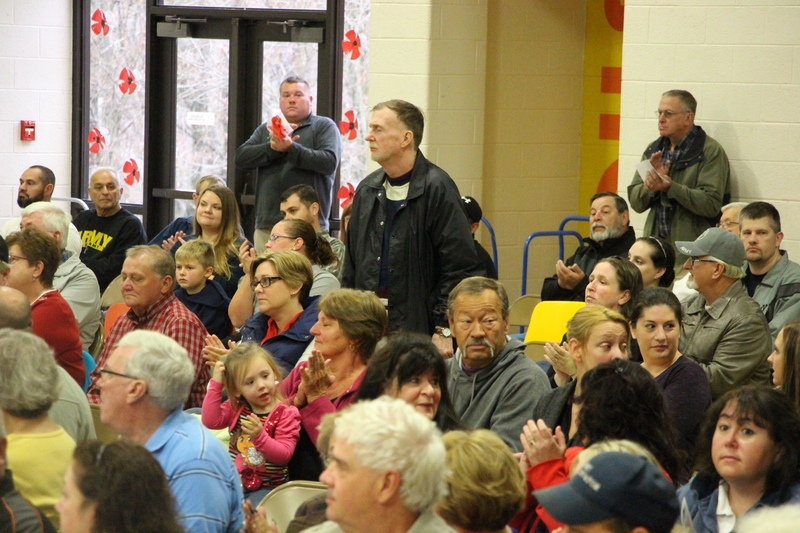 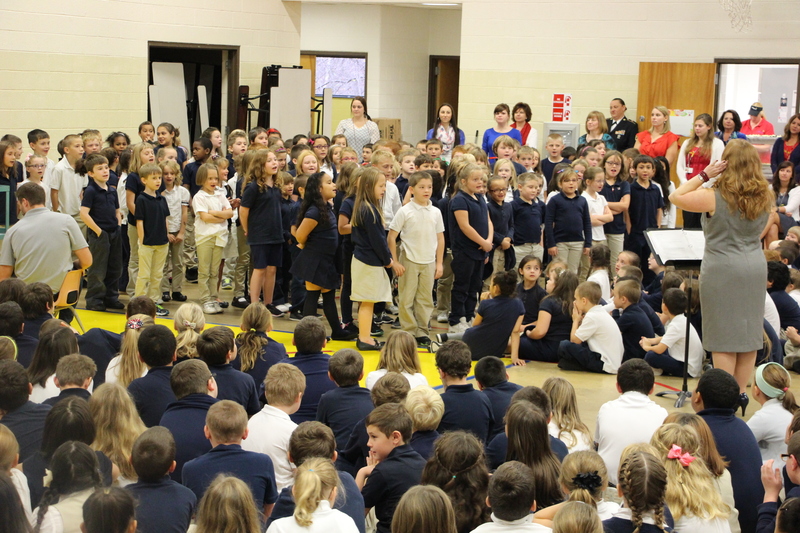 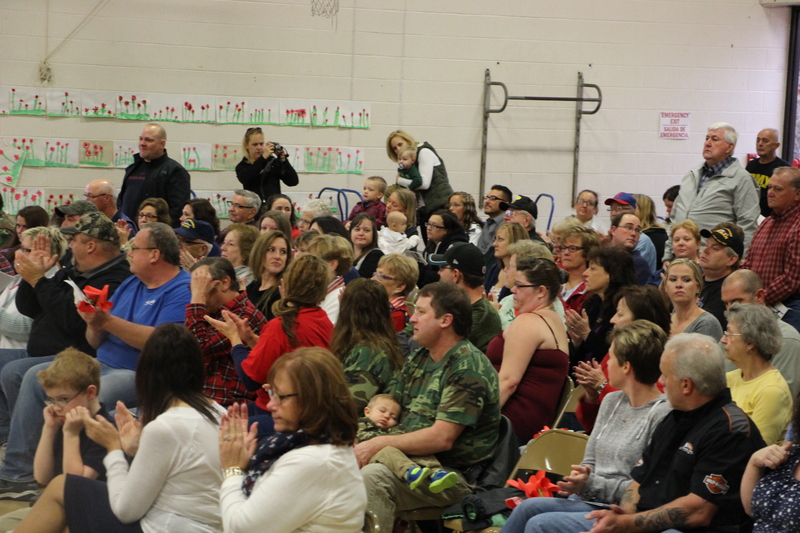 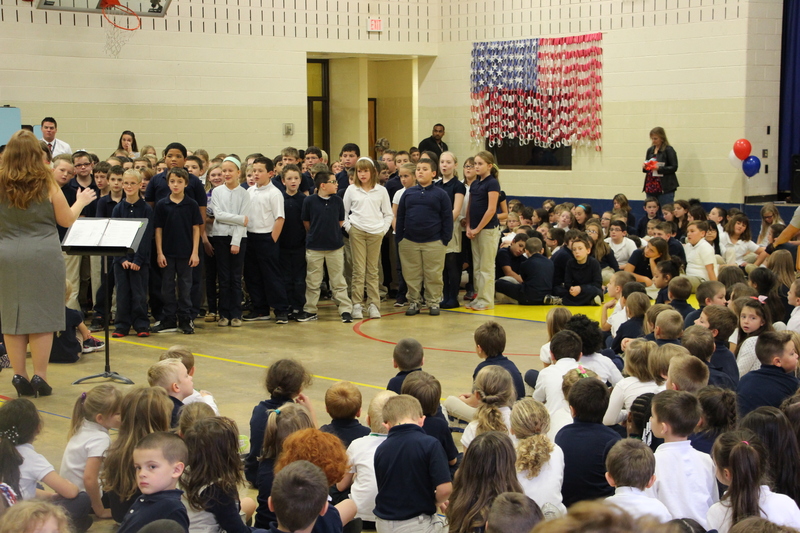 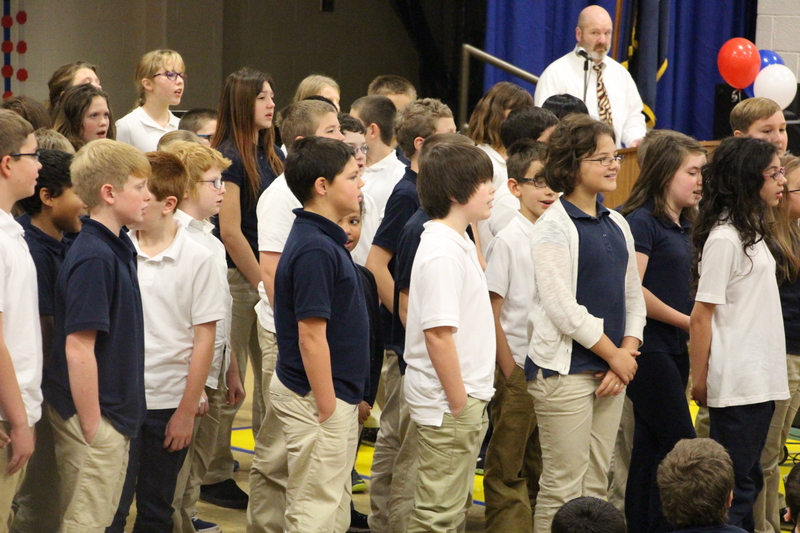 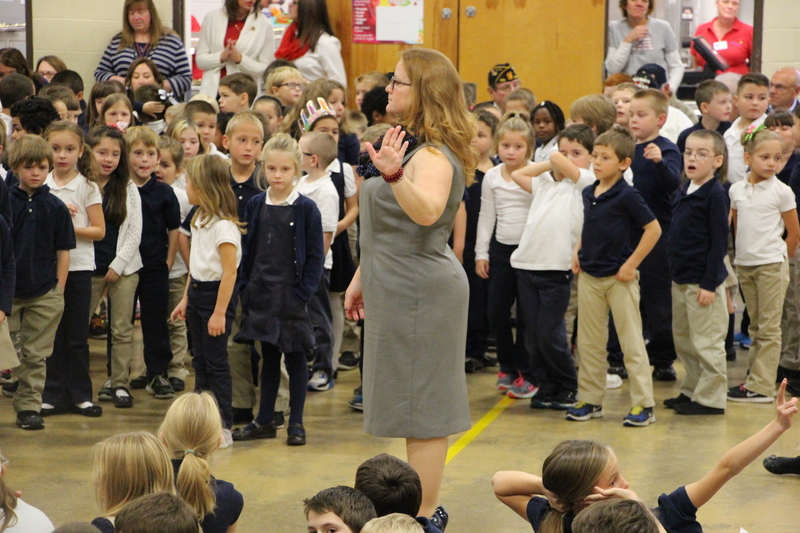 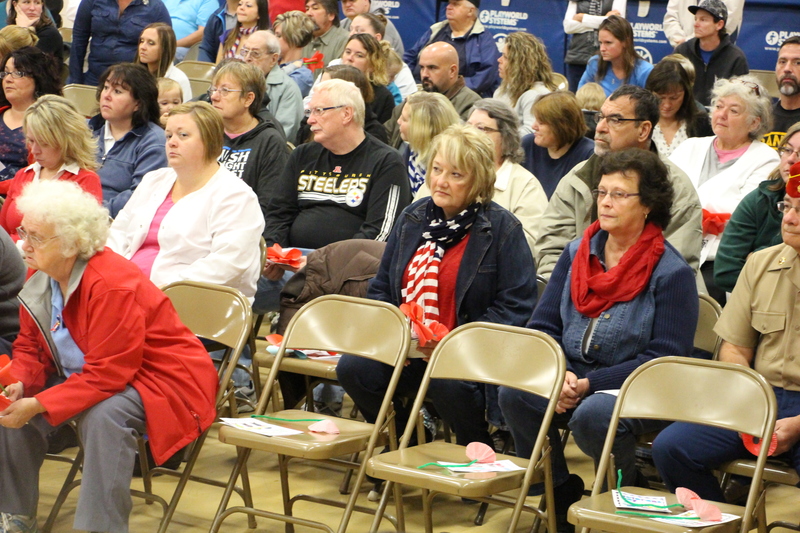 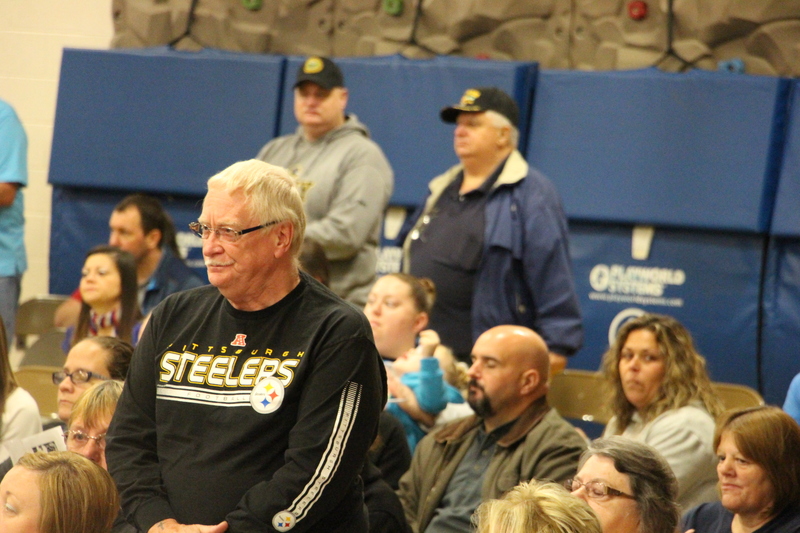 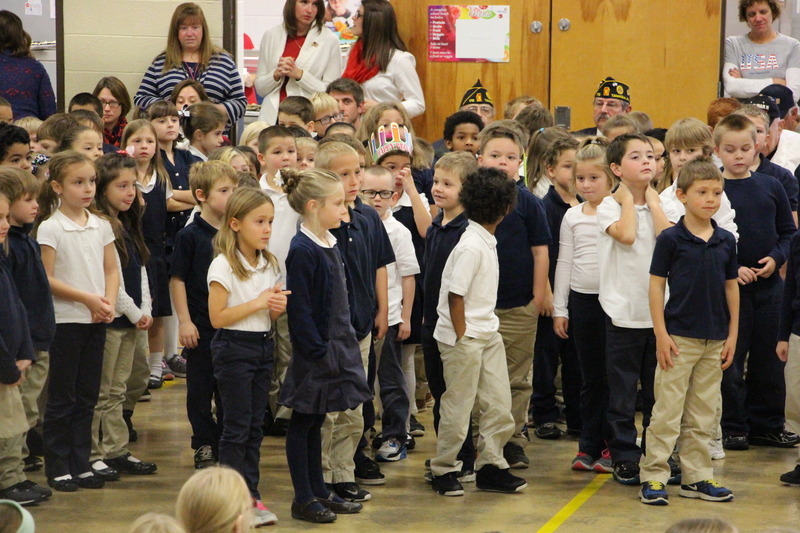 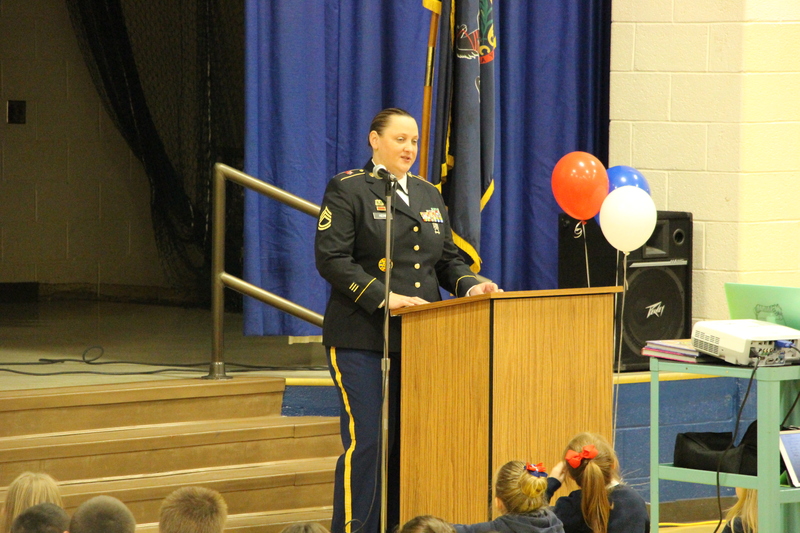 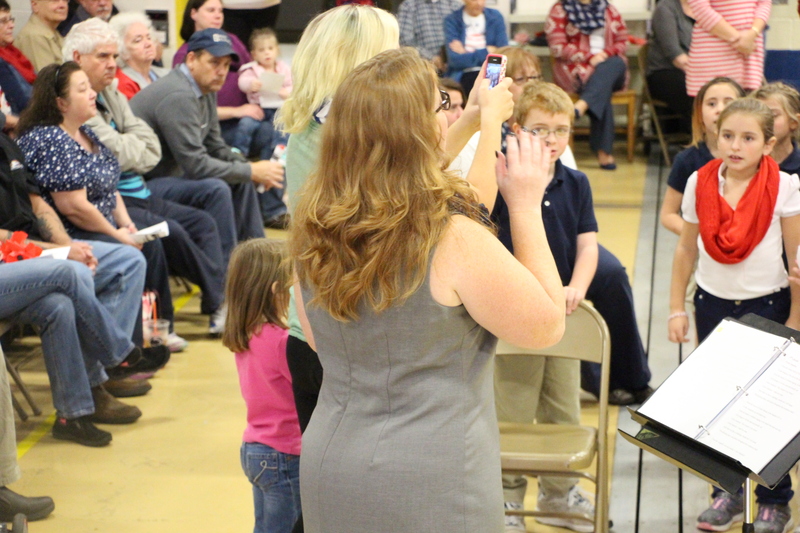 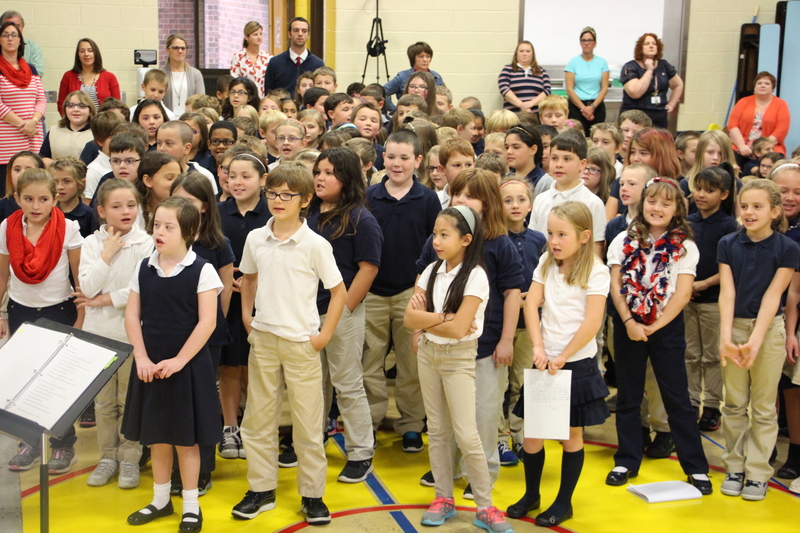 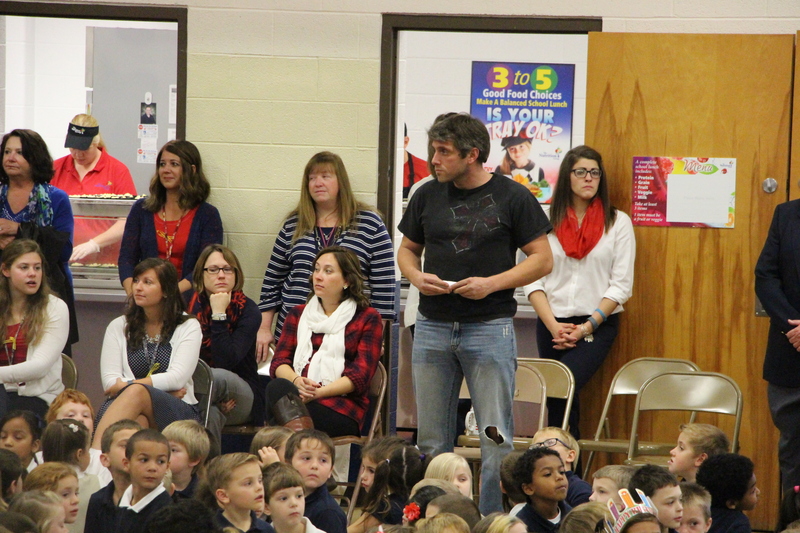 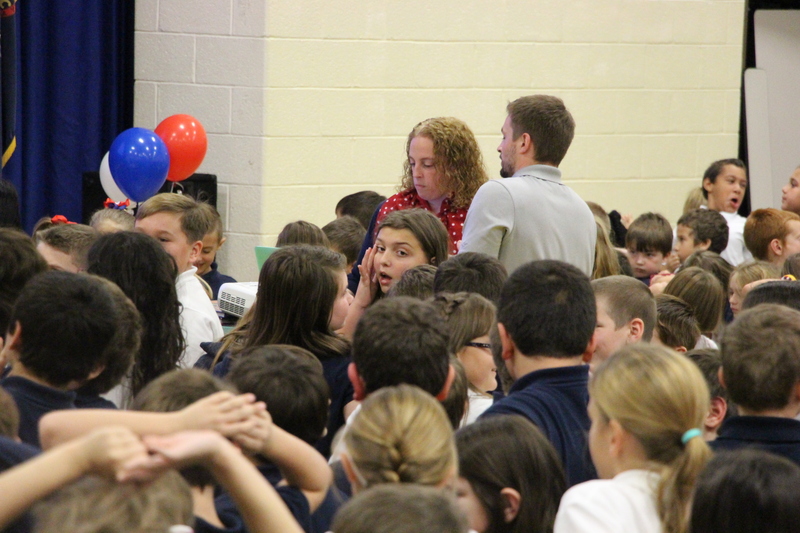 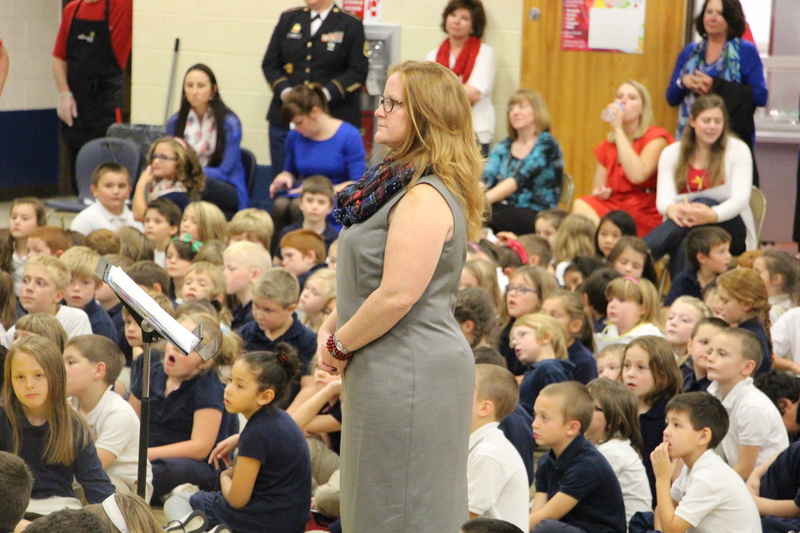 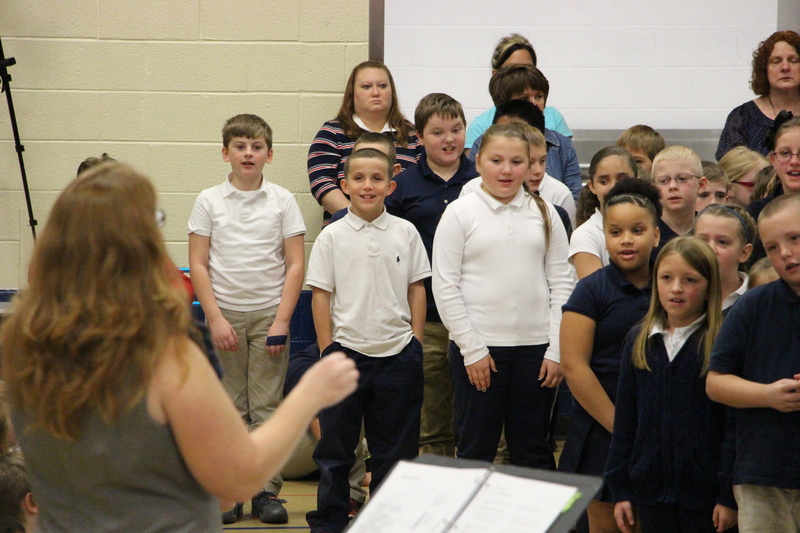 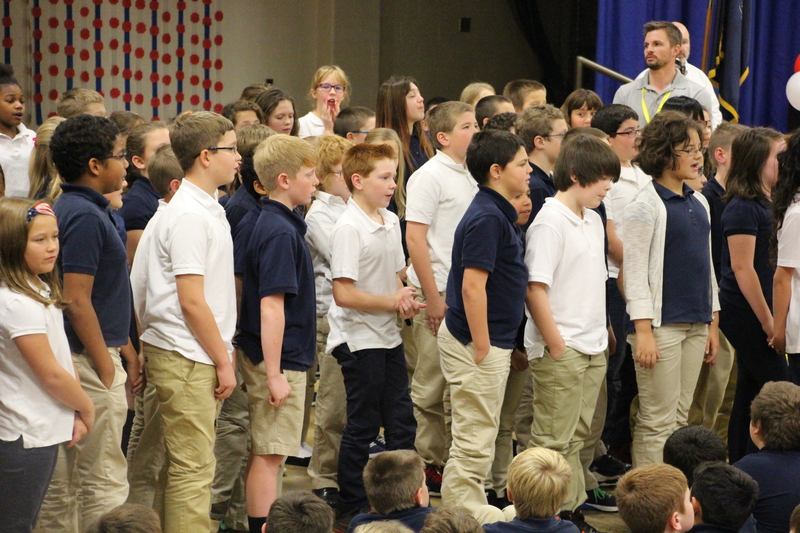 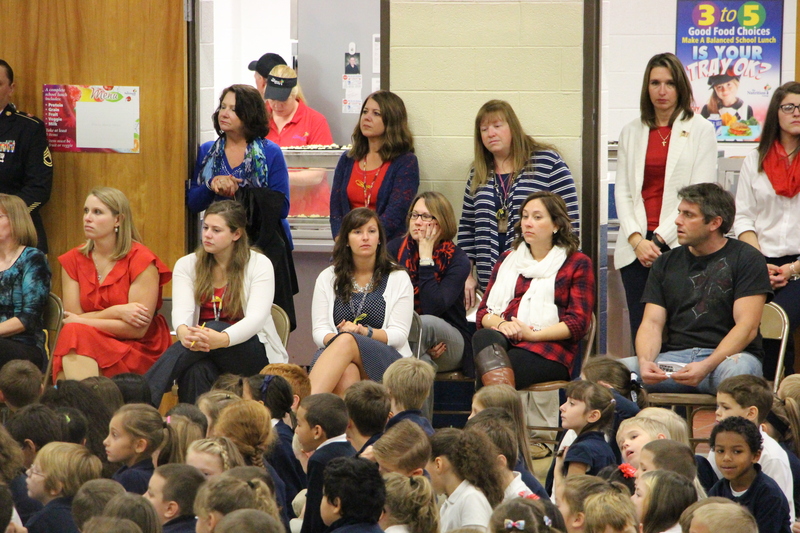 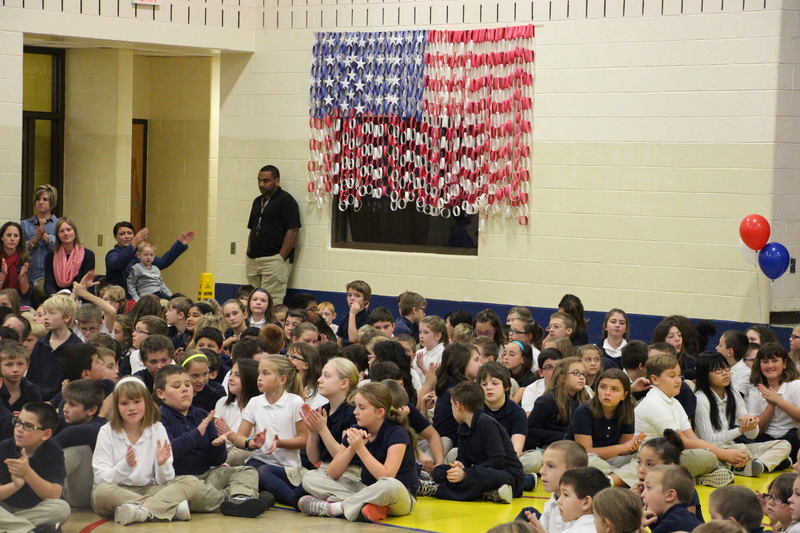 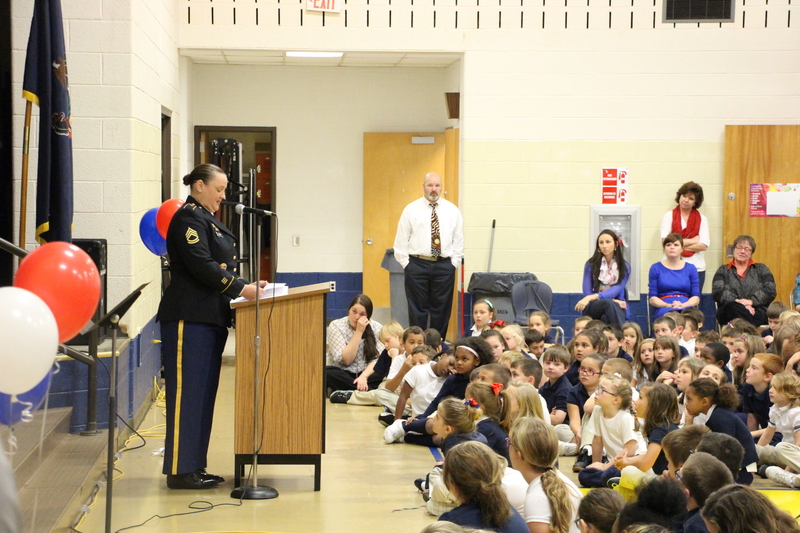 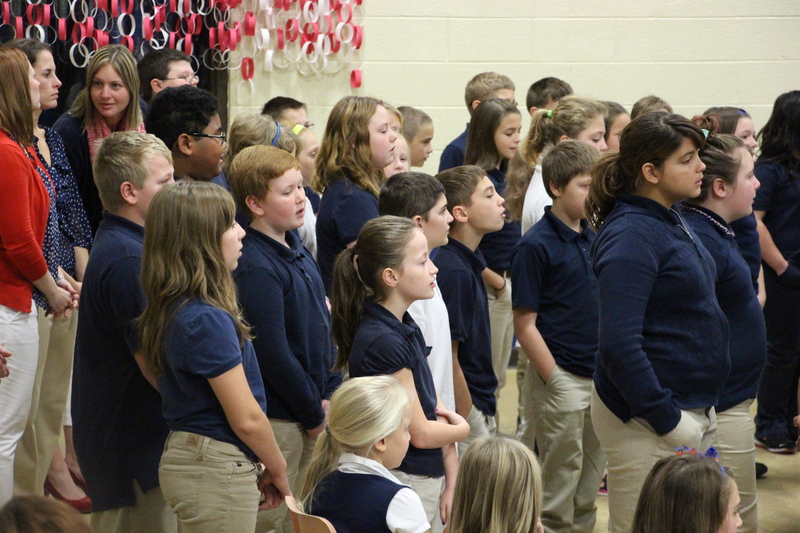 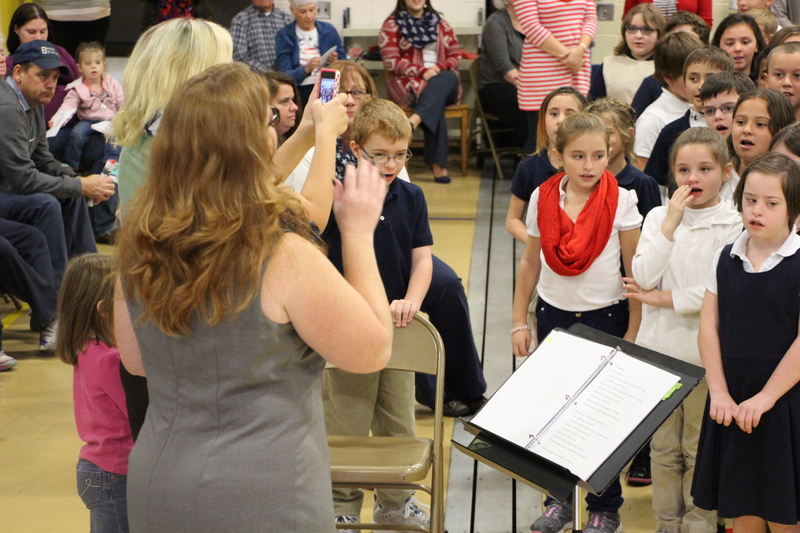 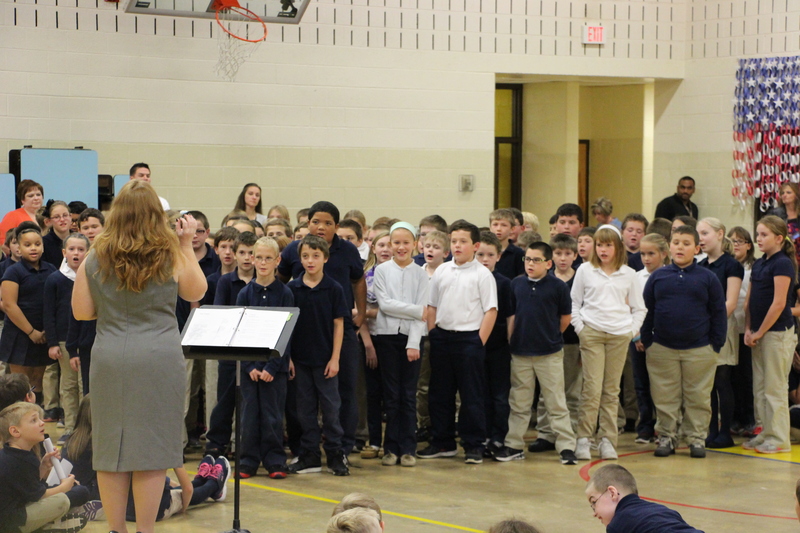 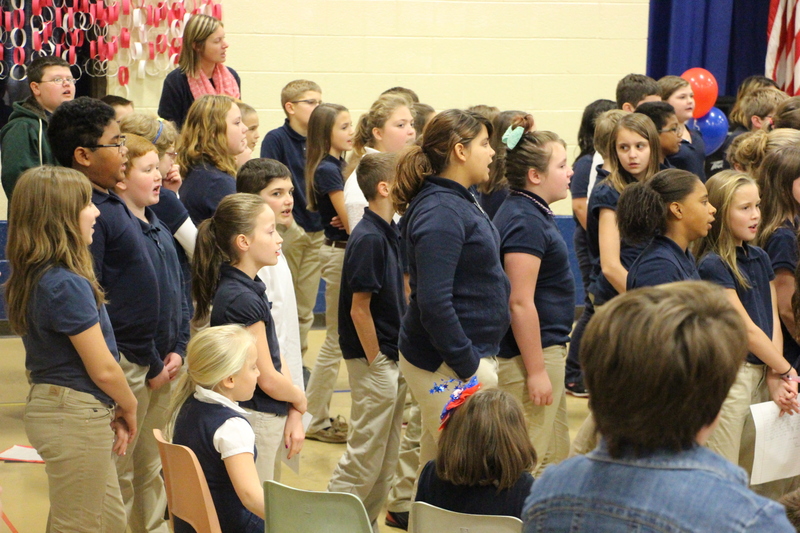 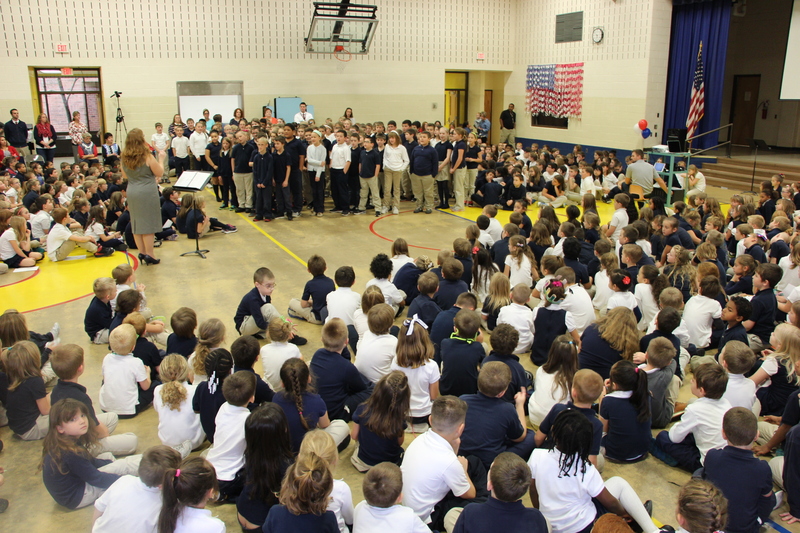 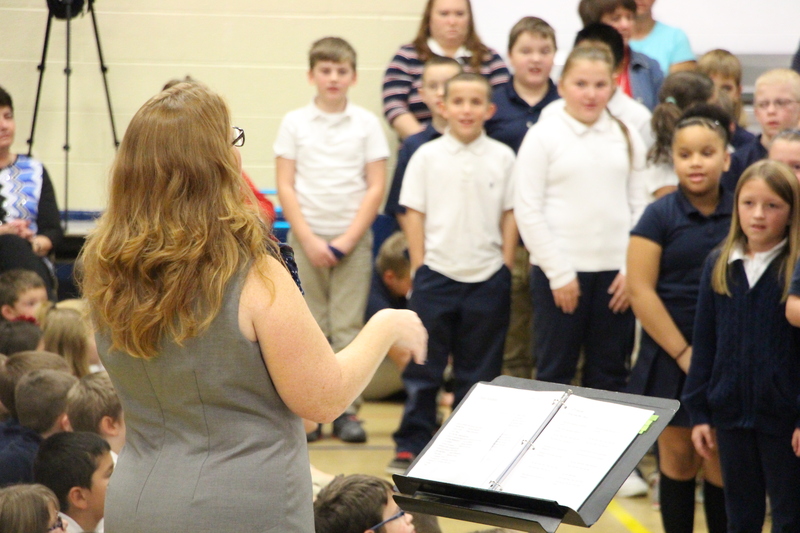 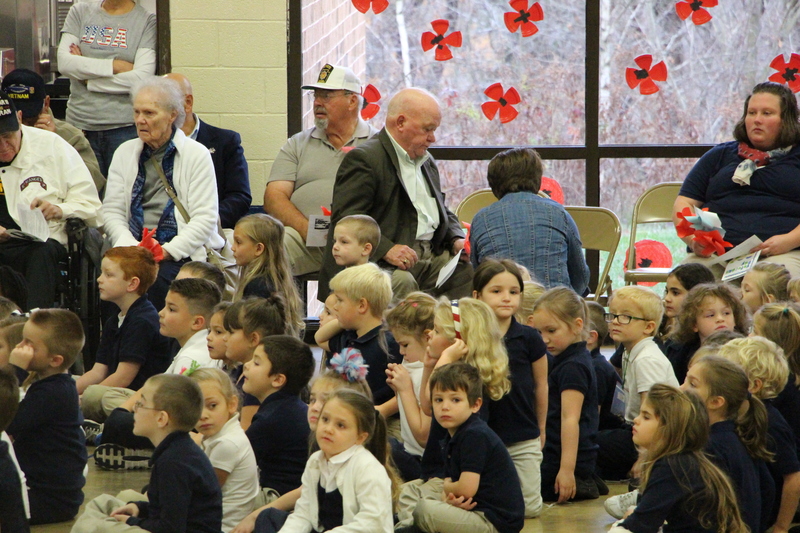 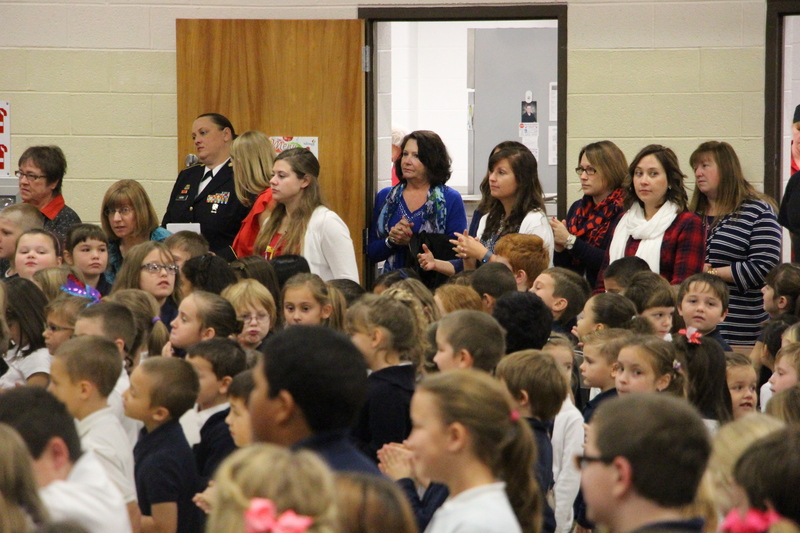 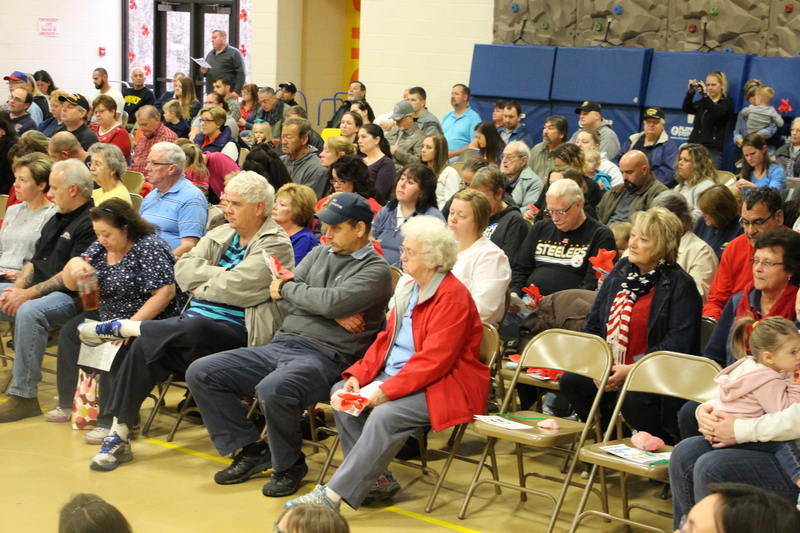 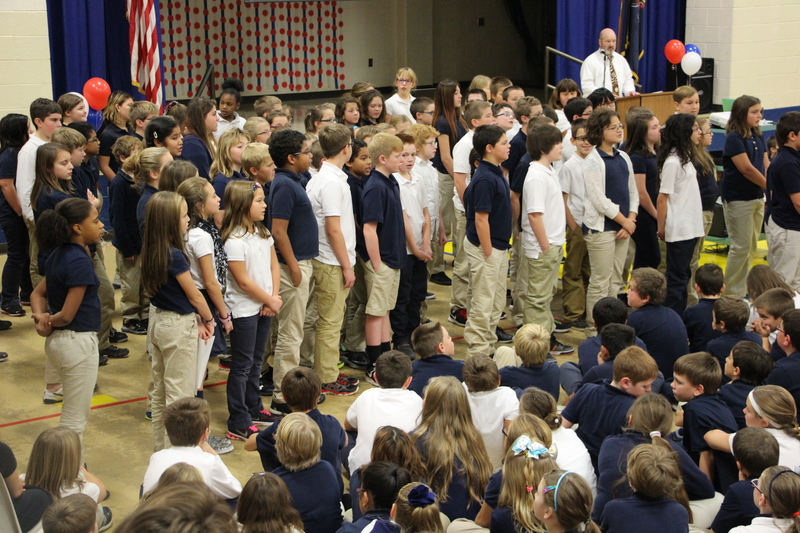 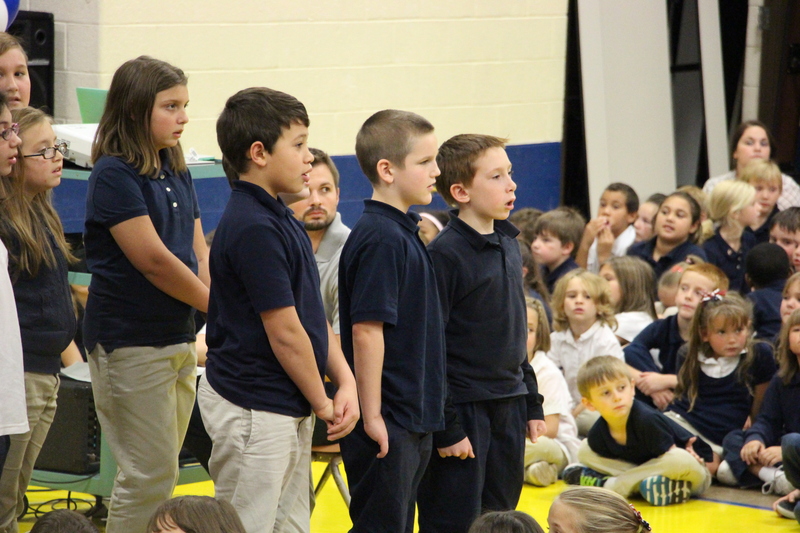 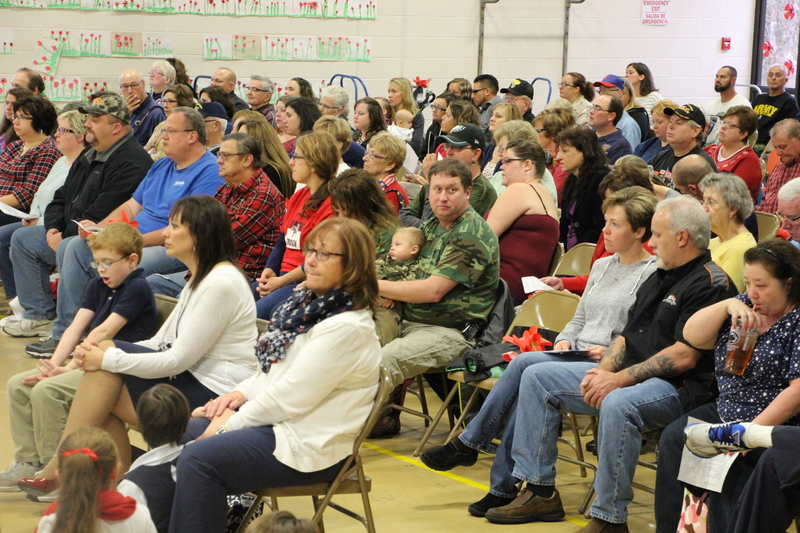 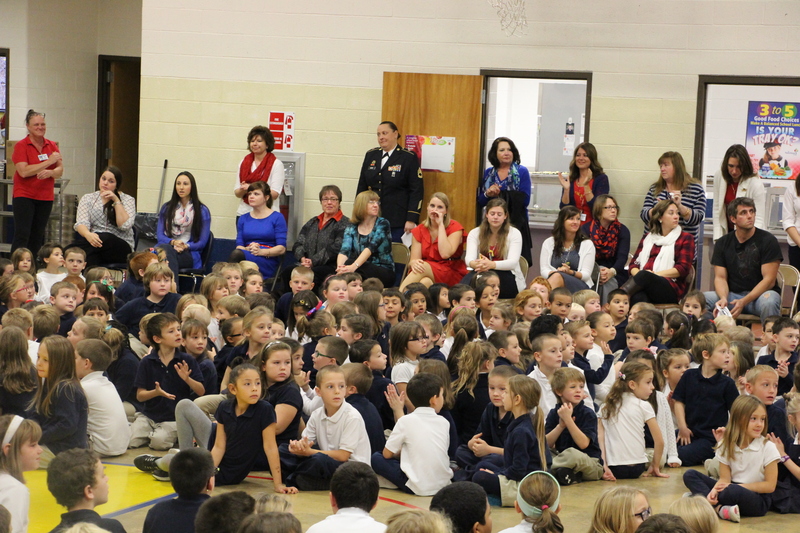 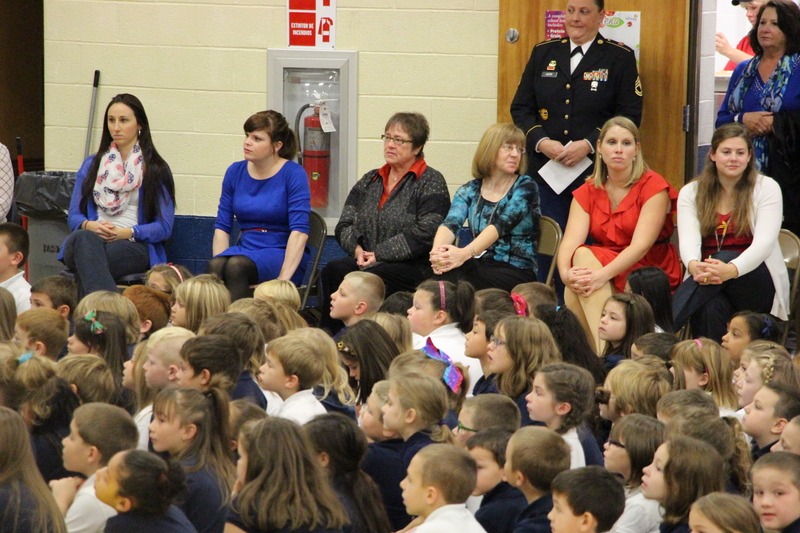 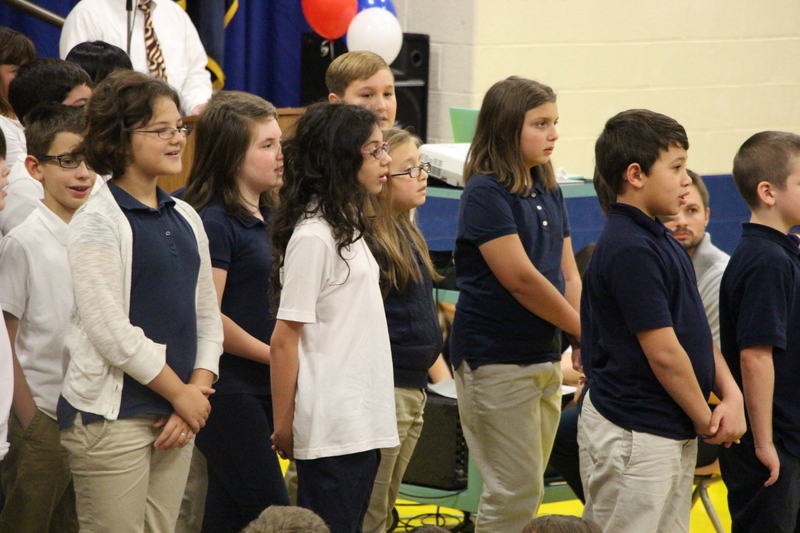 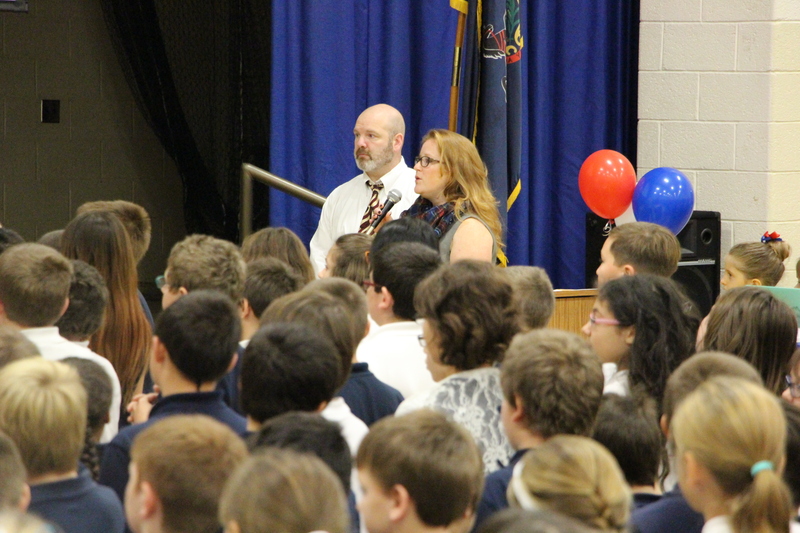 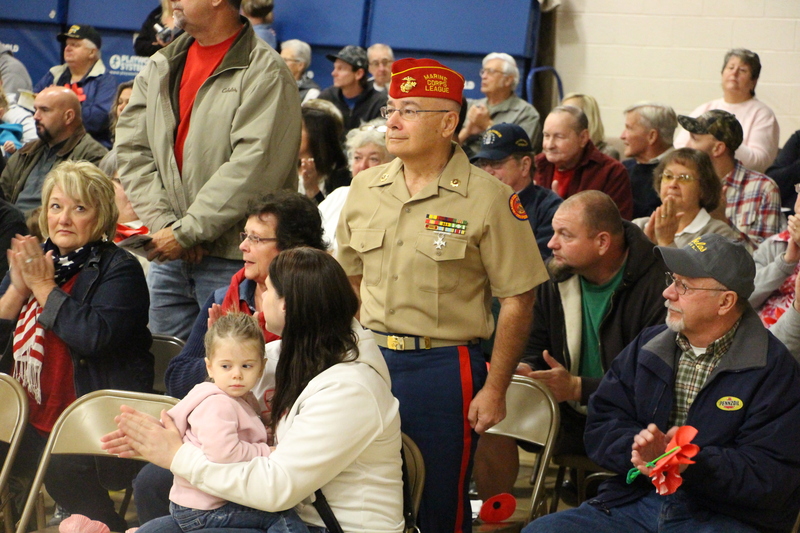 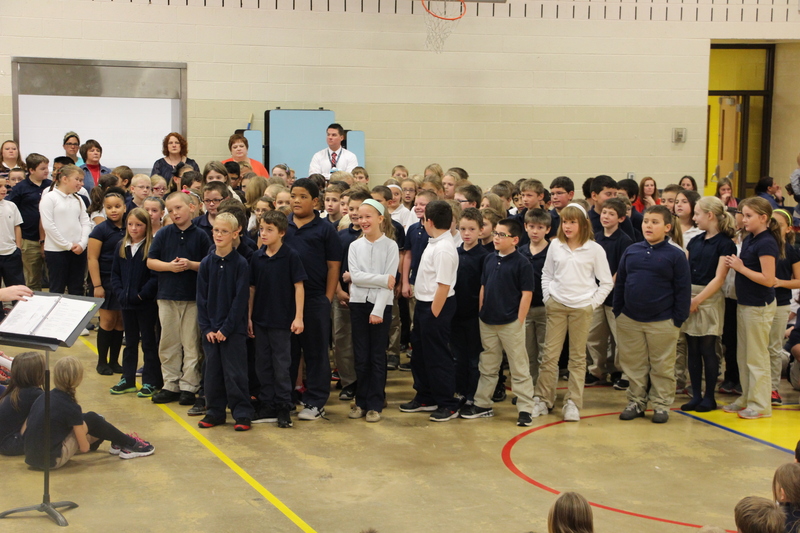 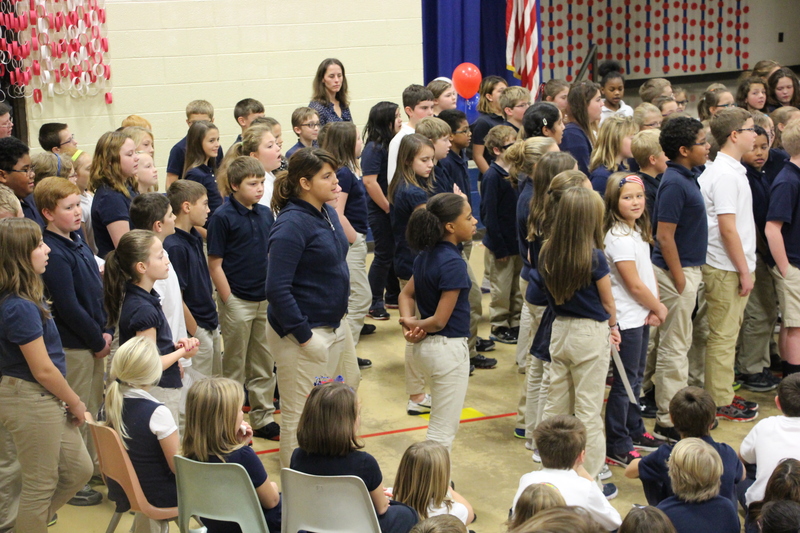 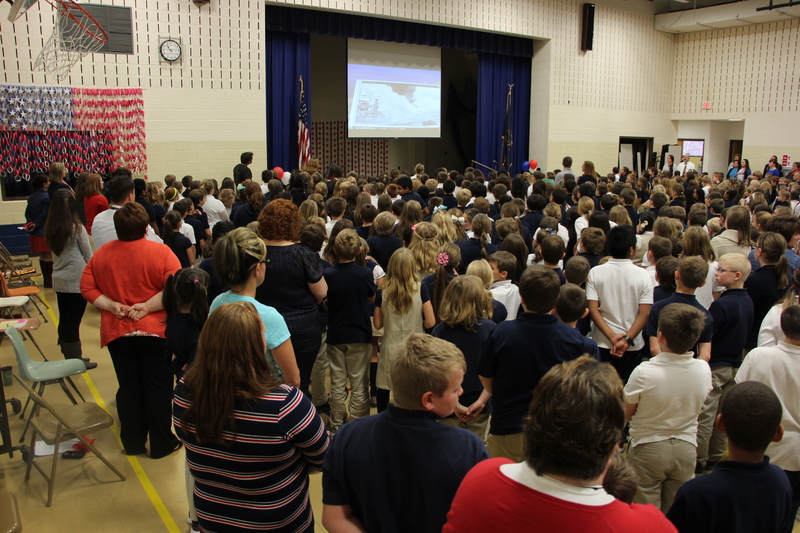 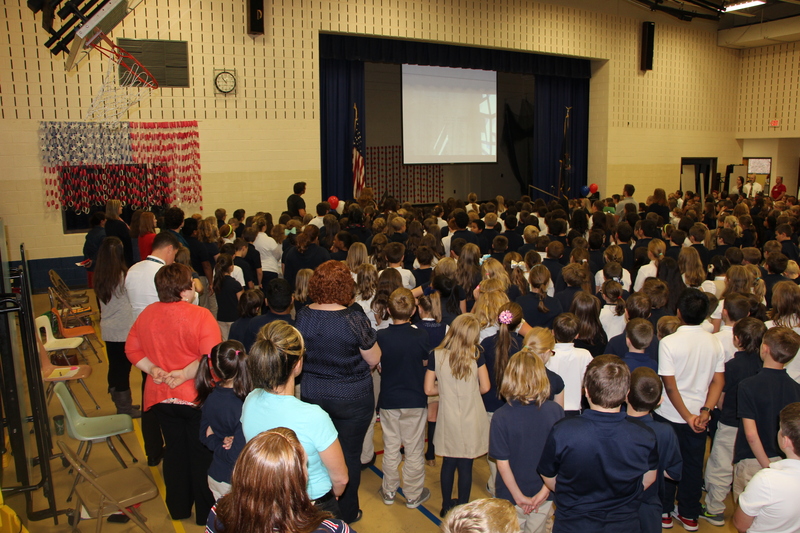 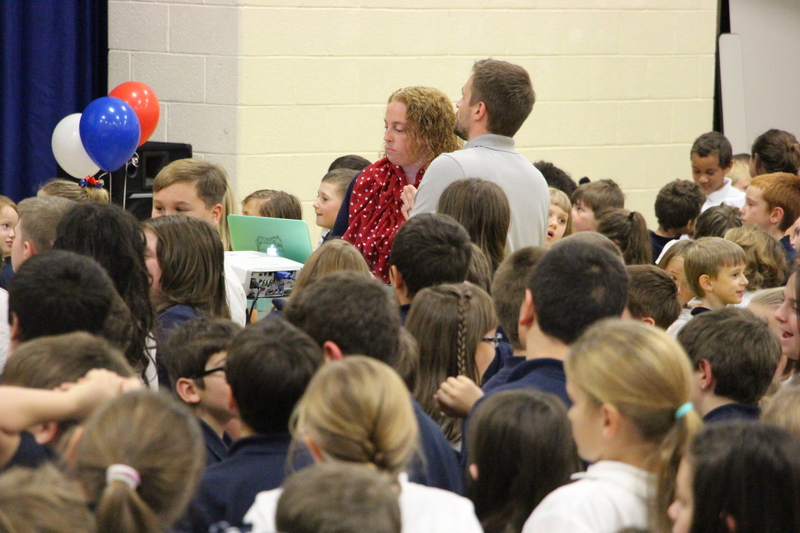 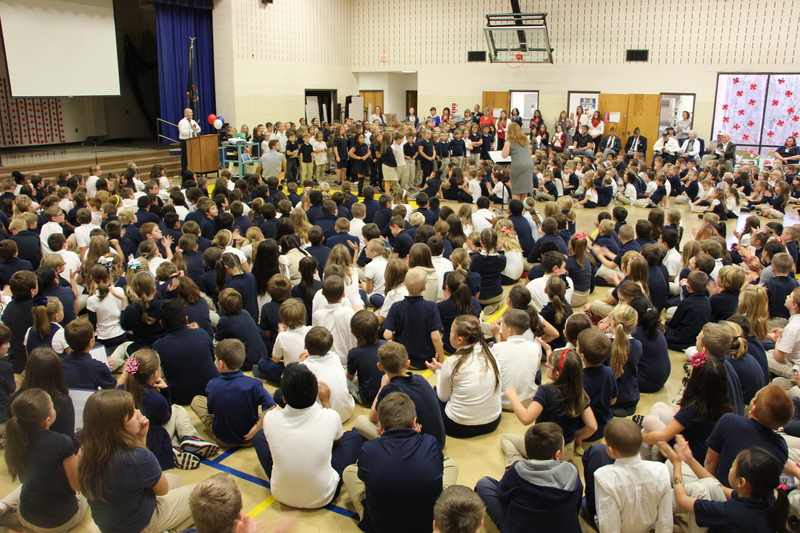 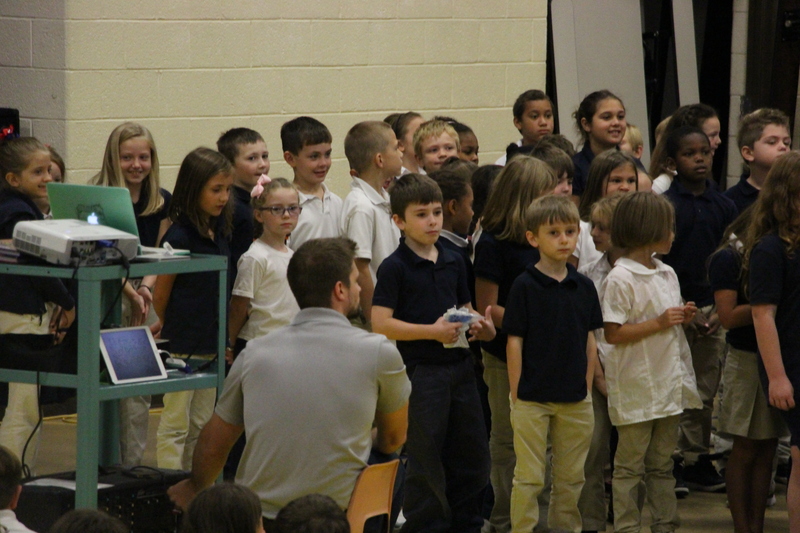 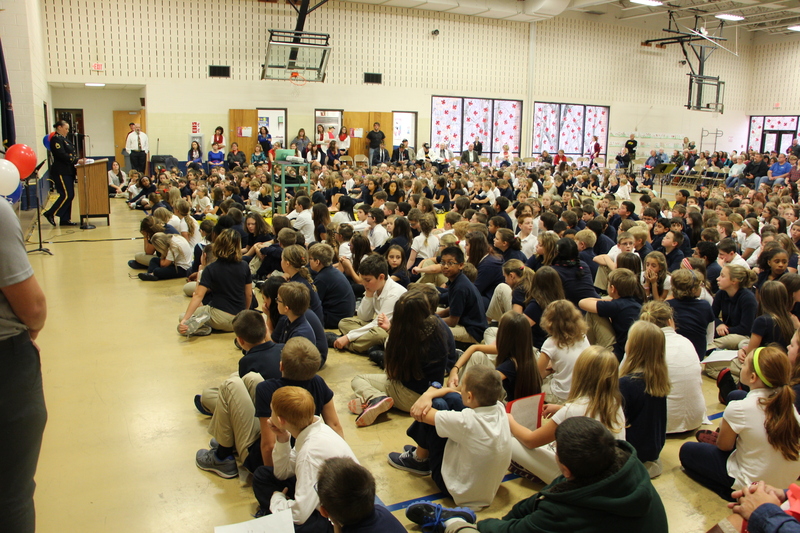 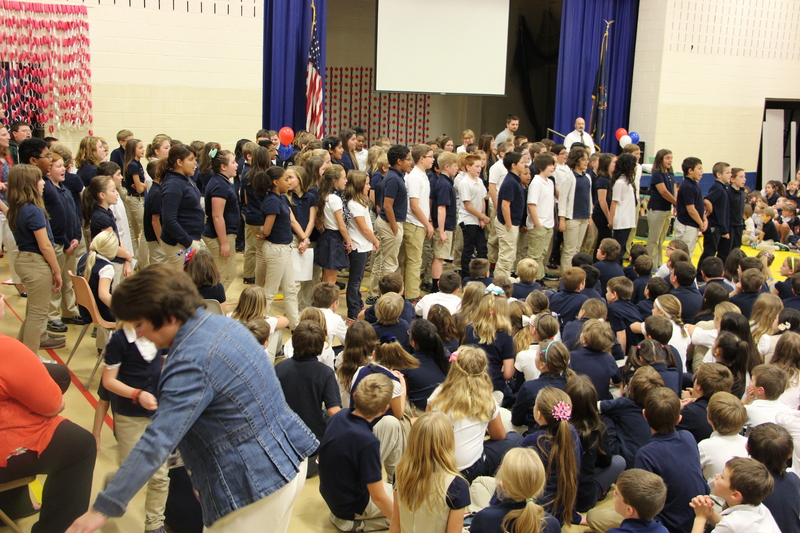 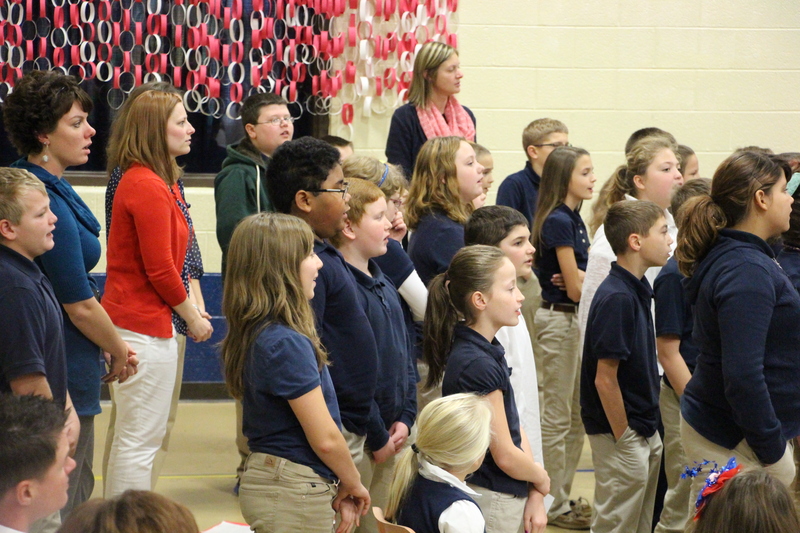 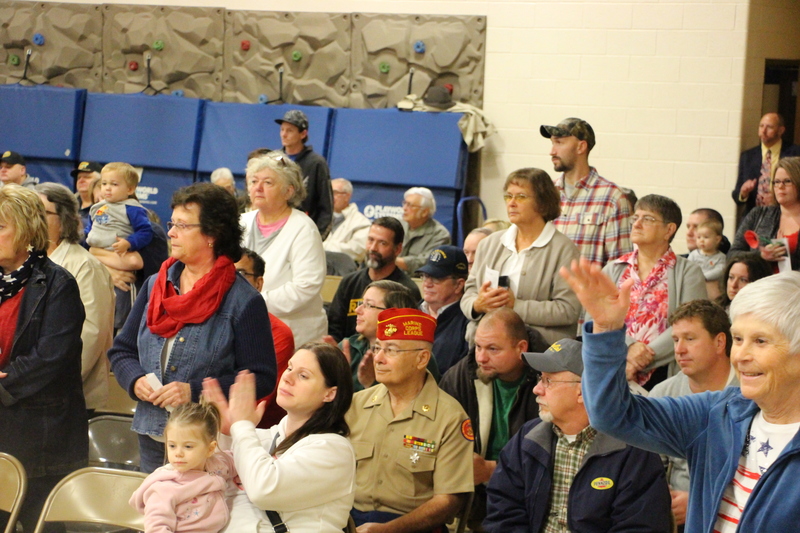 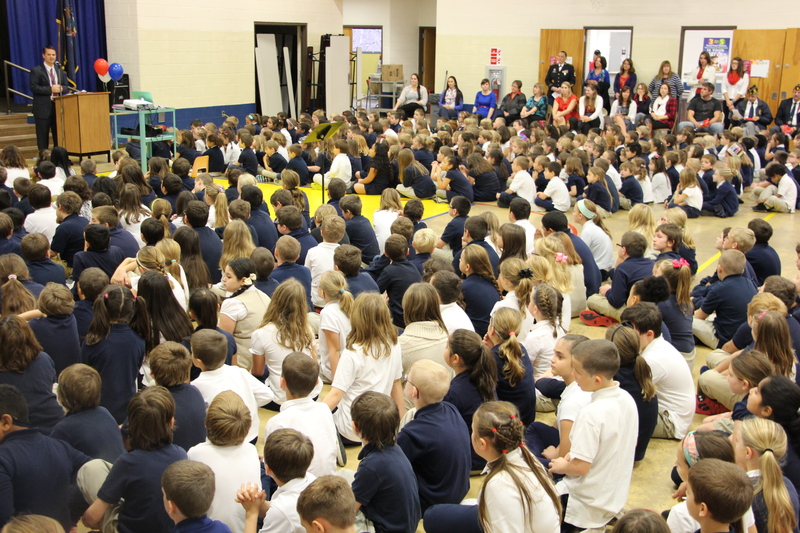 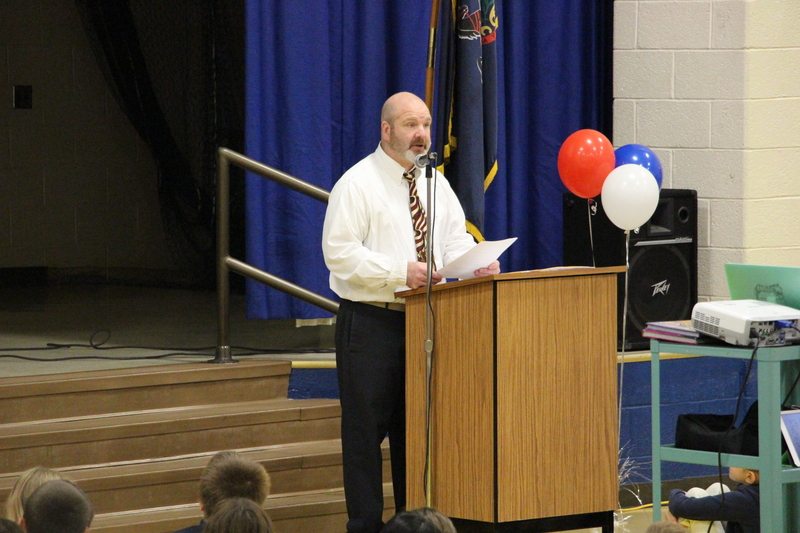 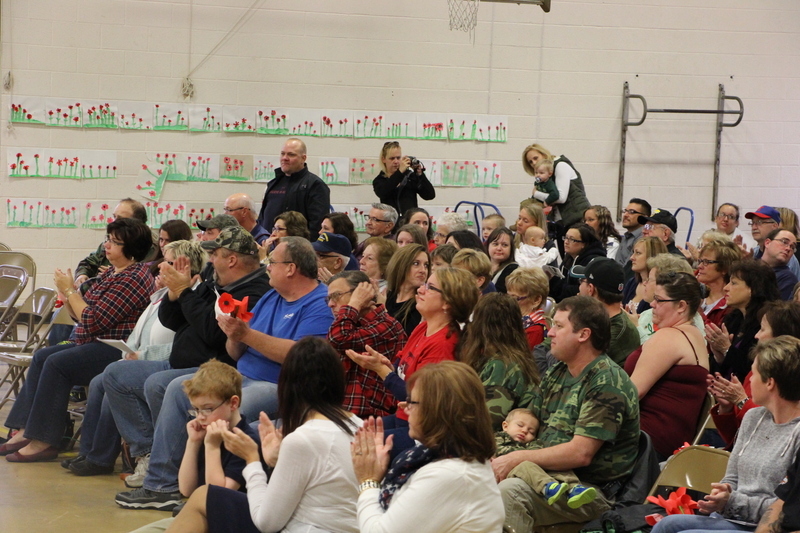 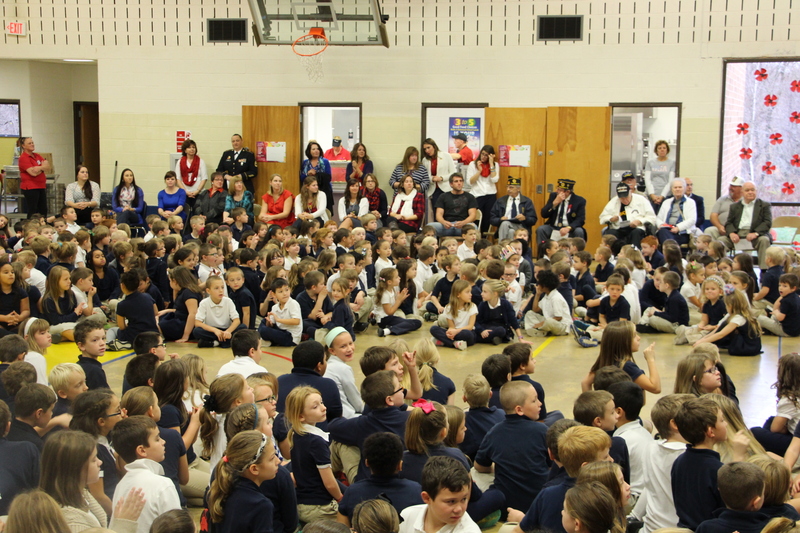 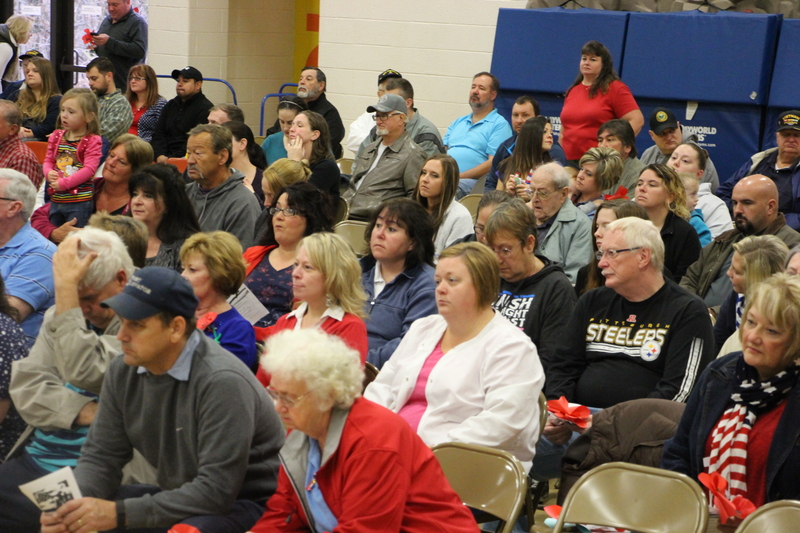 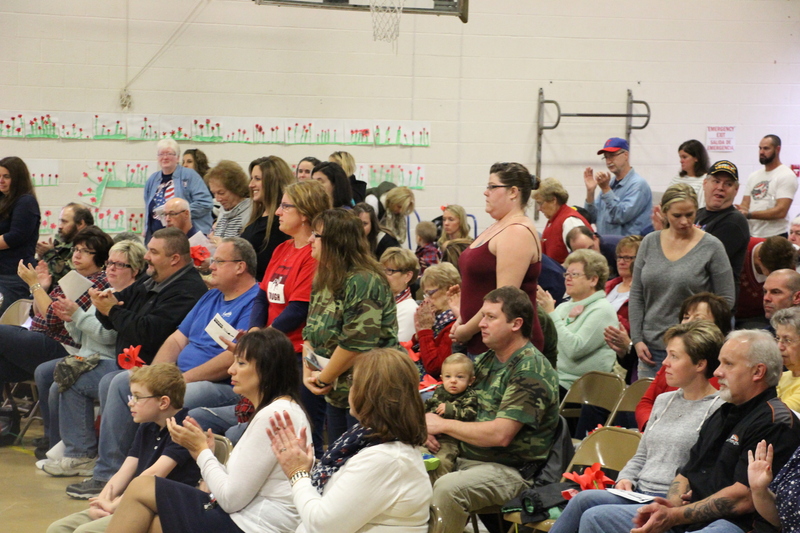 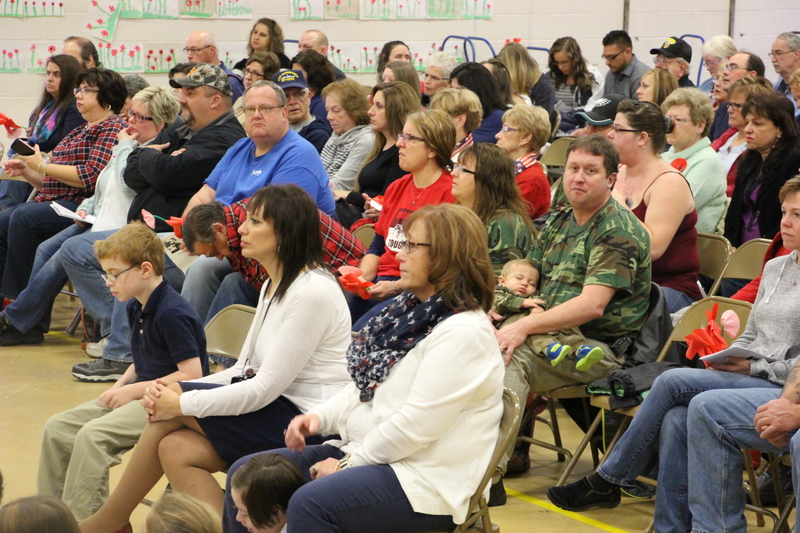 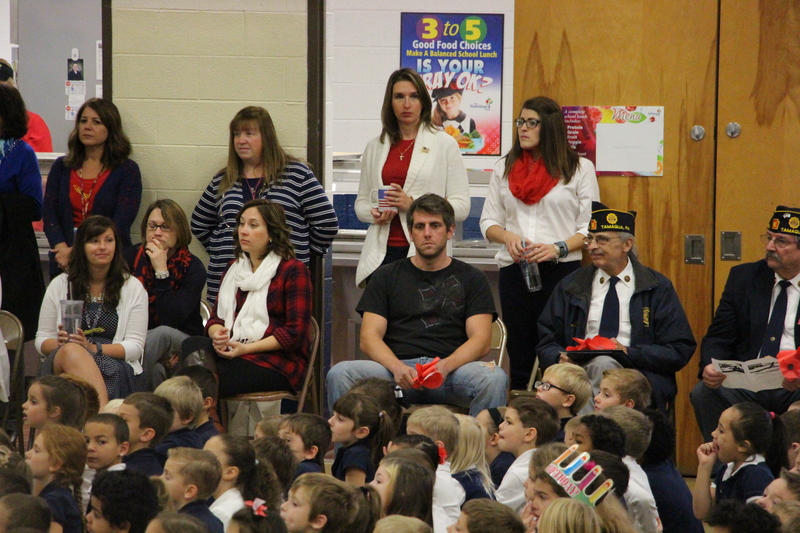 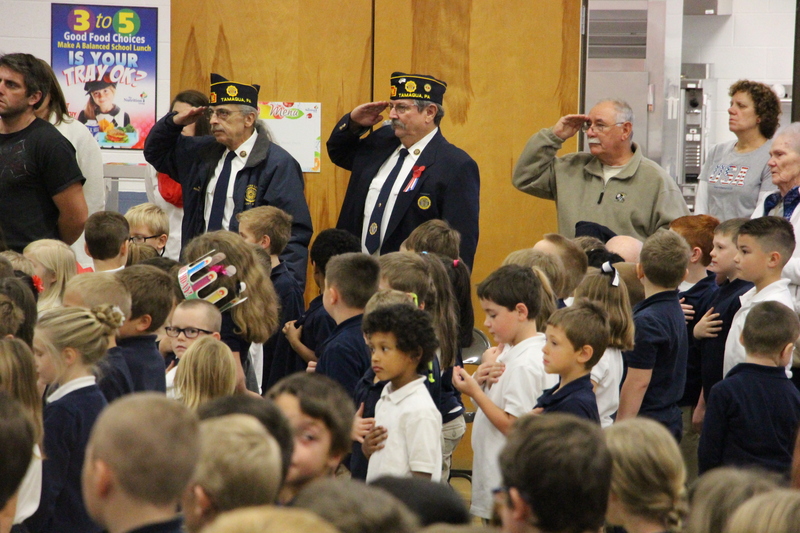 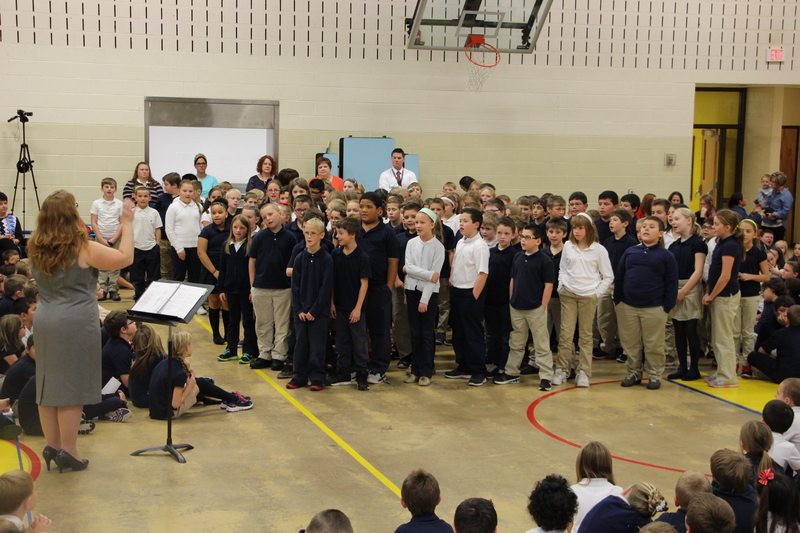 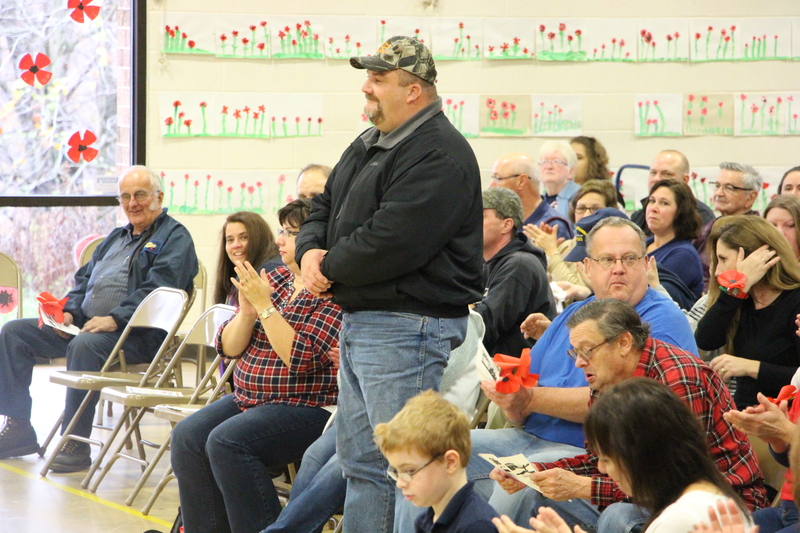 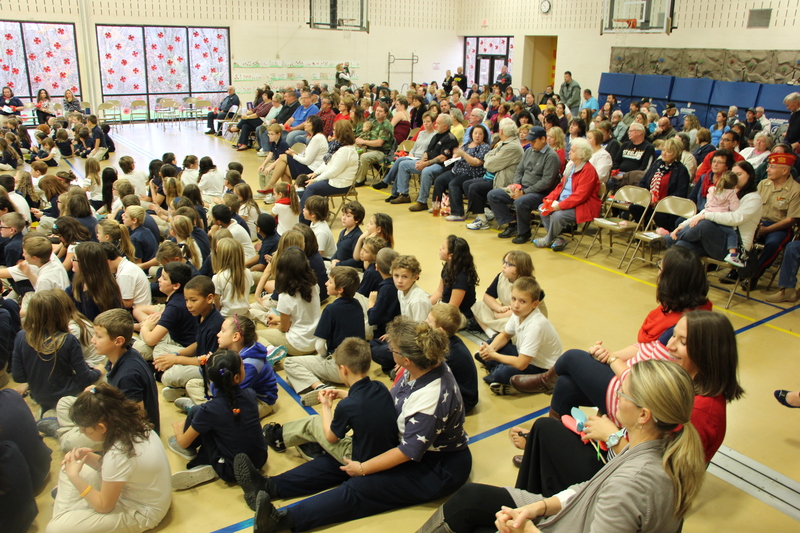 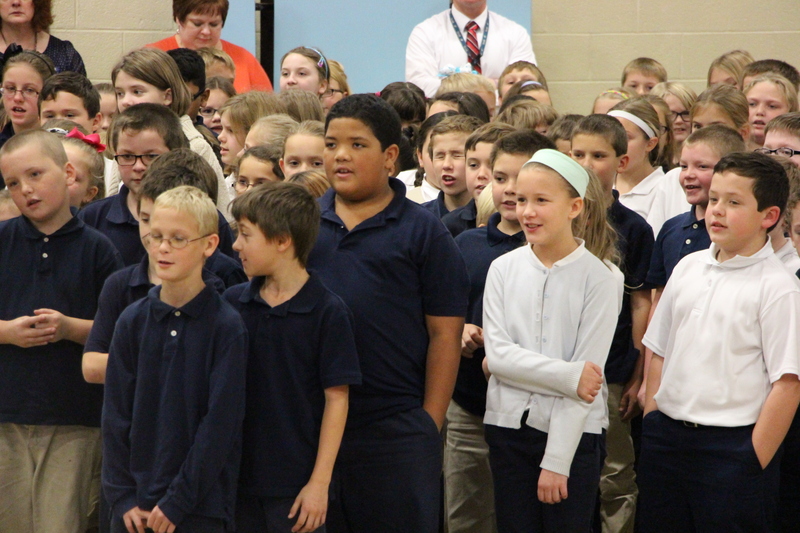 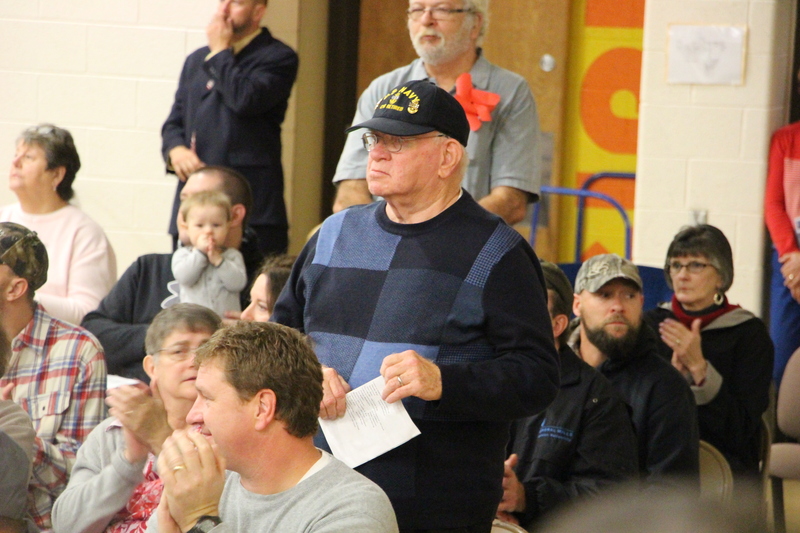 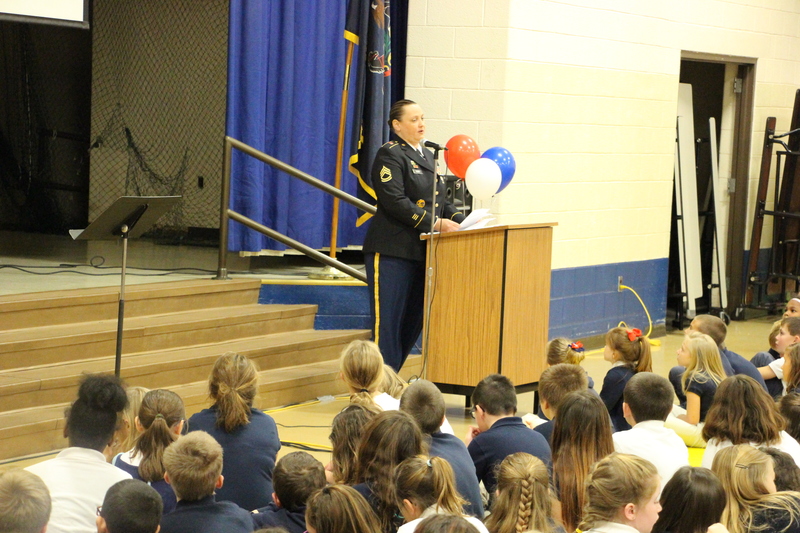 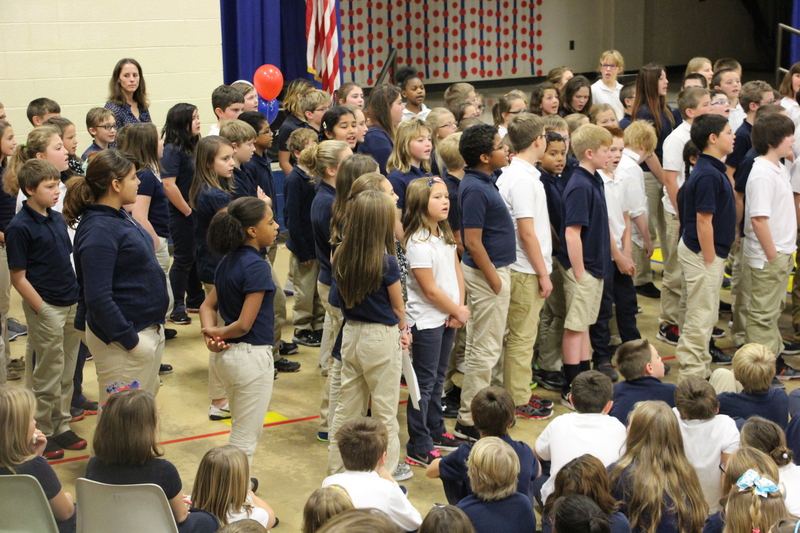 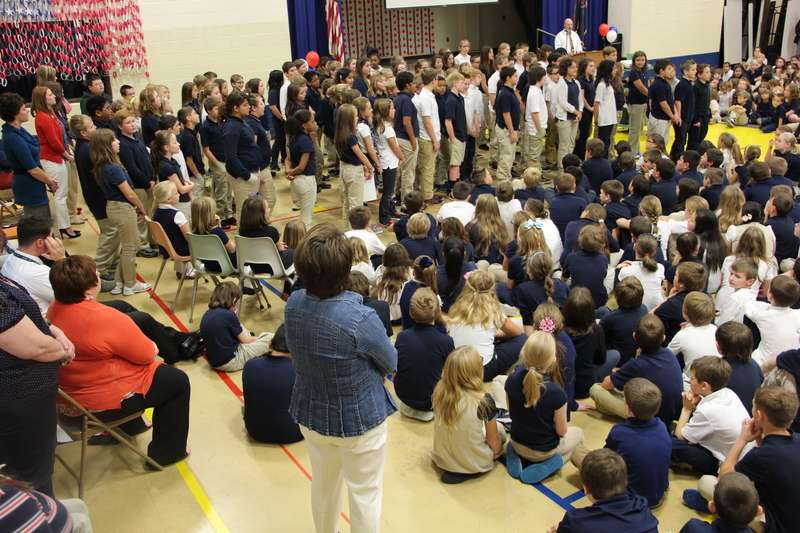 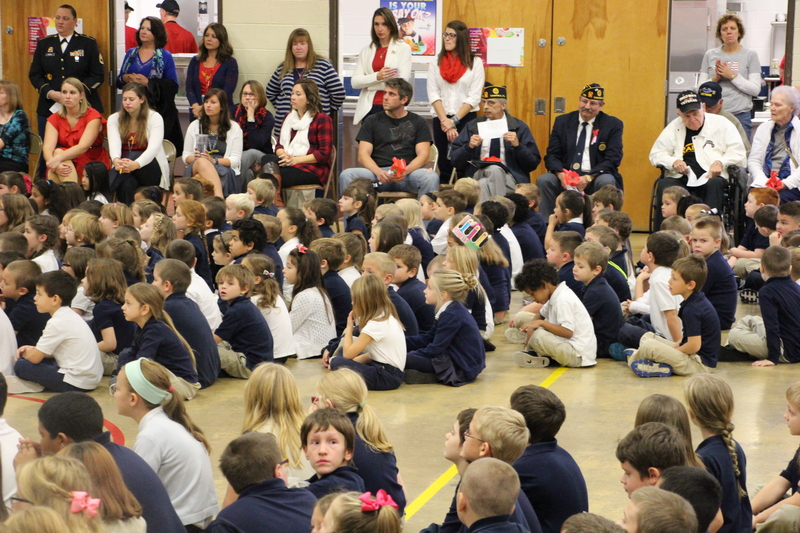 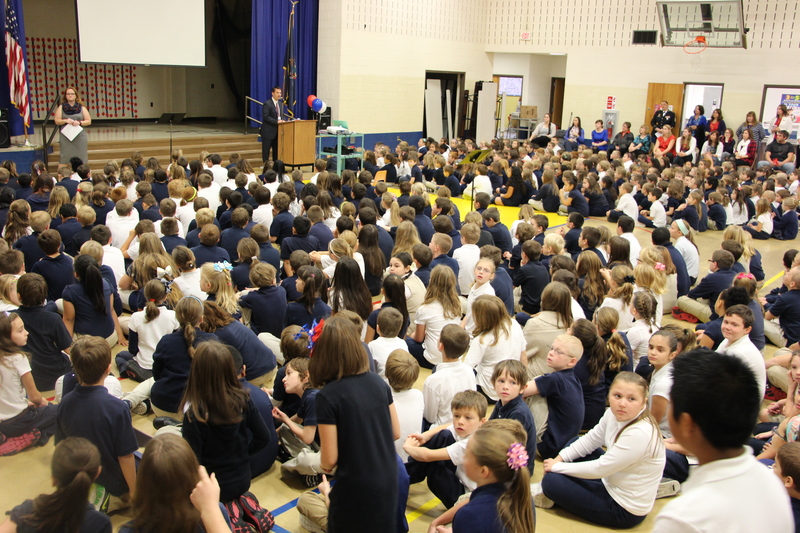 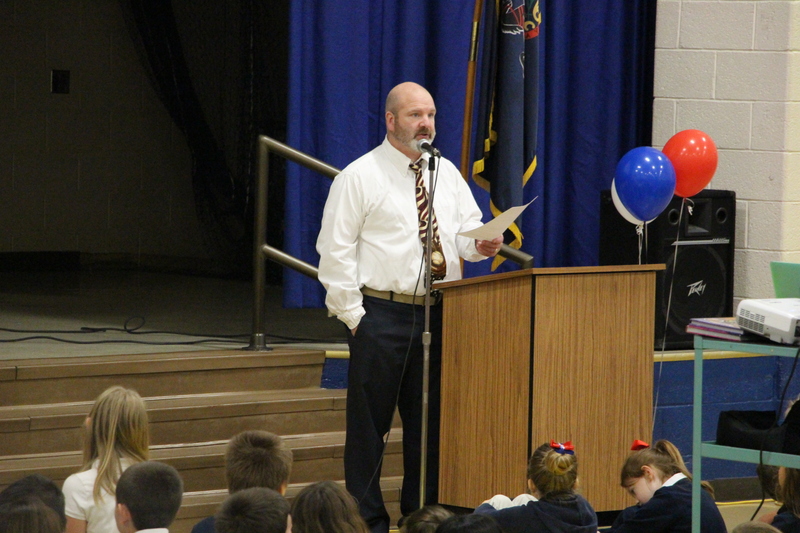 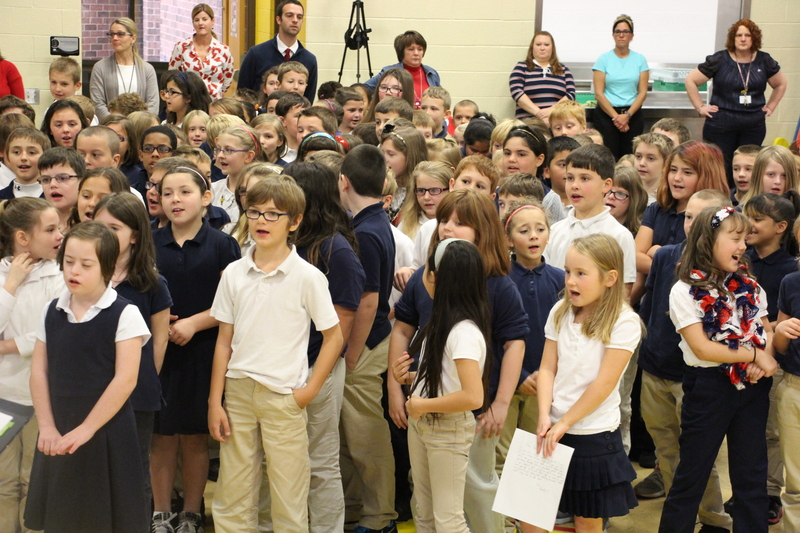 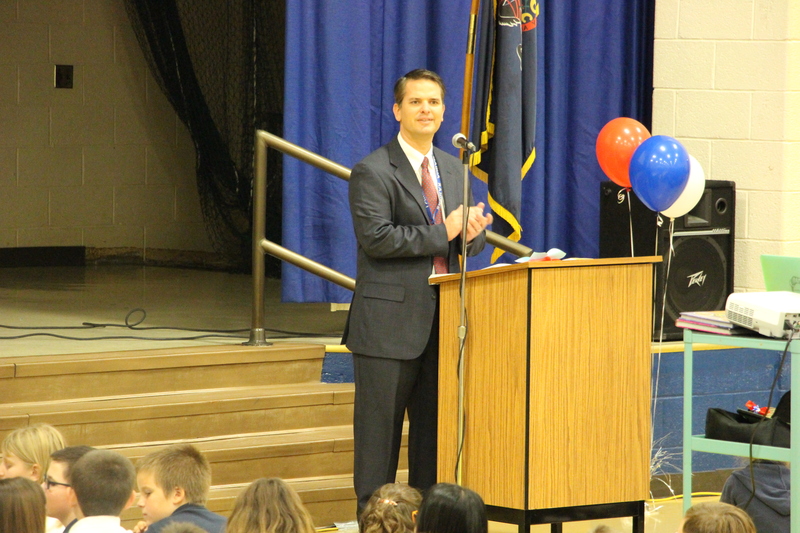 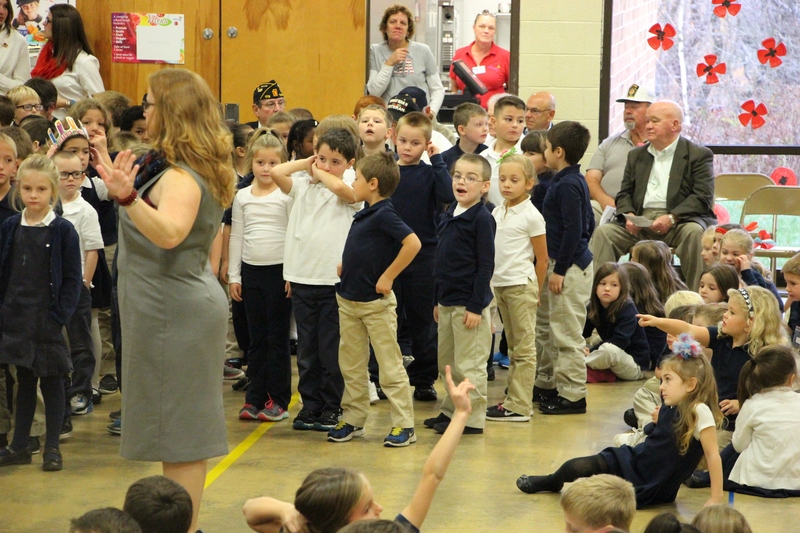 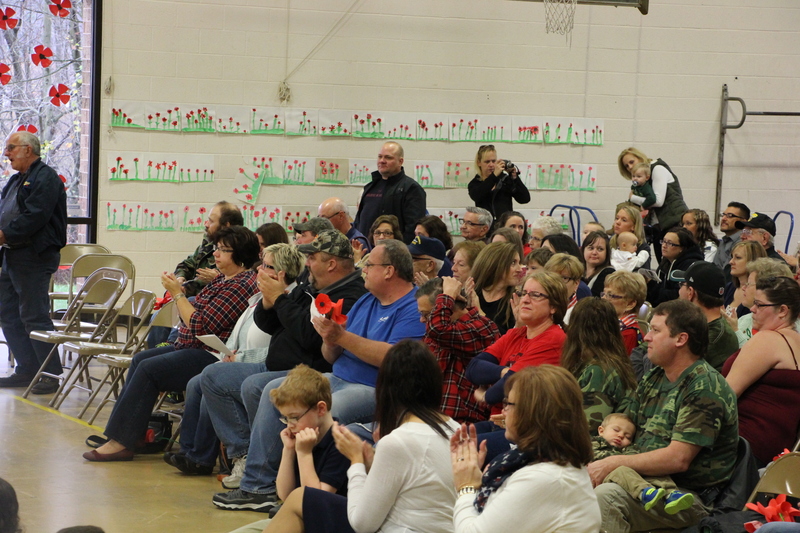 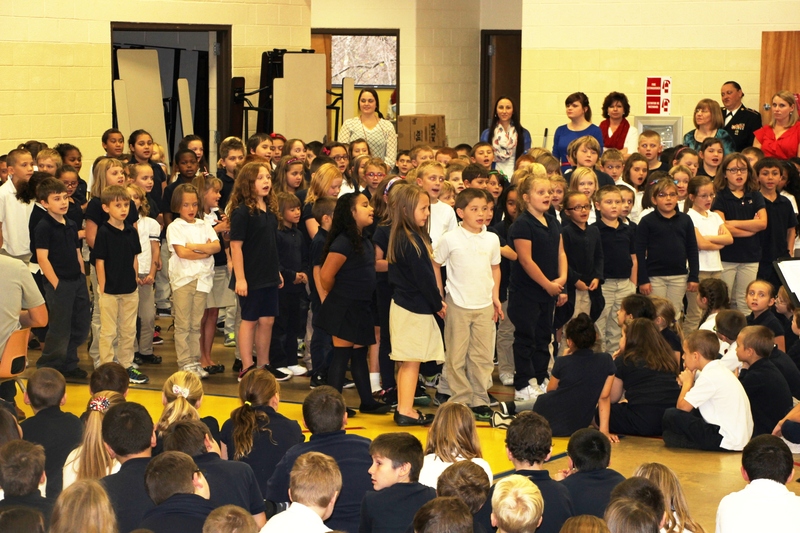 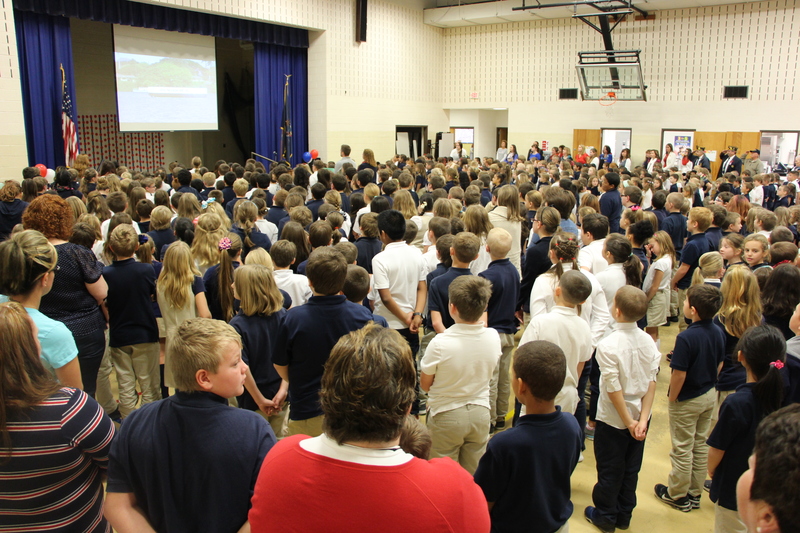 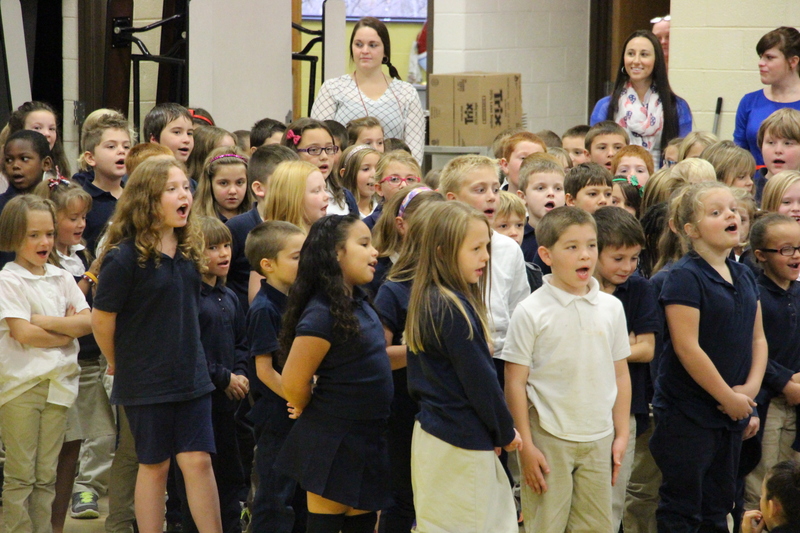 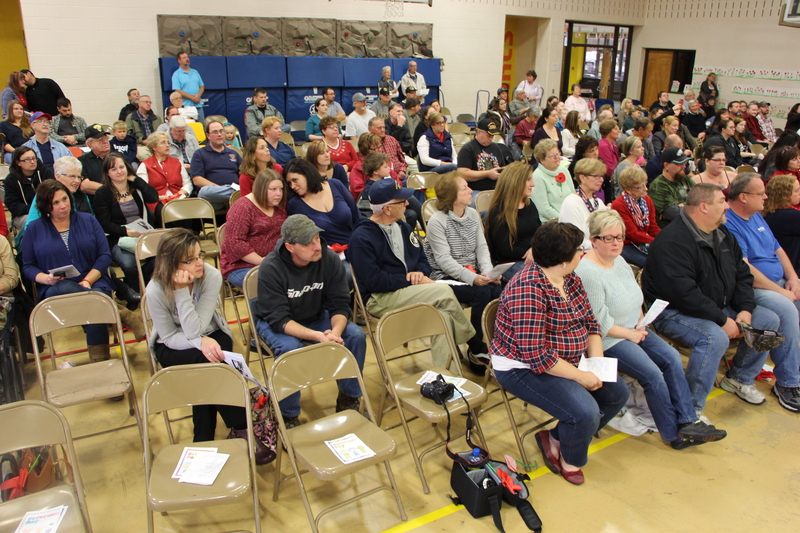 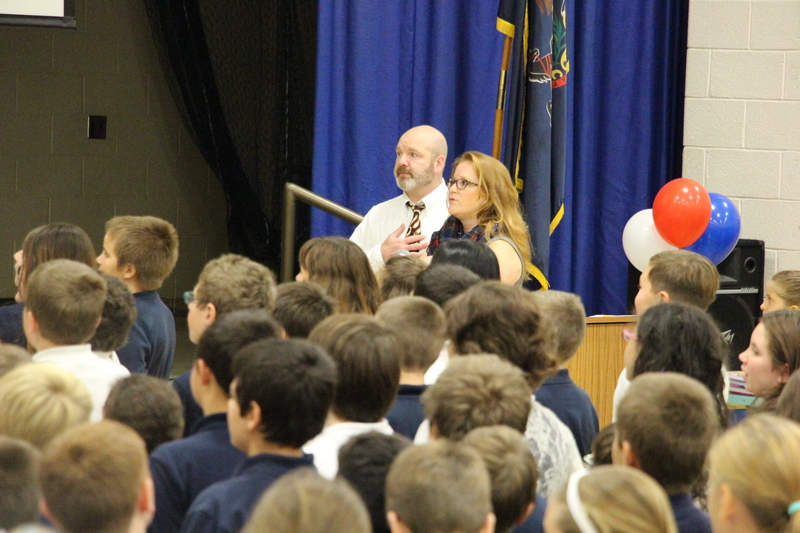 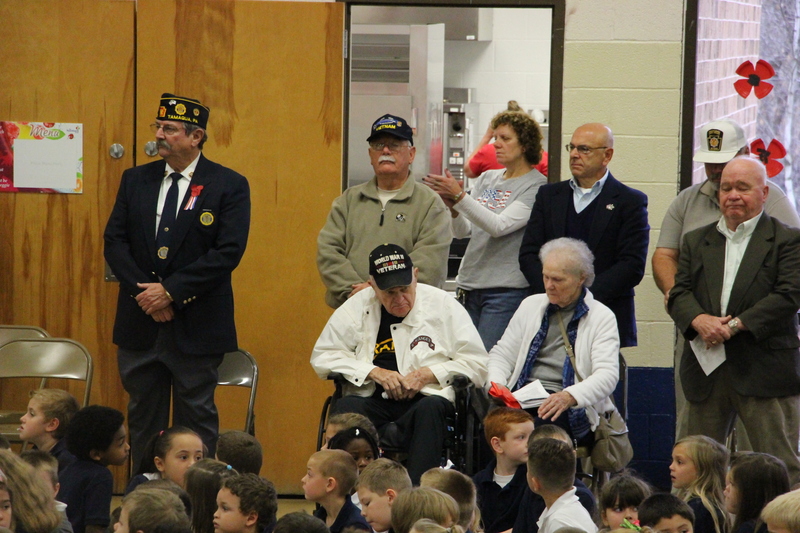 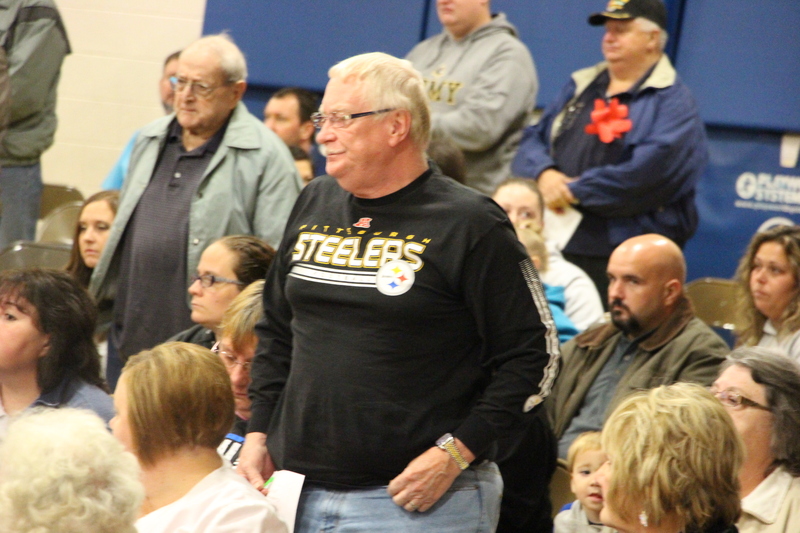 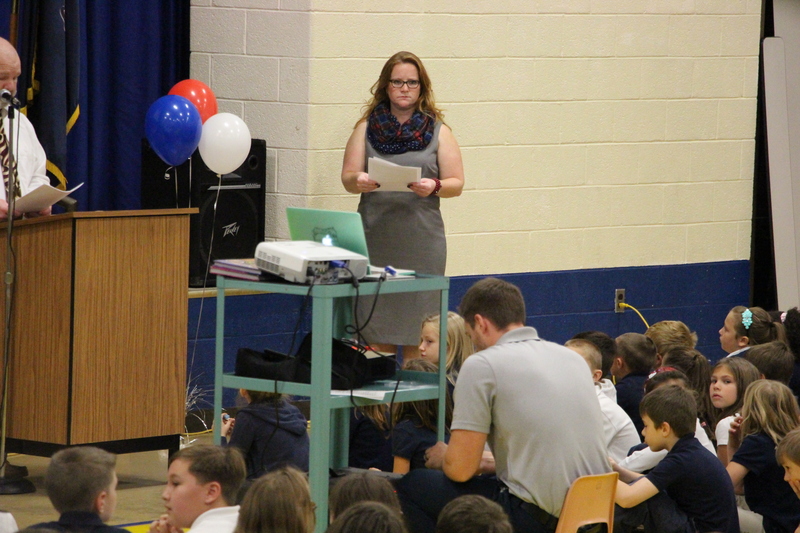 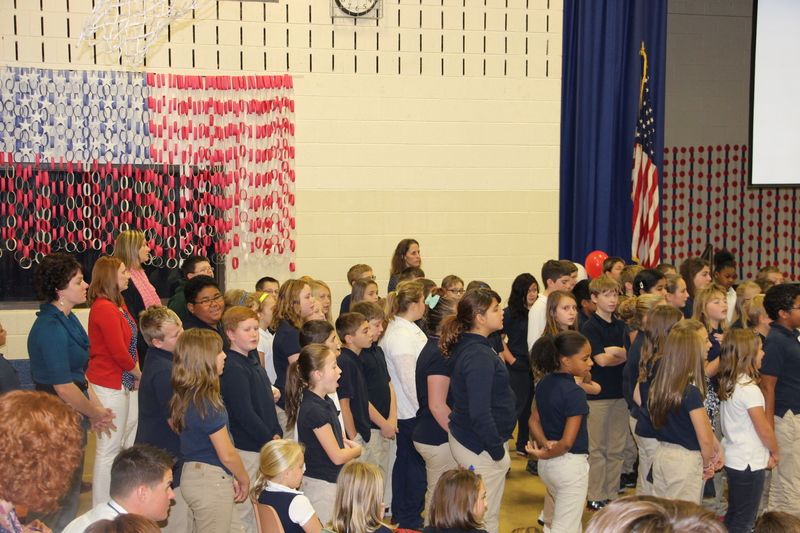 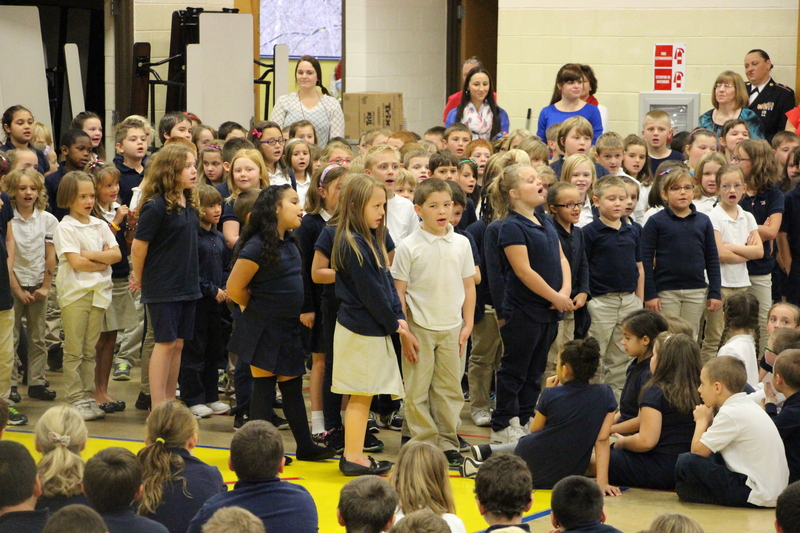 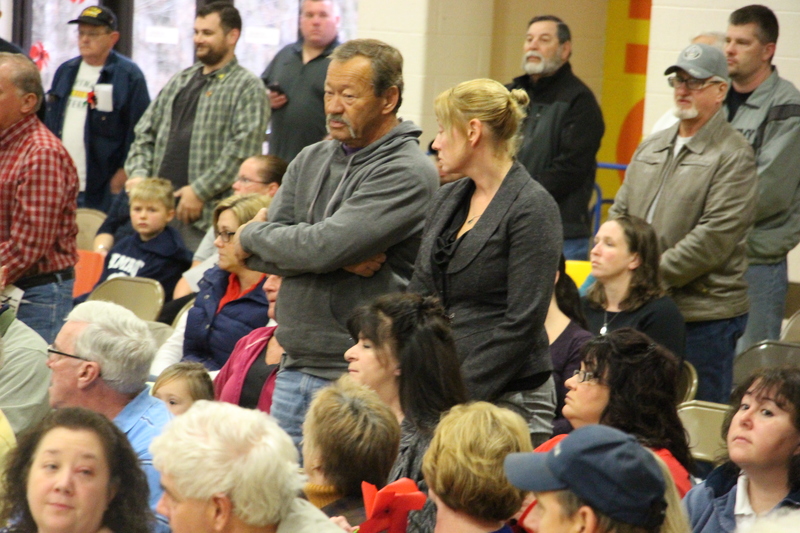 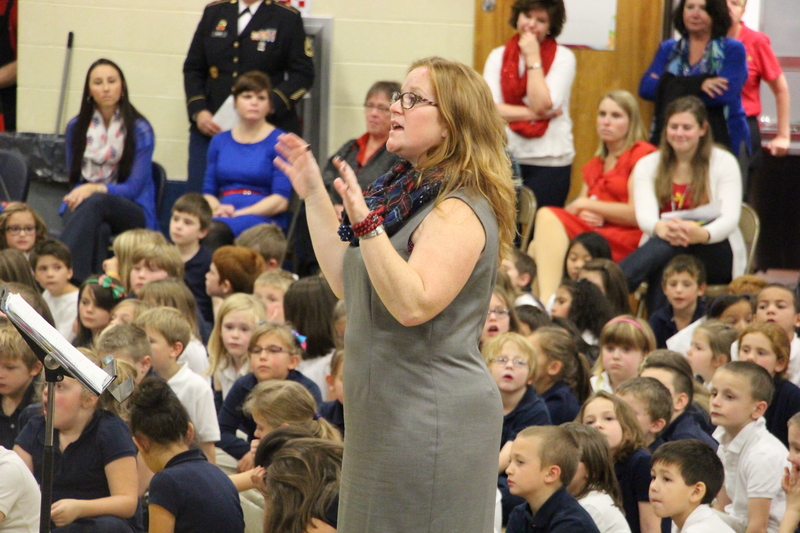 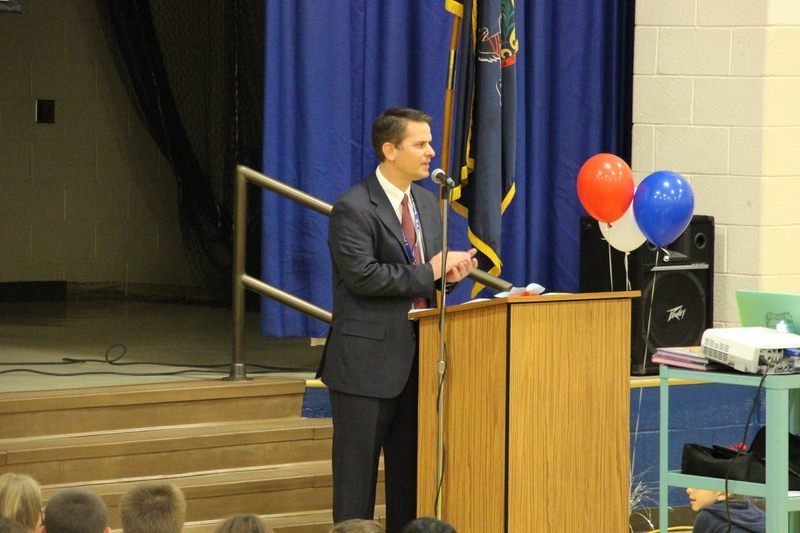 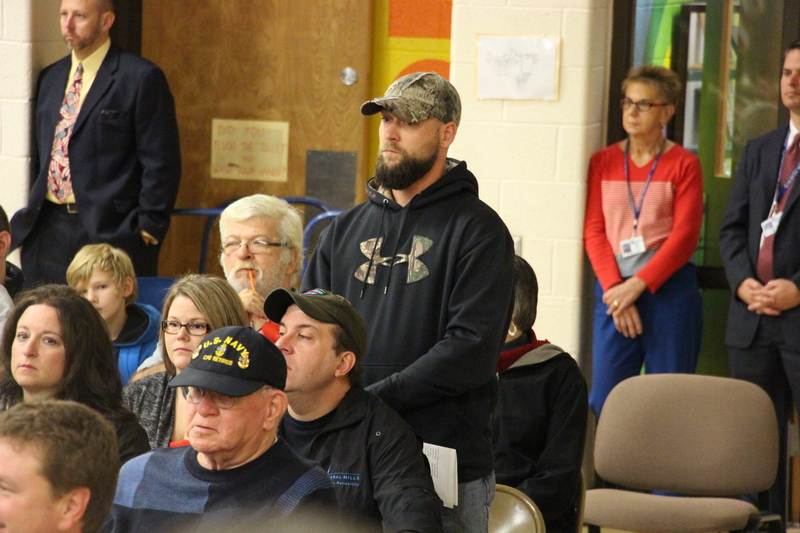 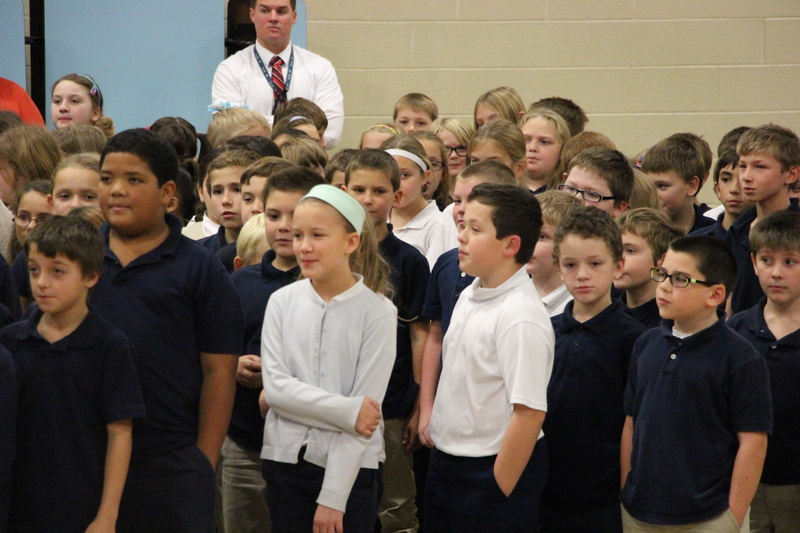 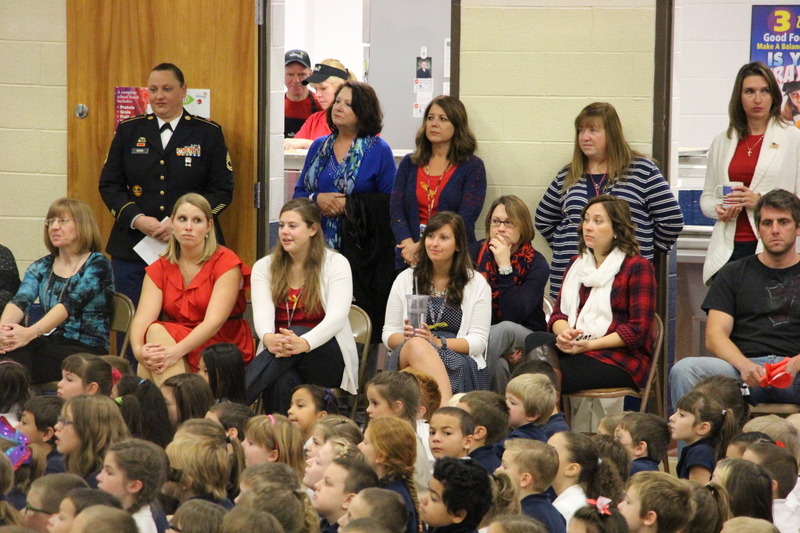 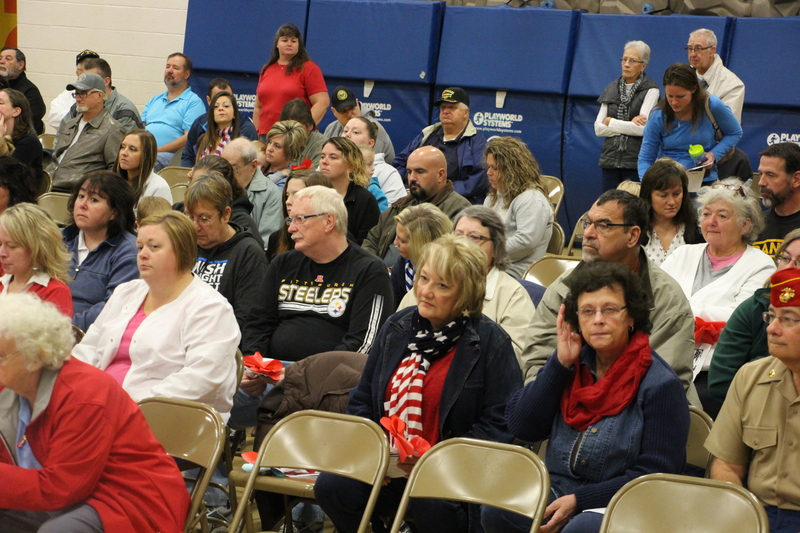 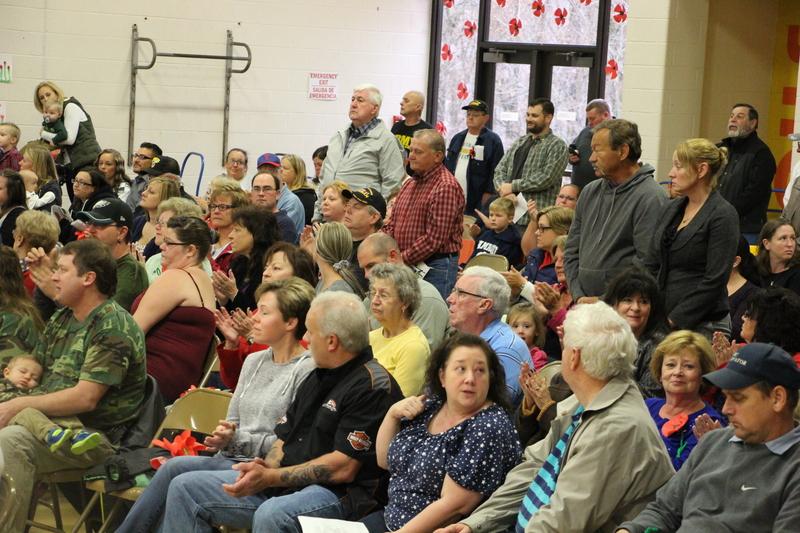 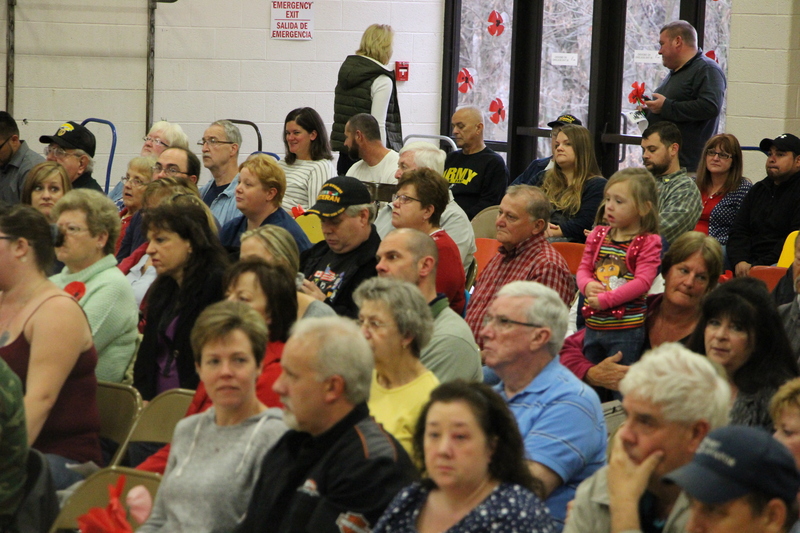 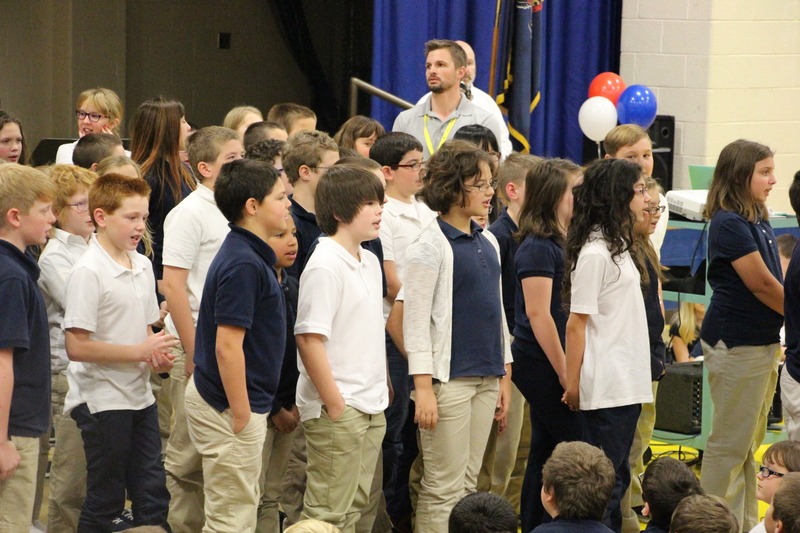 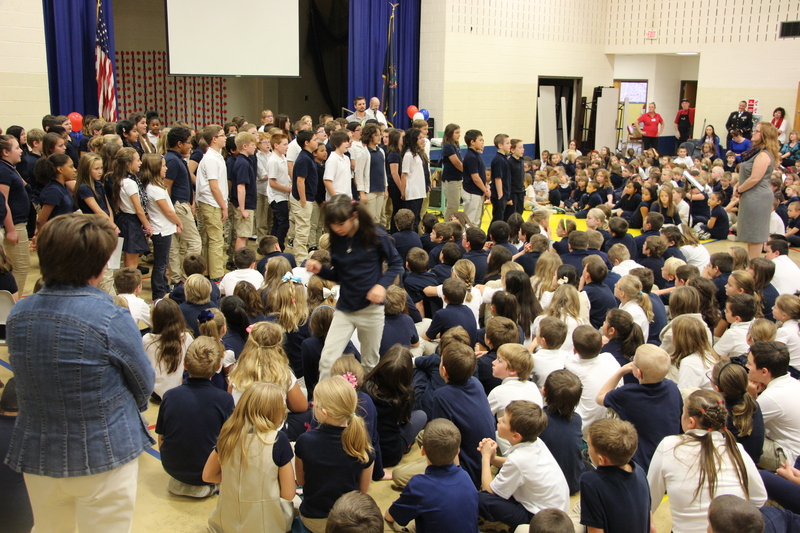 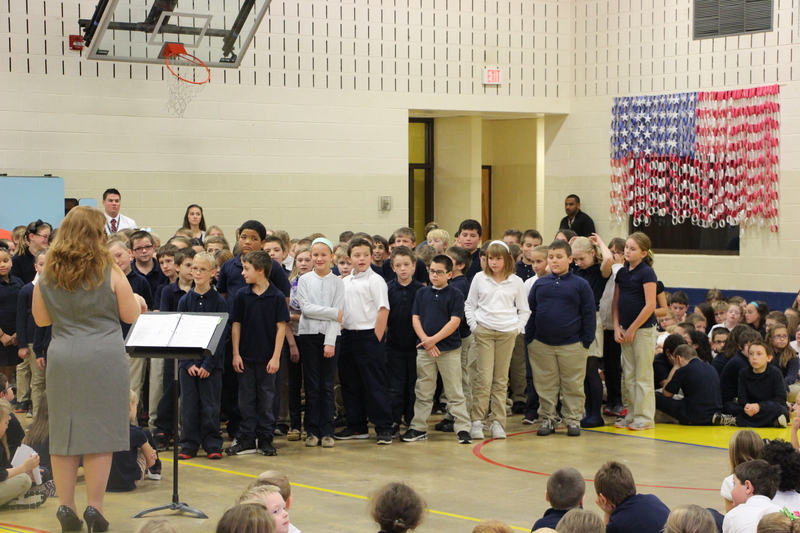 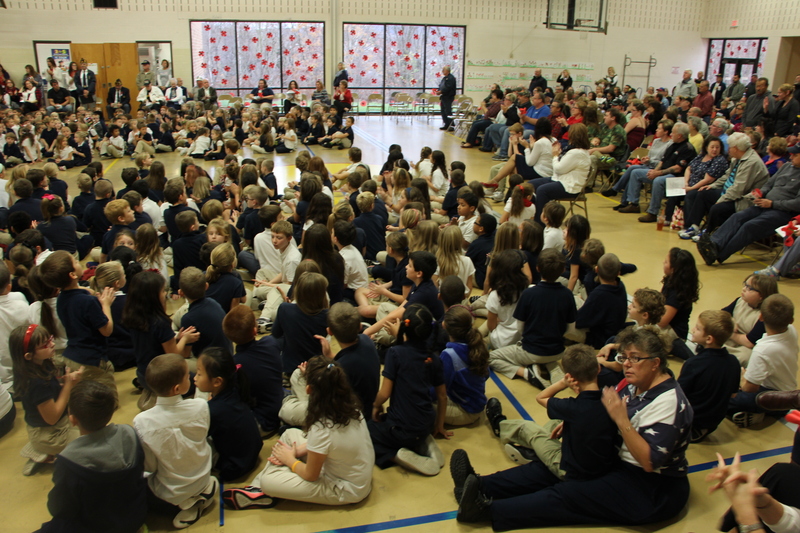 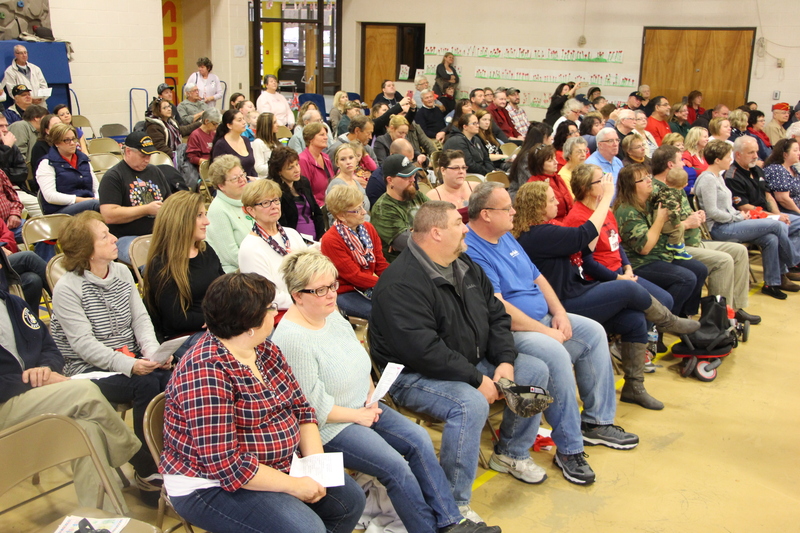 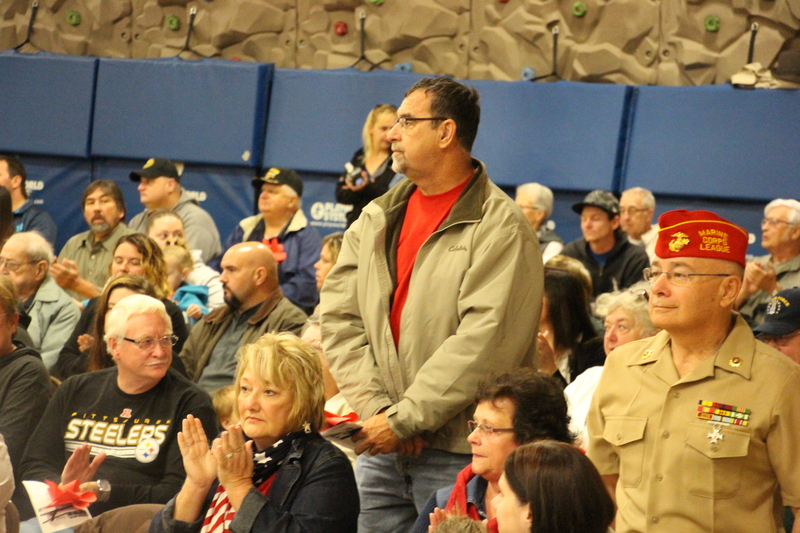 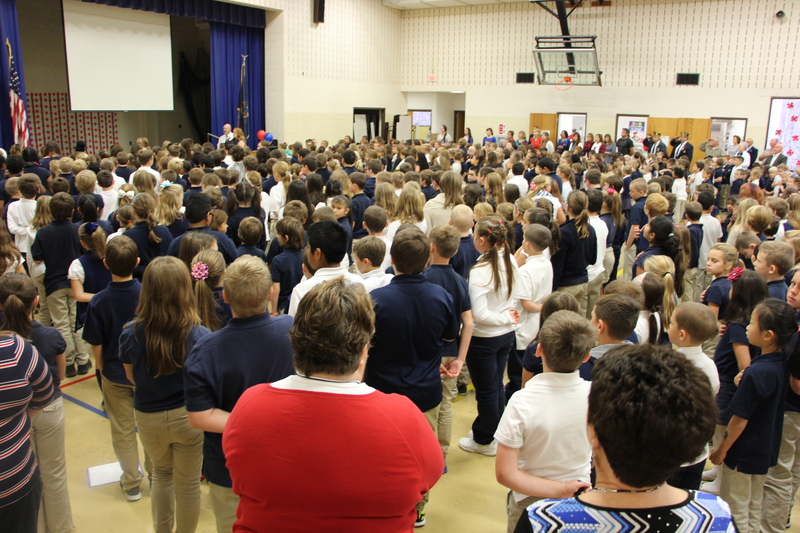 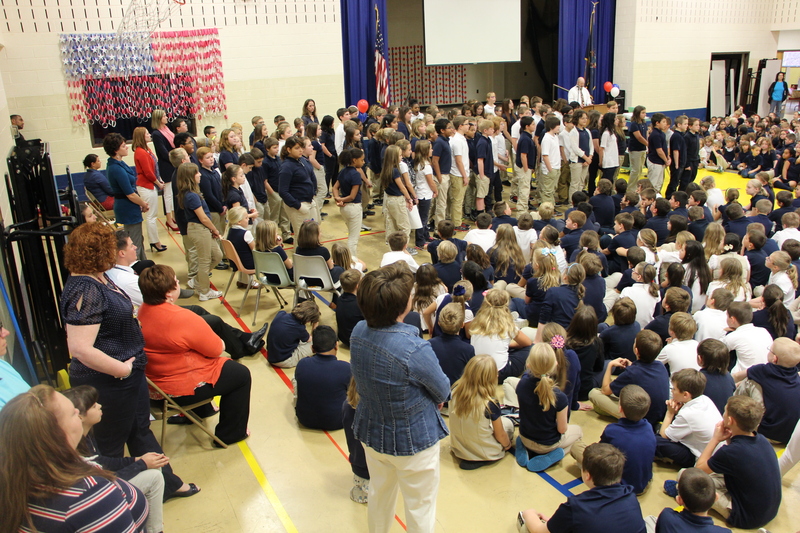 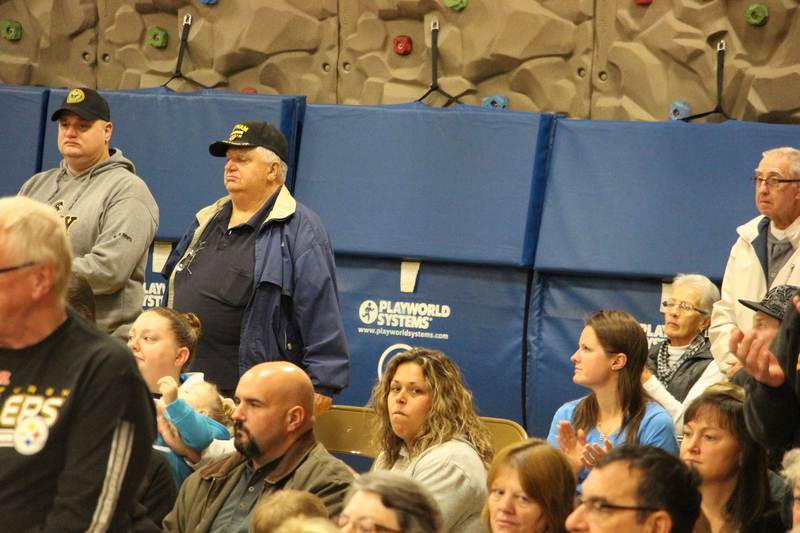 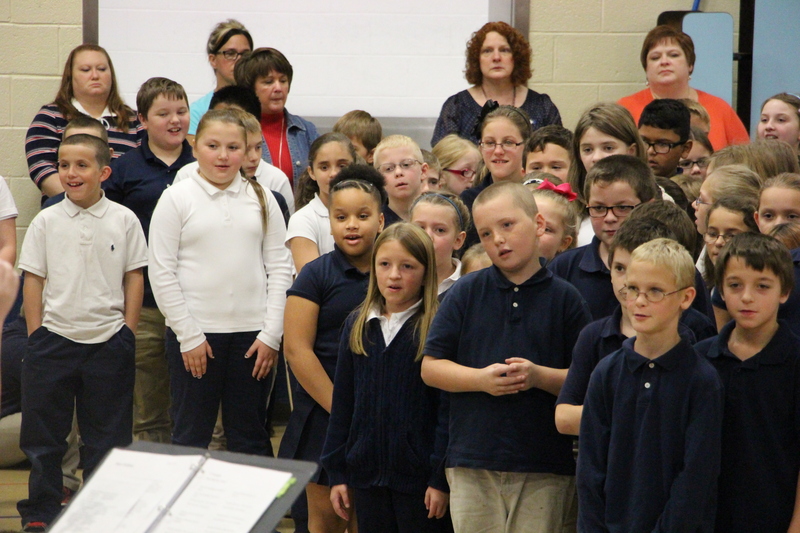 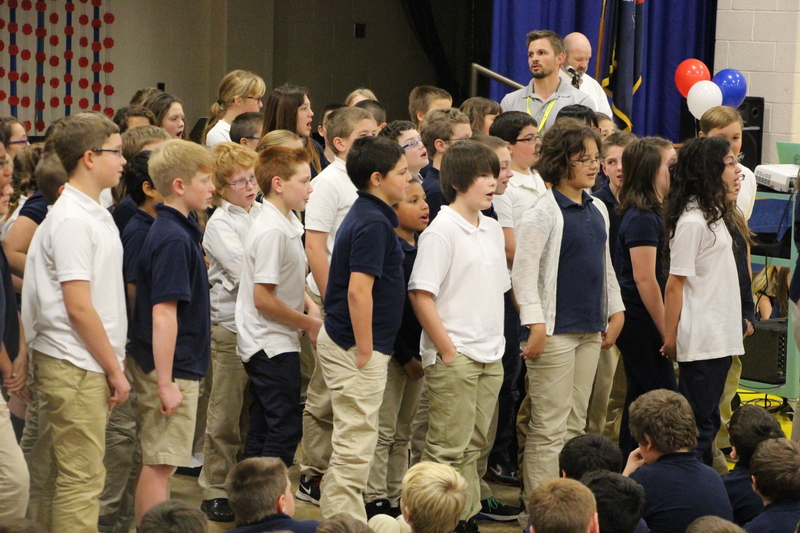 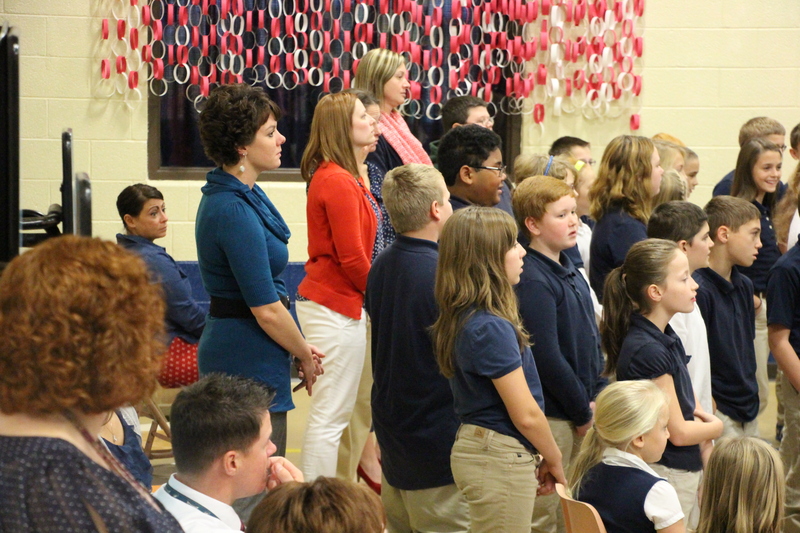 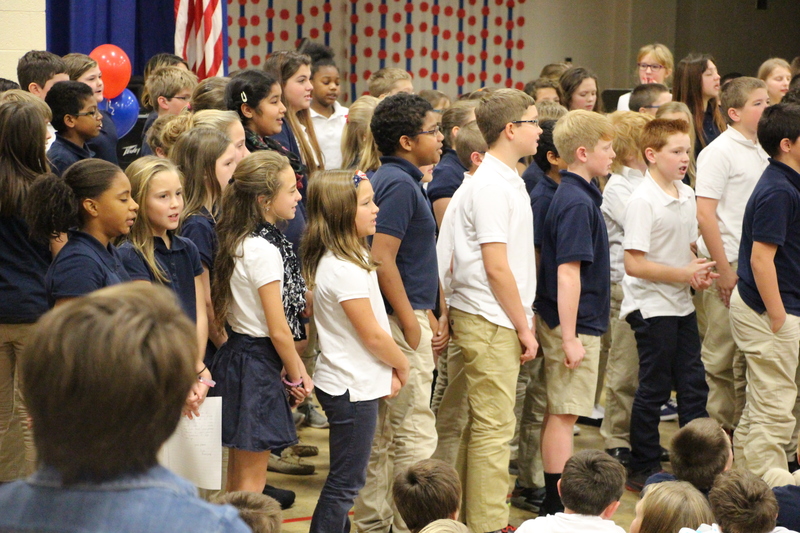 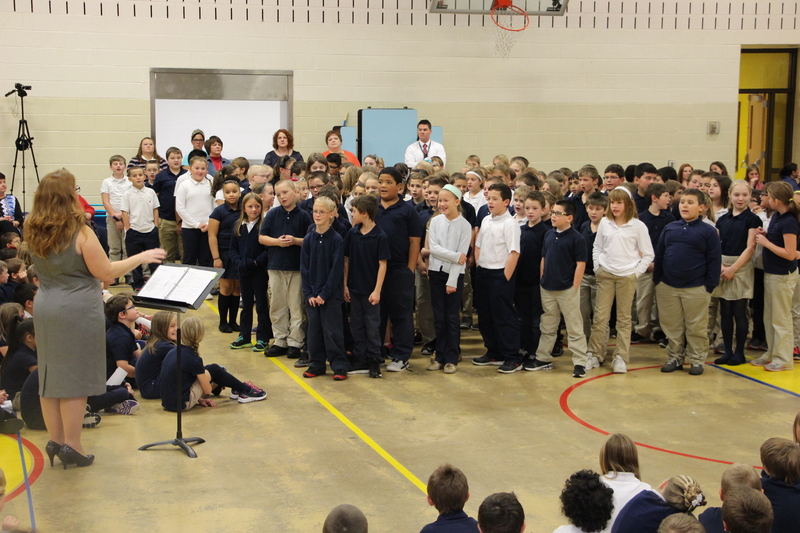 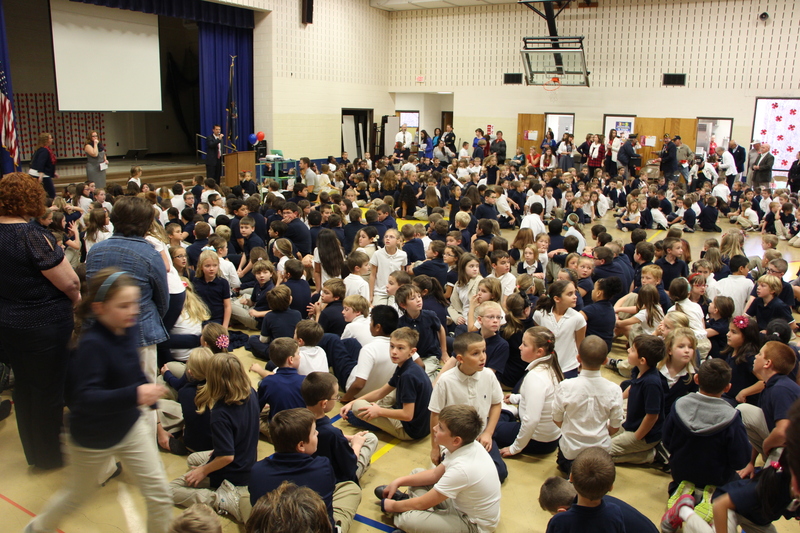 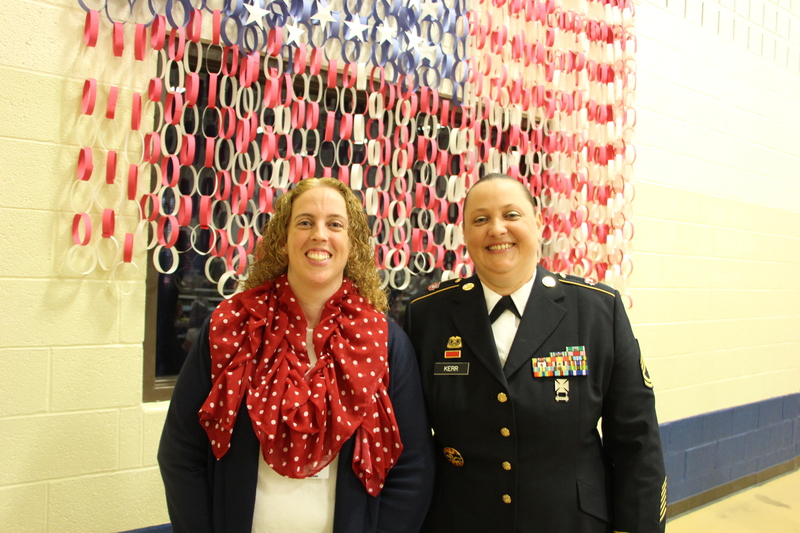 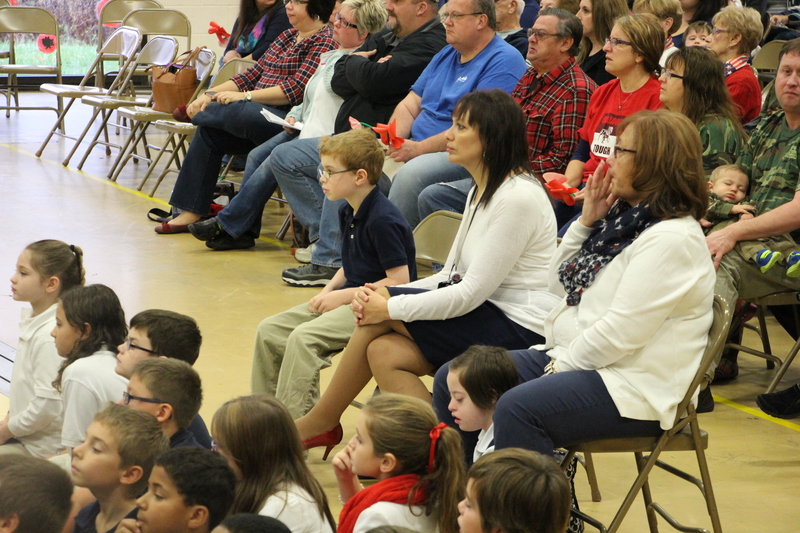 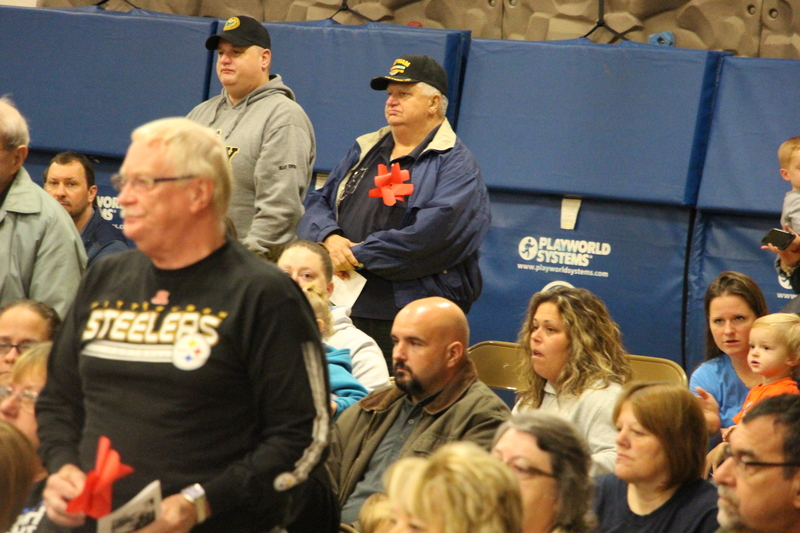 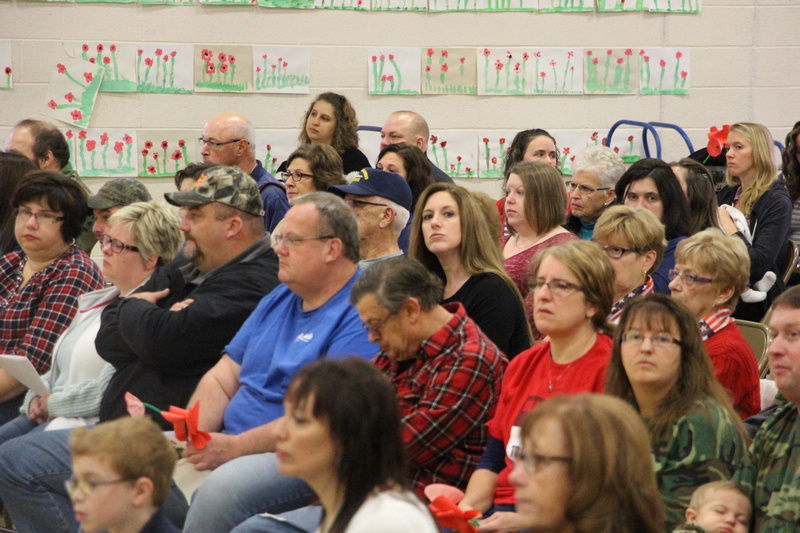 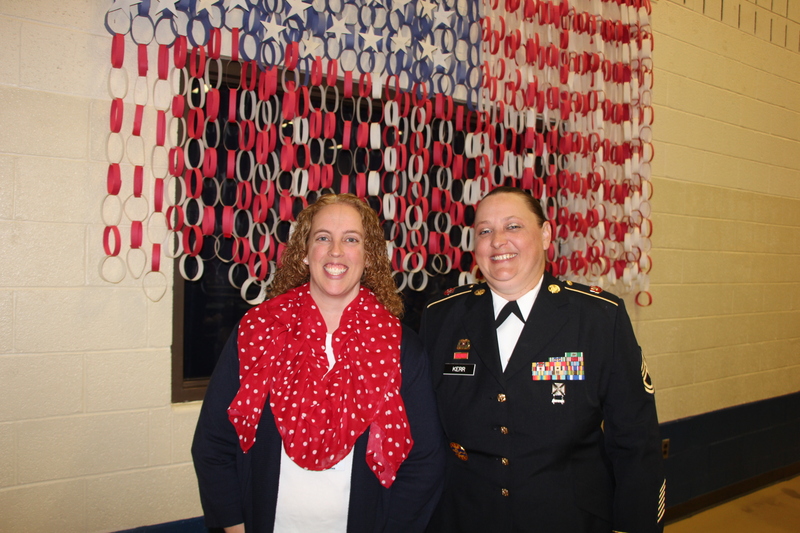 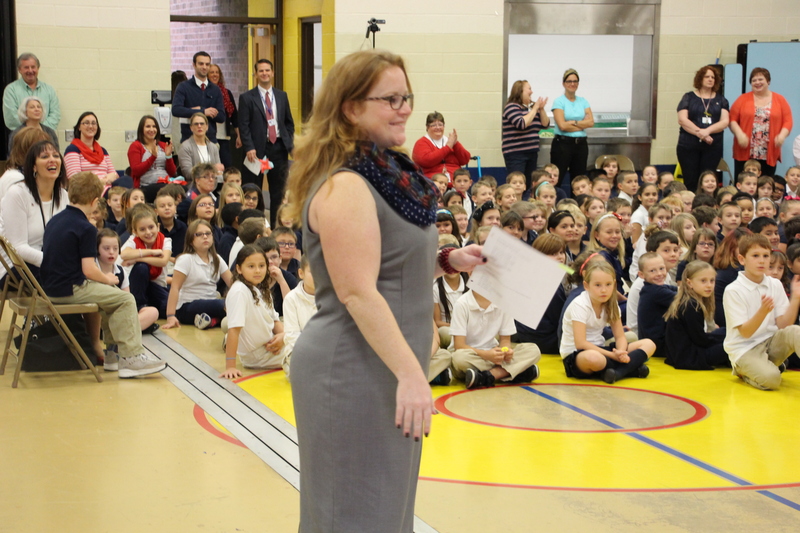 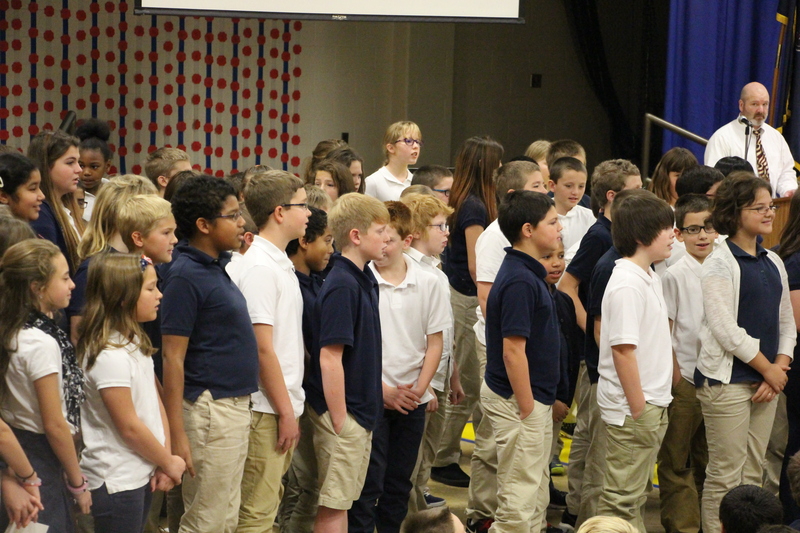 Tamaqua Area Elementary School students and staff recognized U.S. military veterans during the school’s annual Veteran’s Day Program held this morning (Wednesday, November 11, 2015) in the school’s gymnasium. 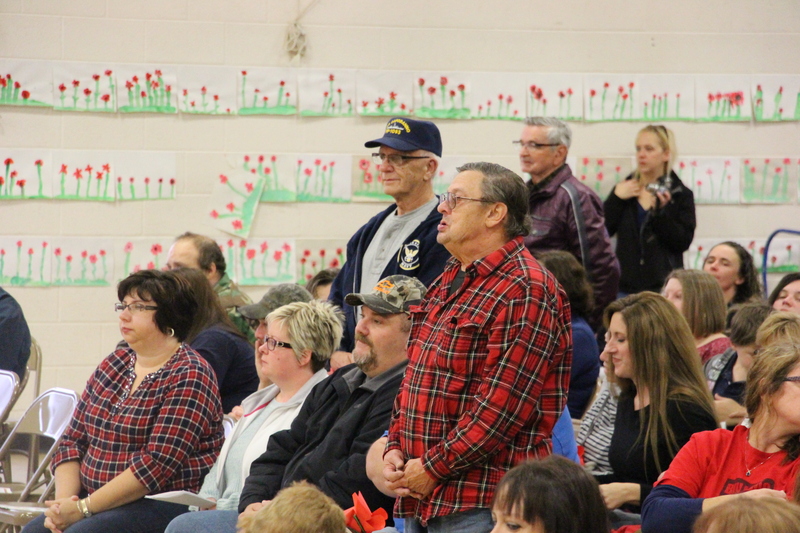 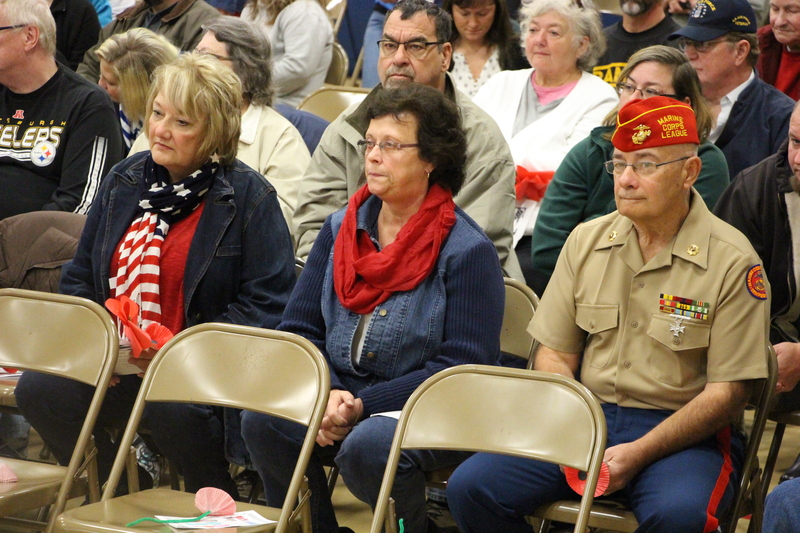 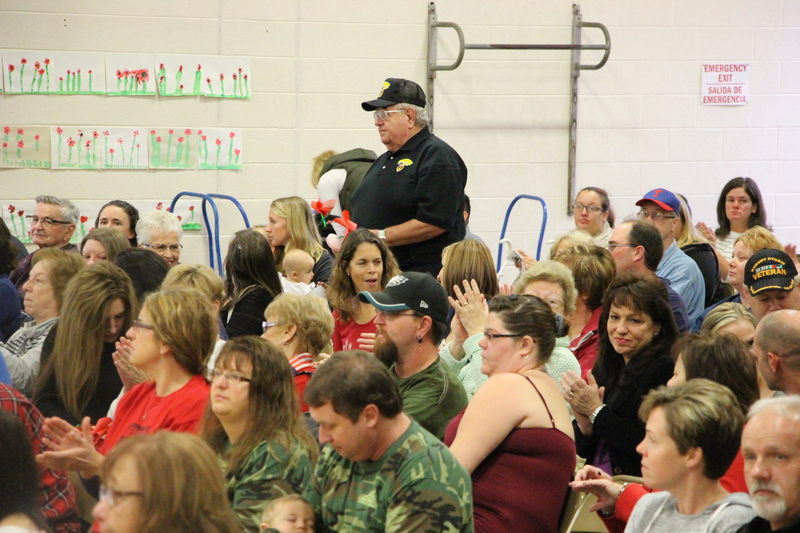 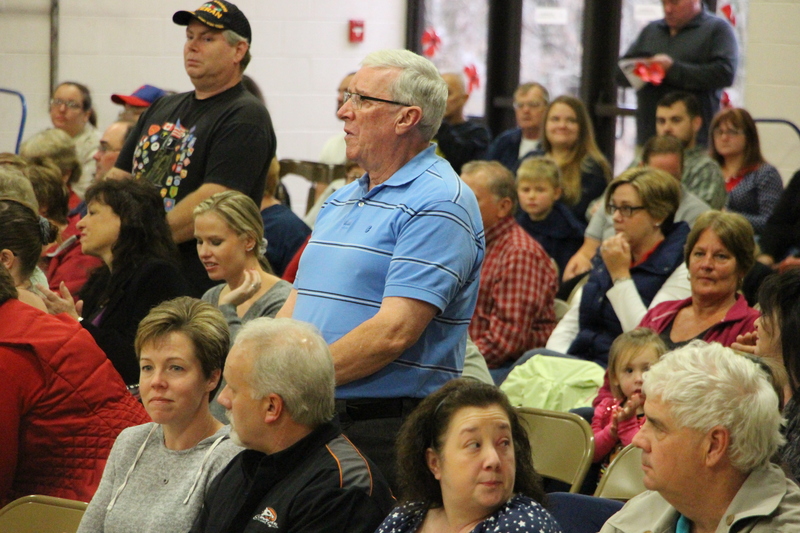 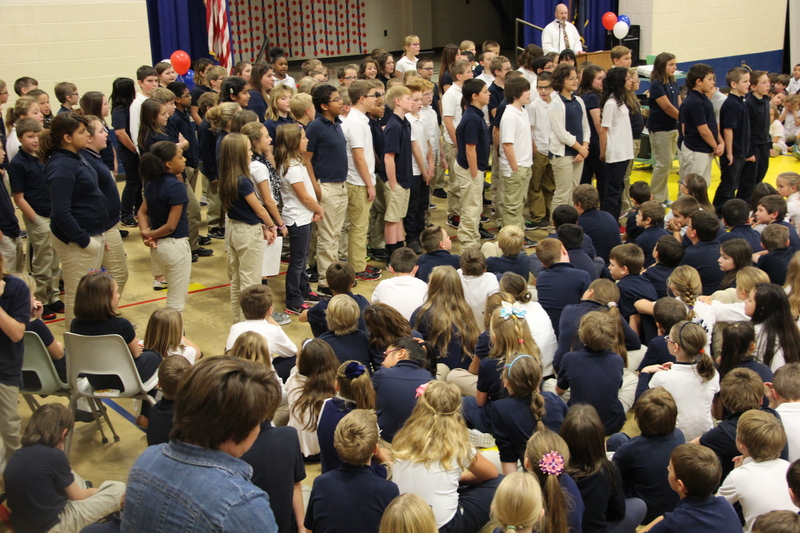 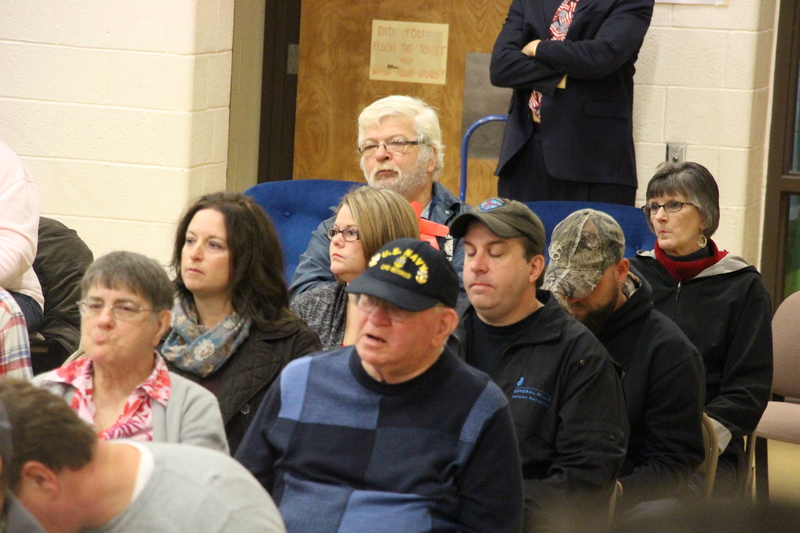 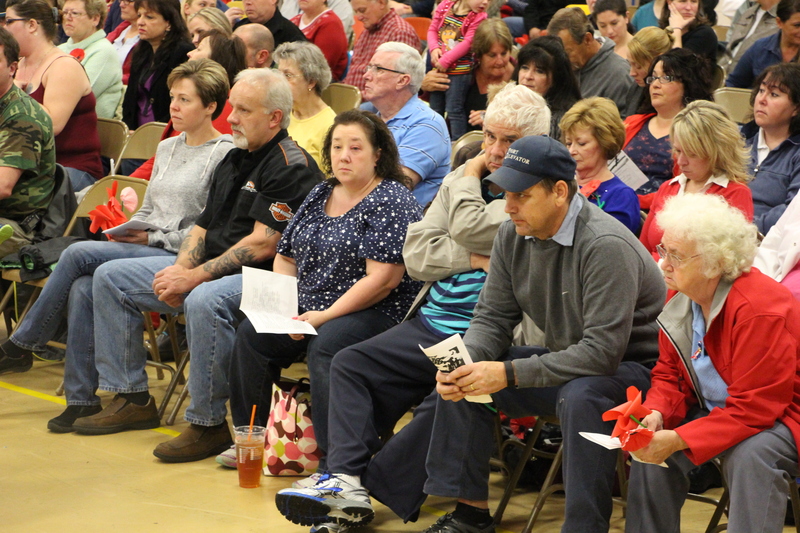 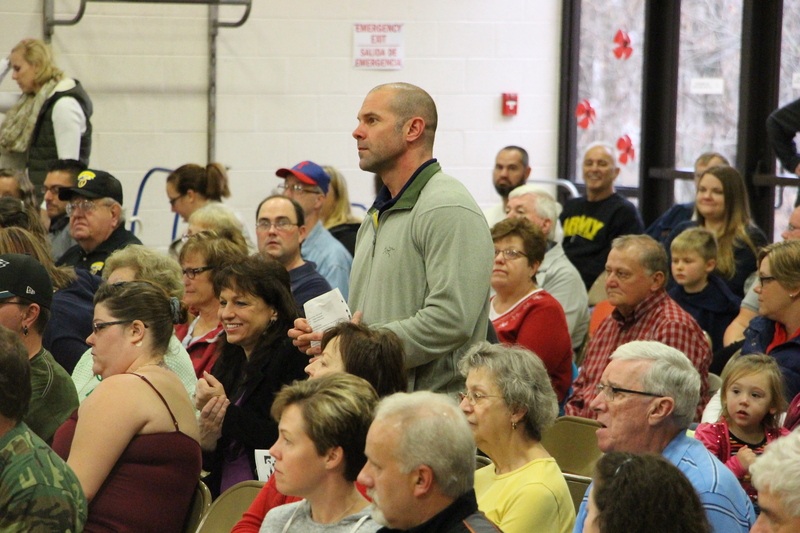 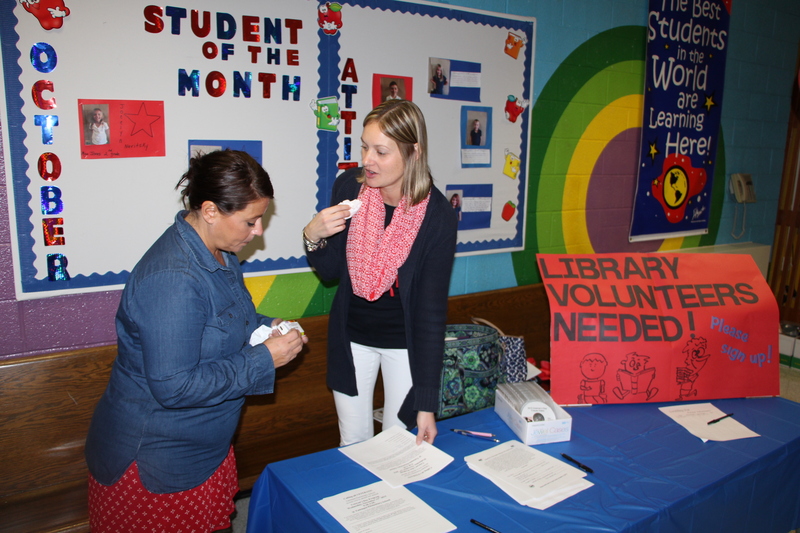 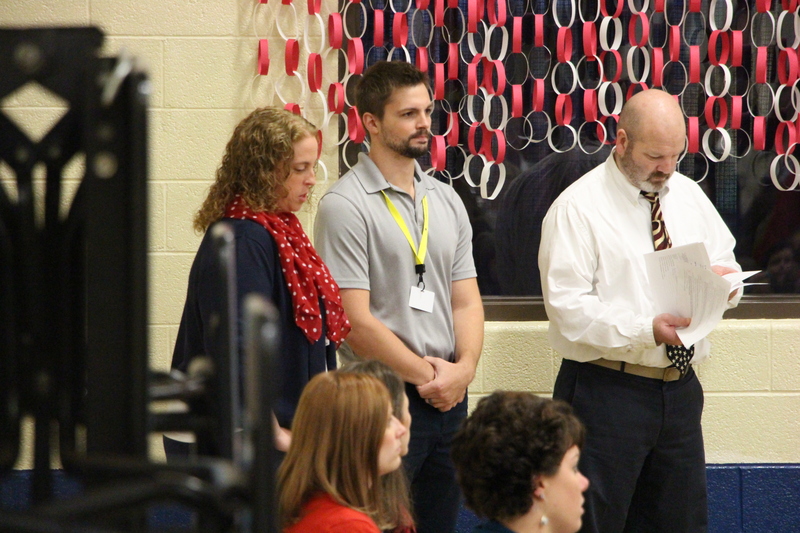 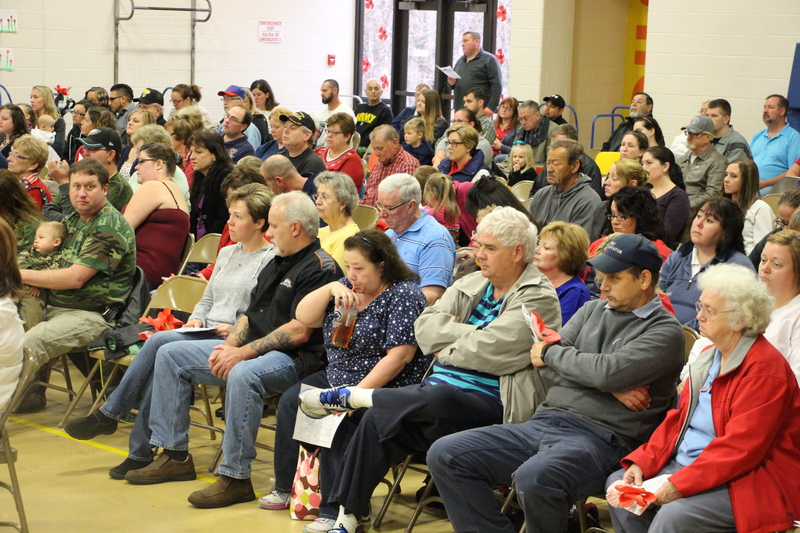 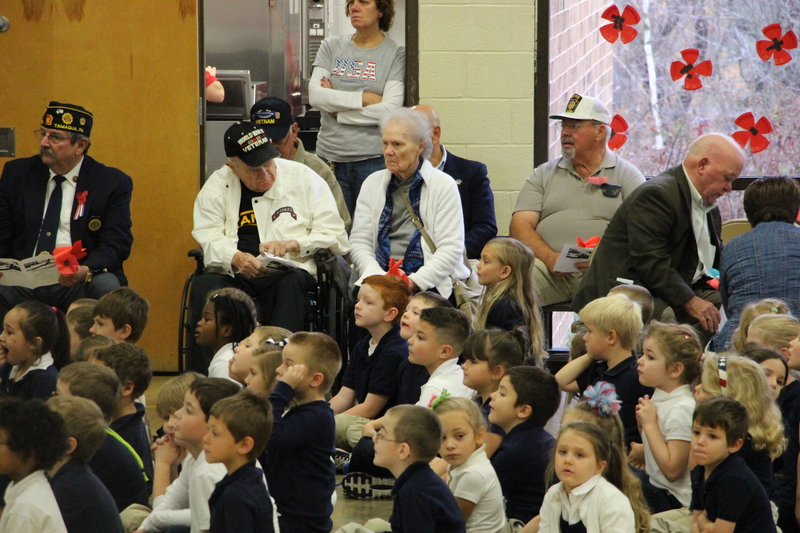 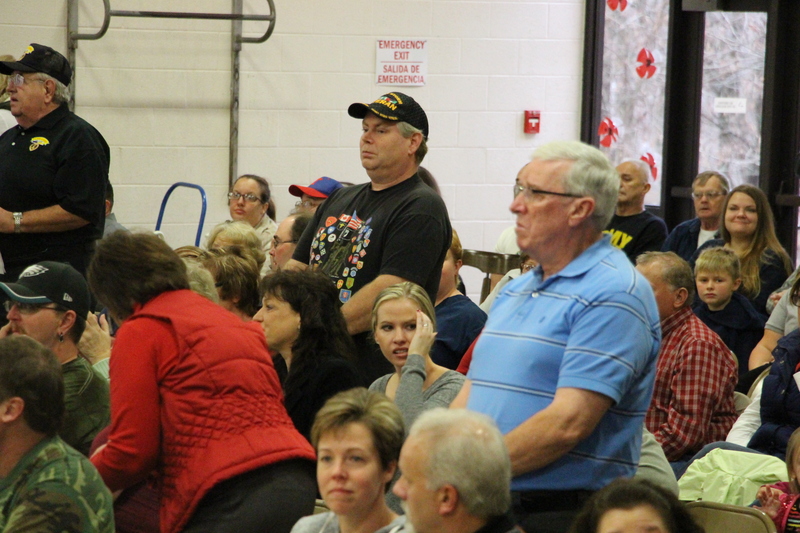 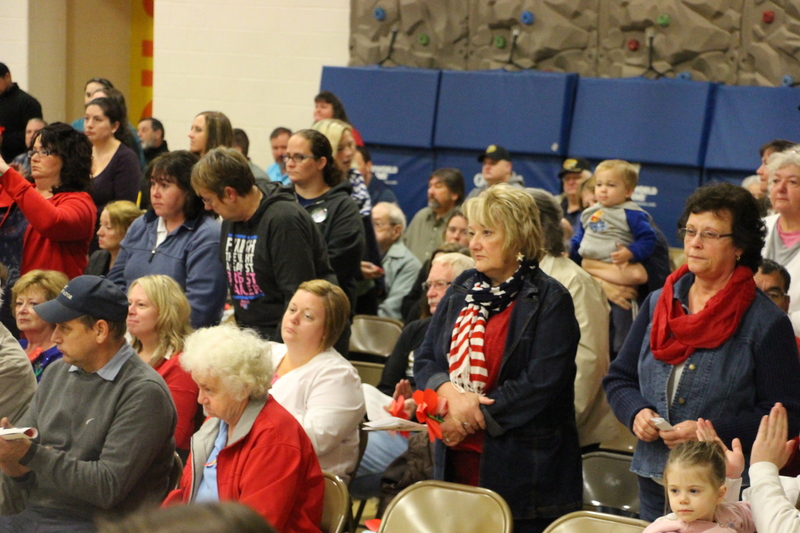 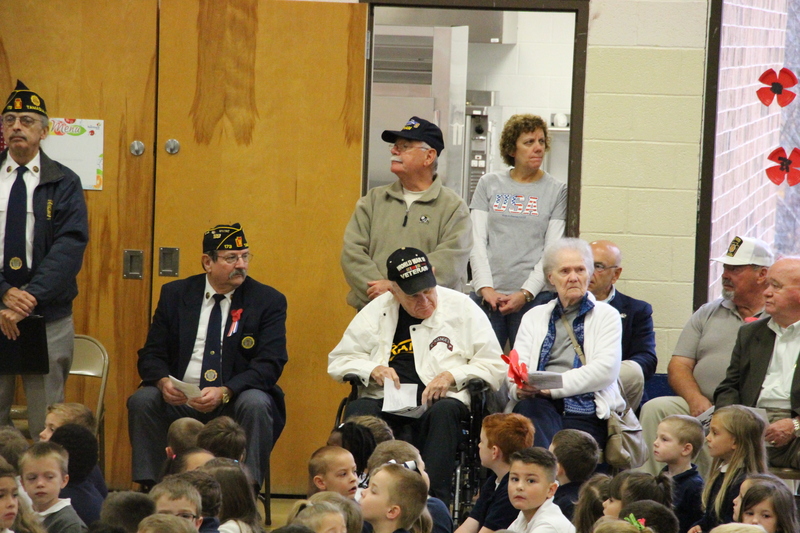 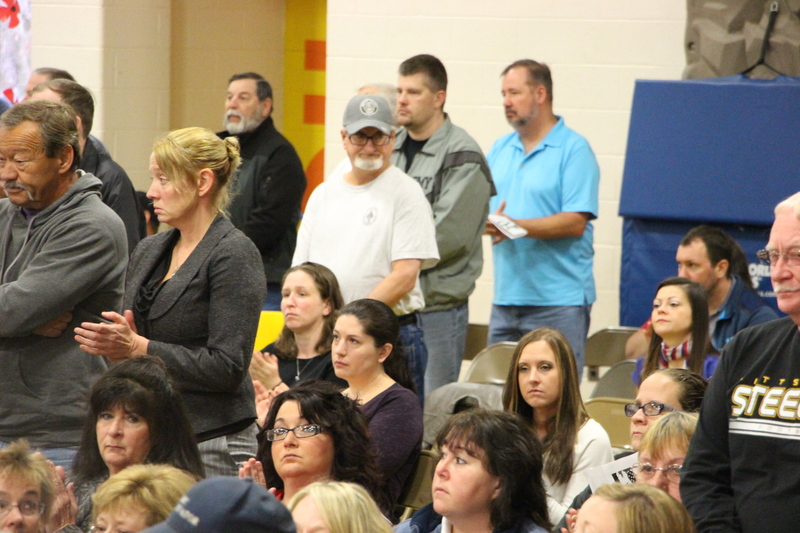 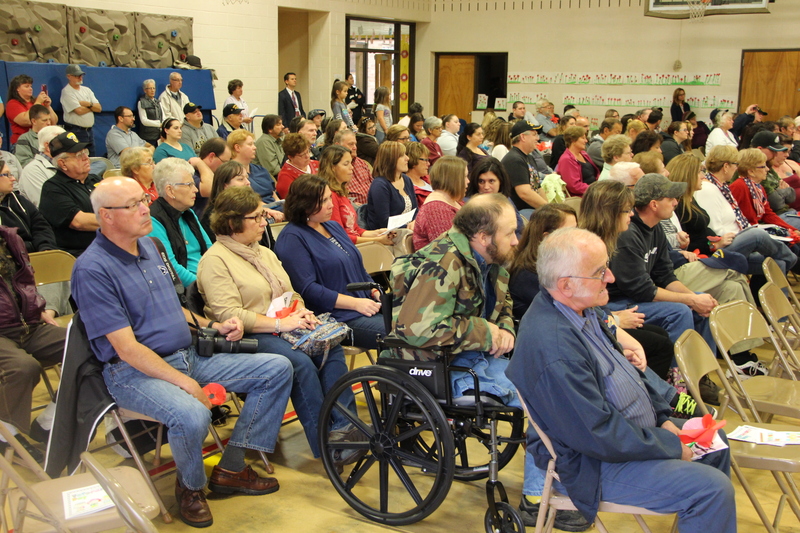 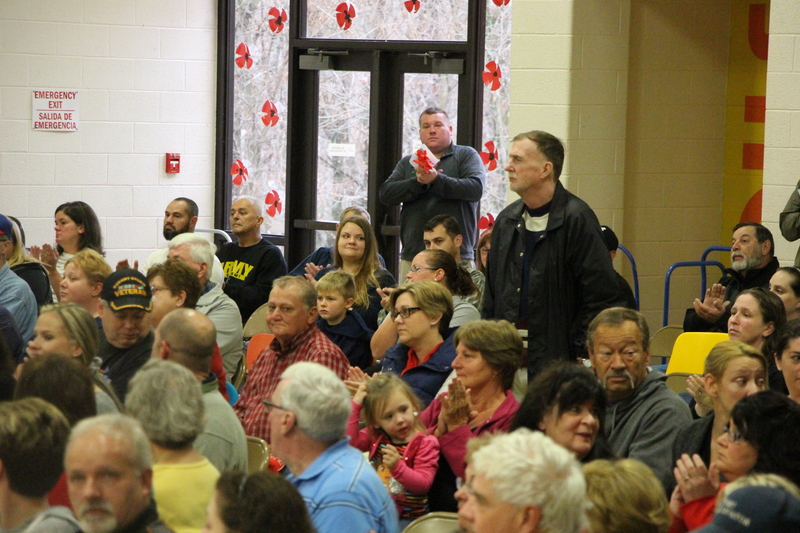 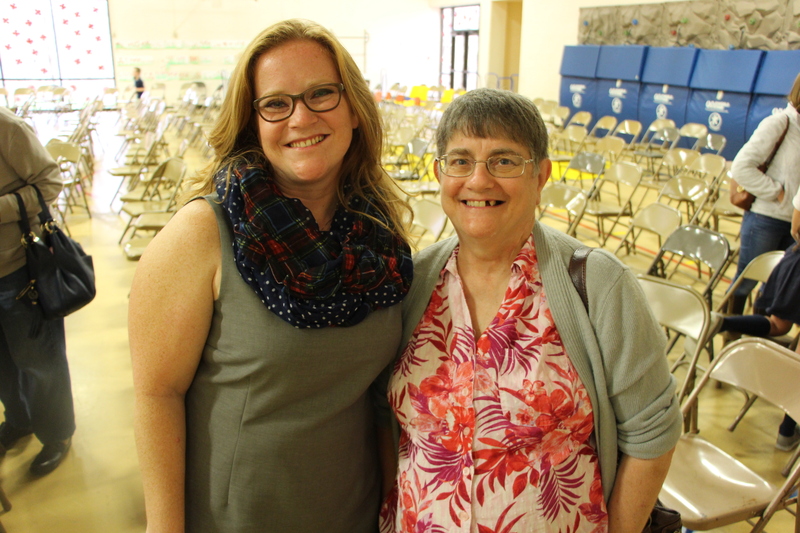 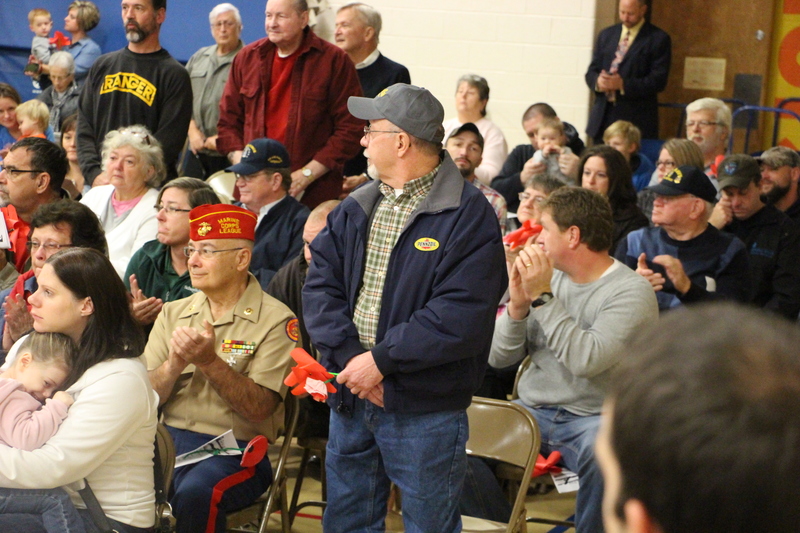 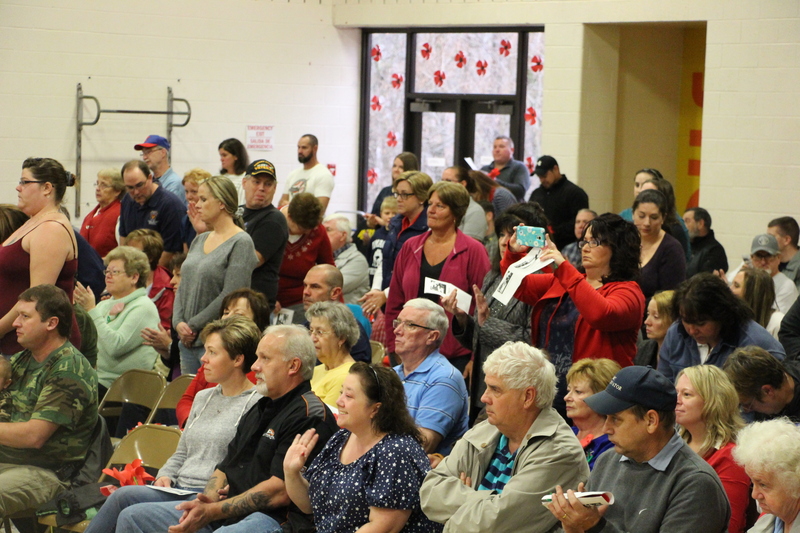 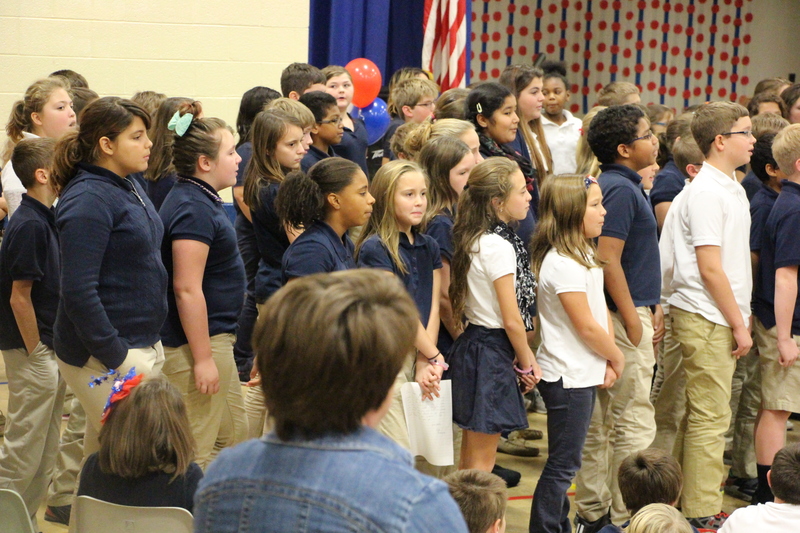 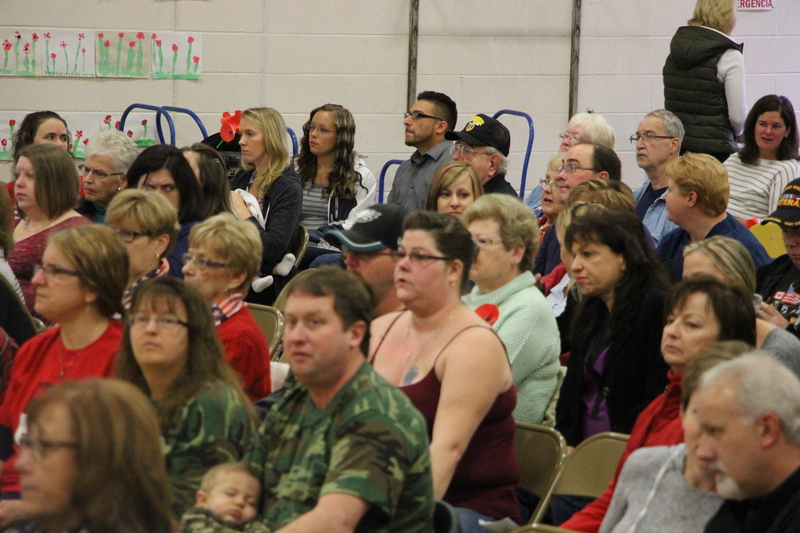 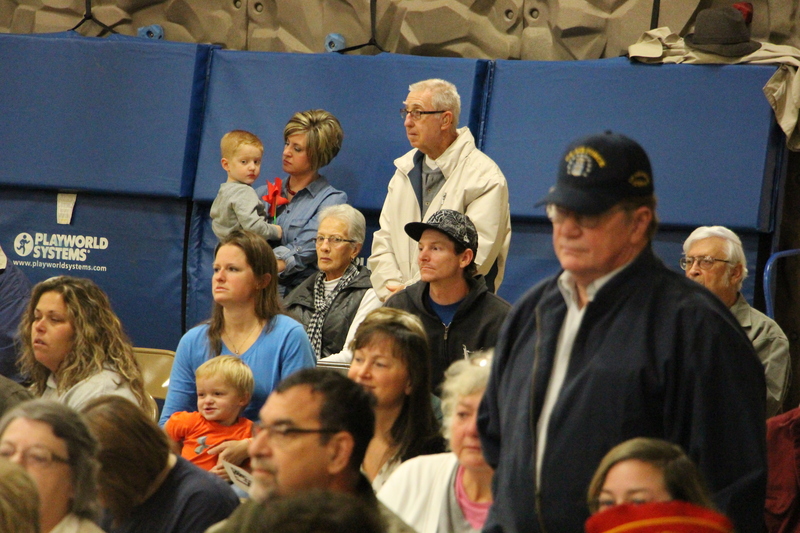 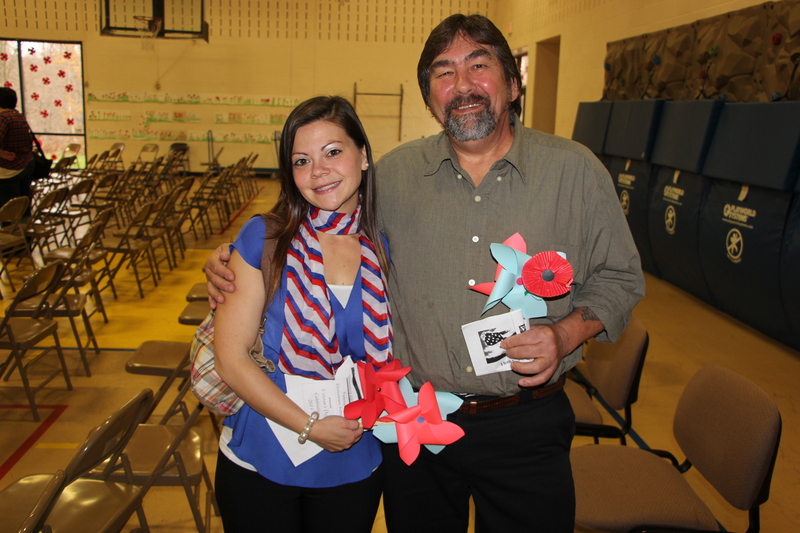 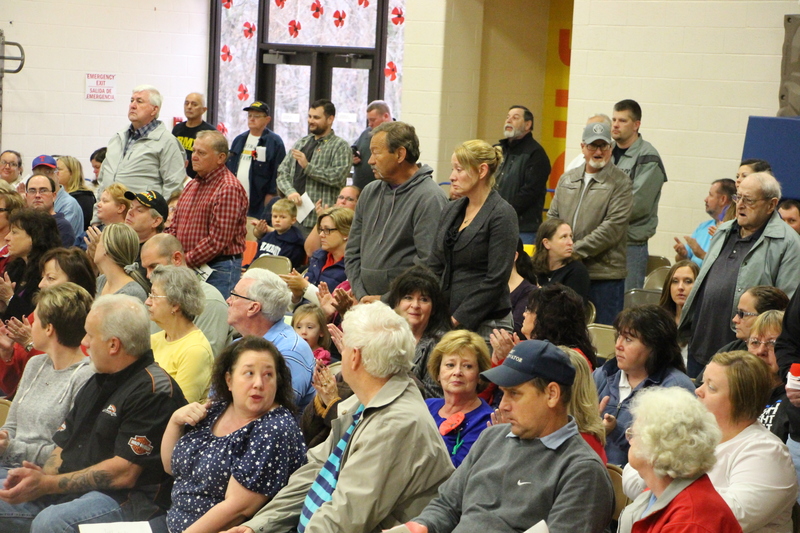 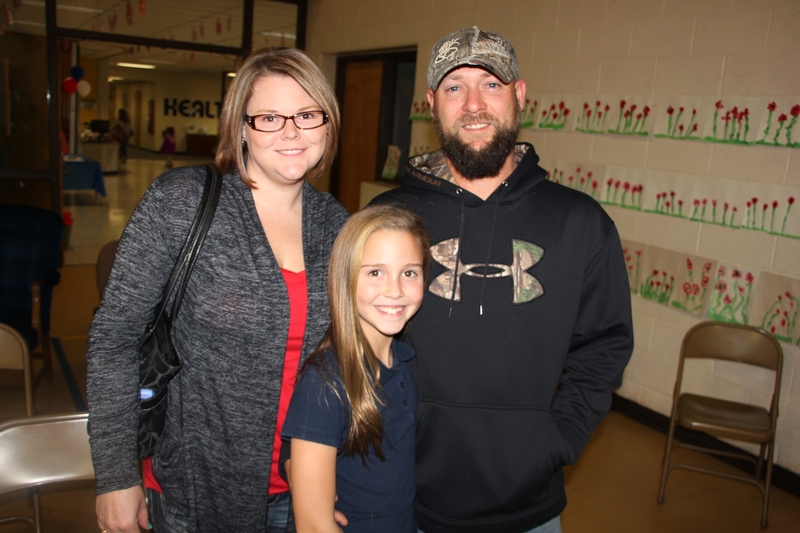 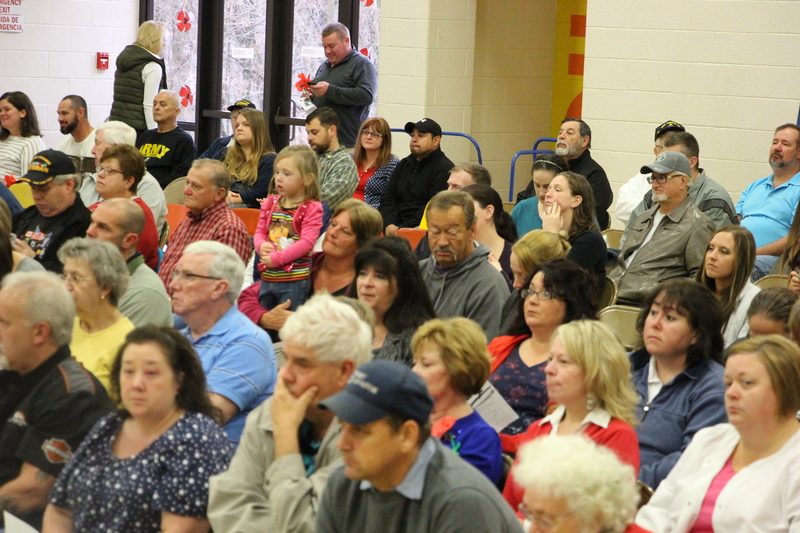 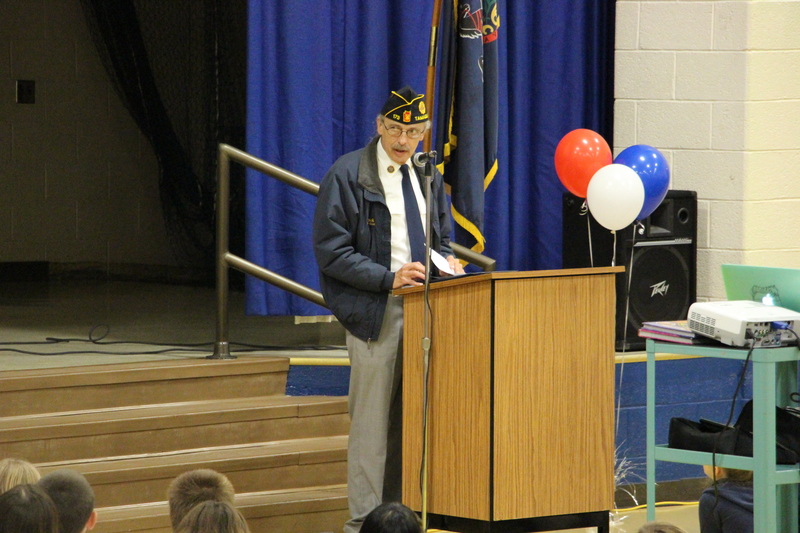 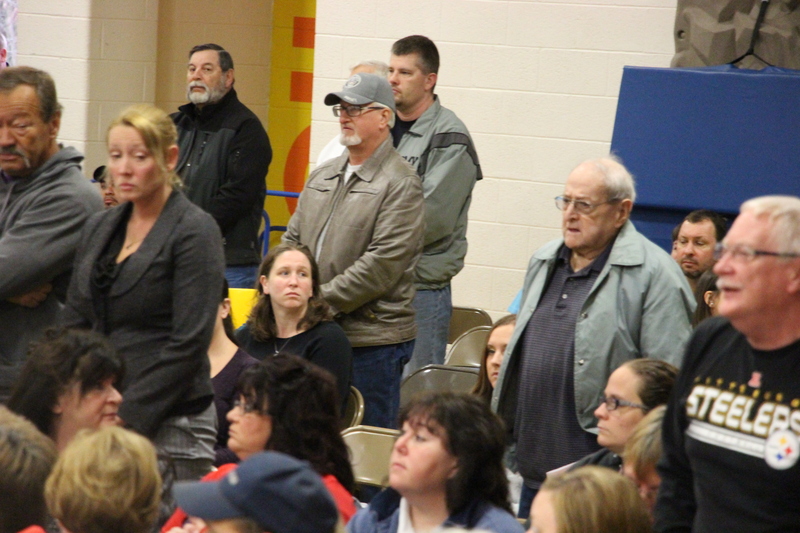 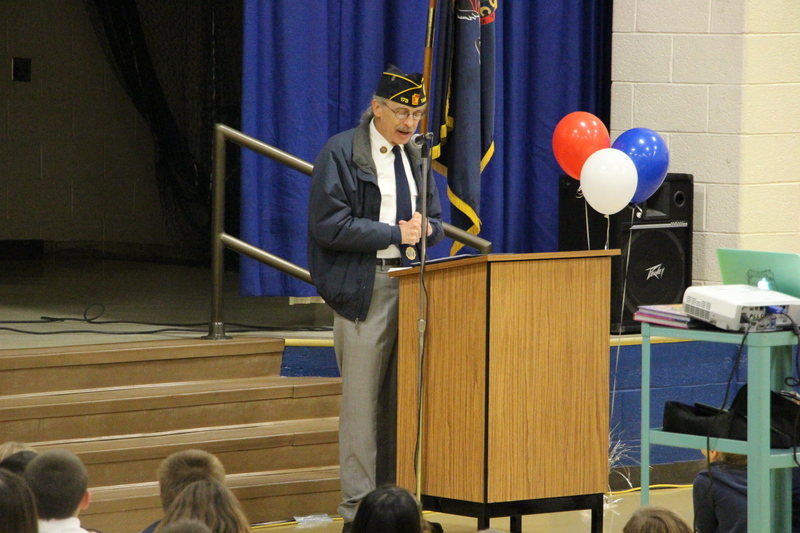 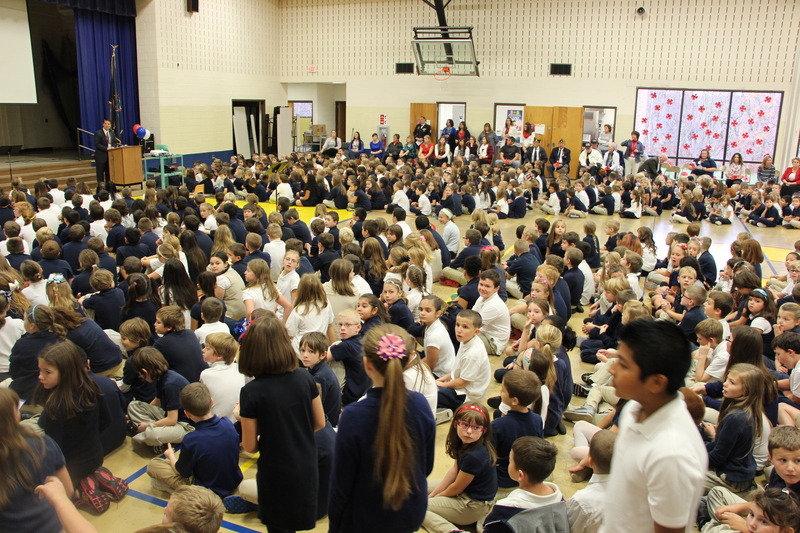 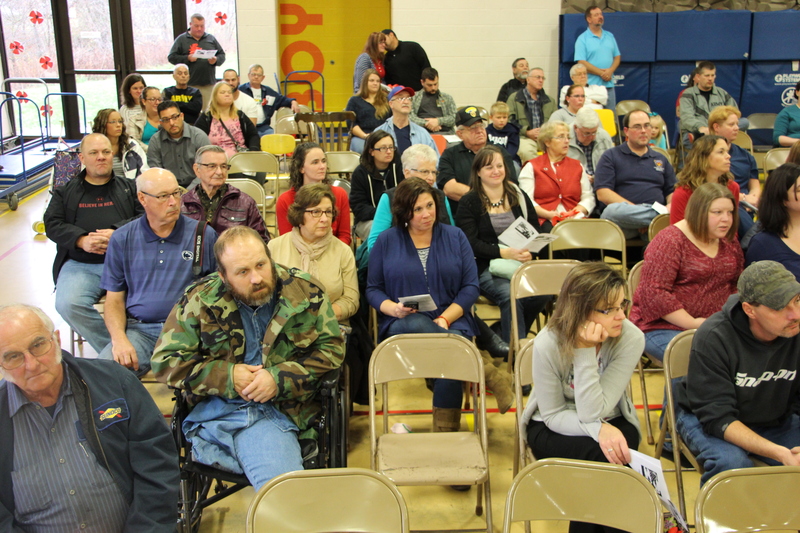 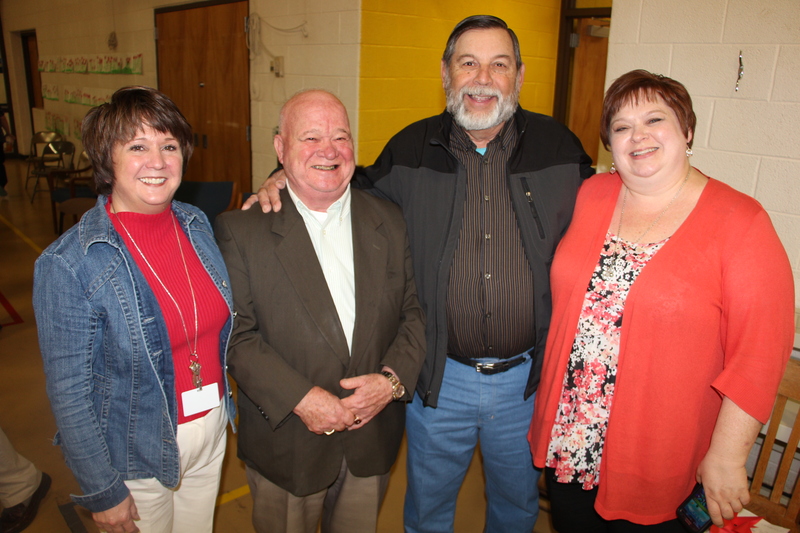 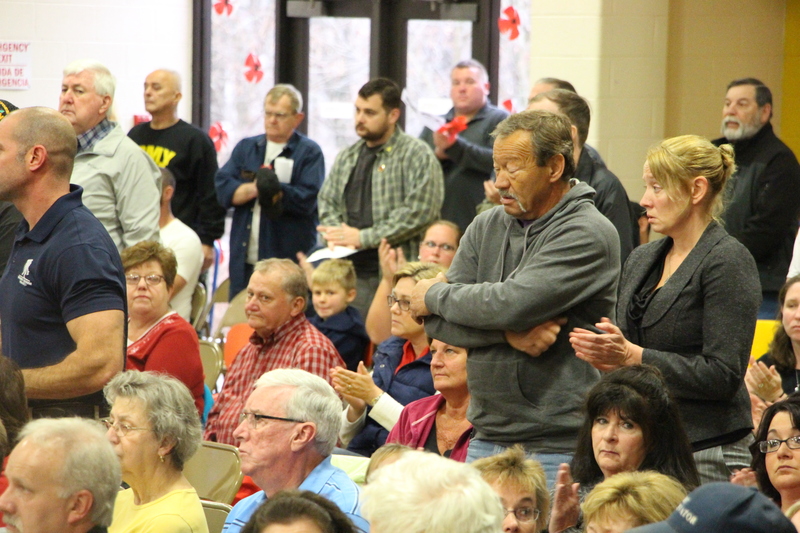 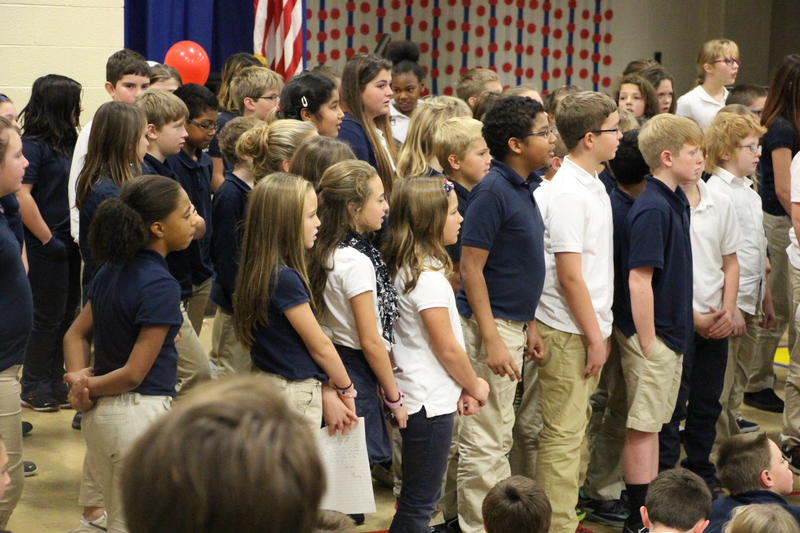 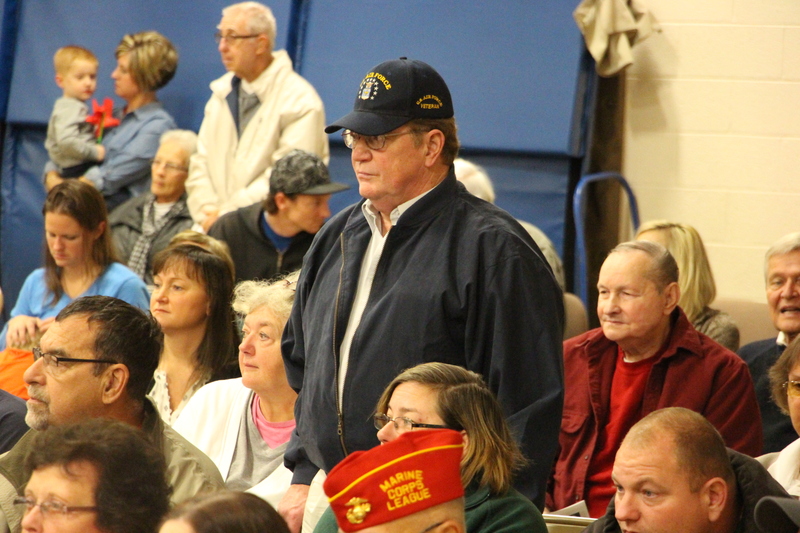 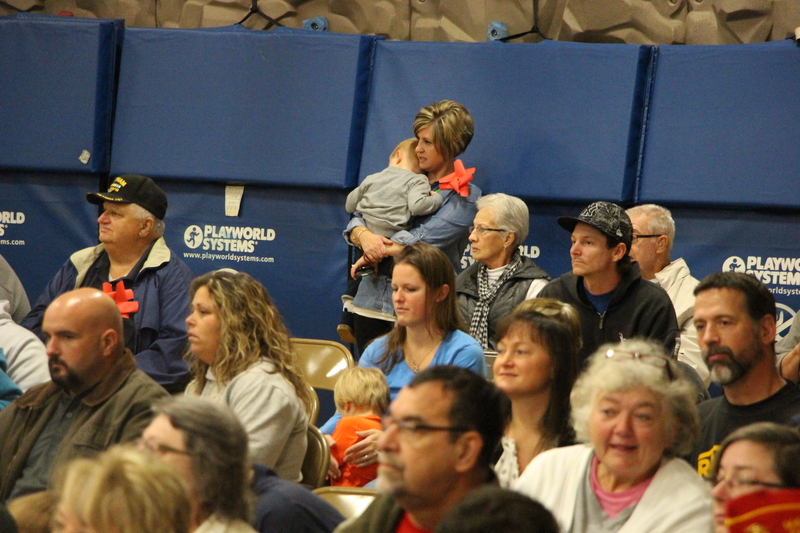 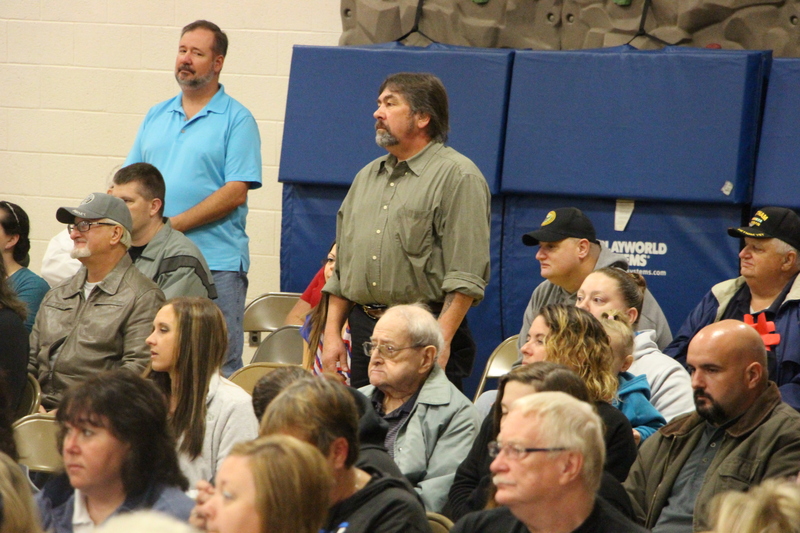 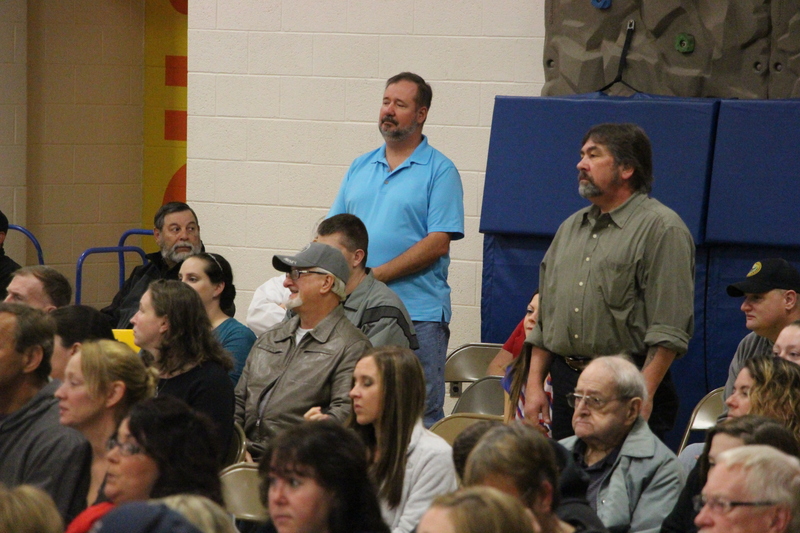 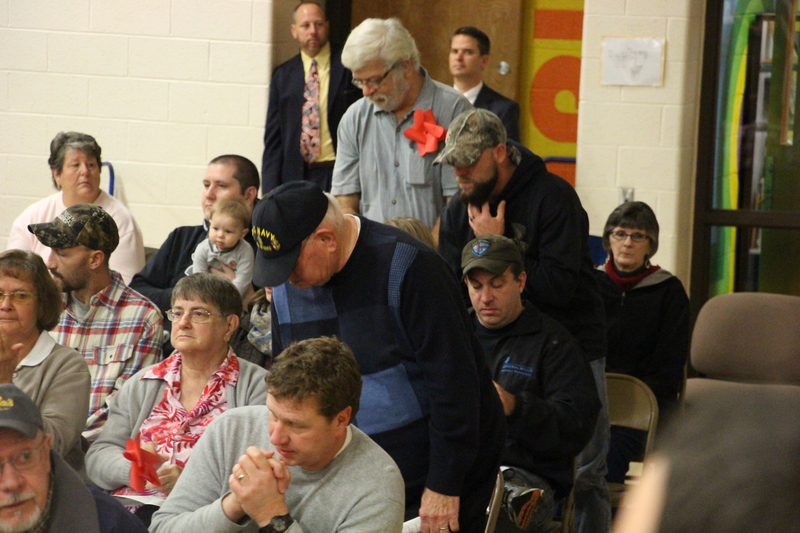 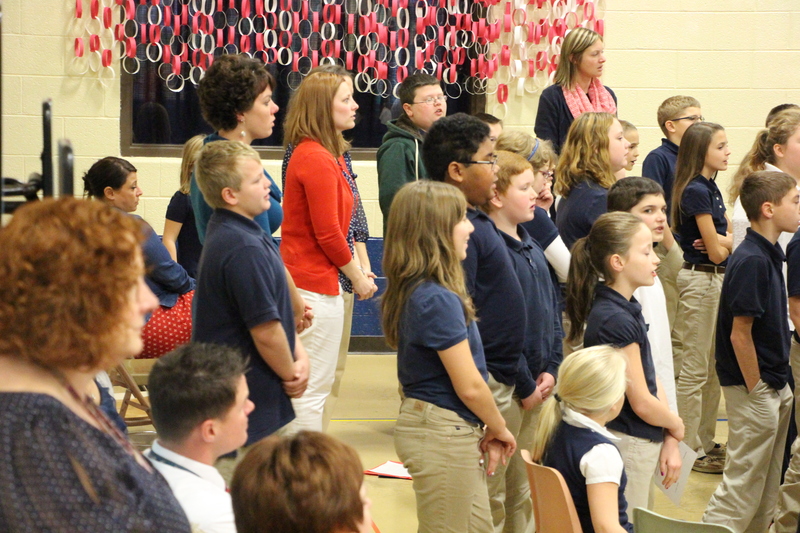 Veterans and family members of students were encouraged to attend the celebration. 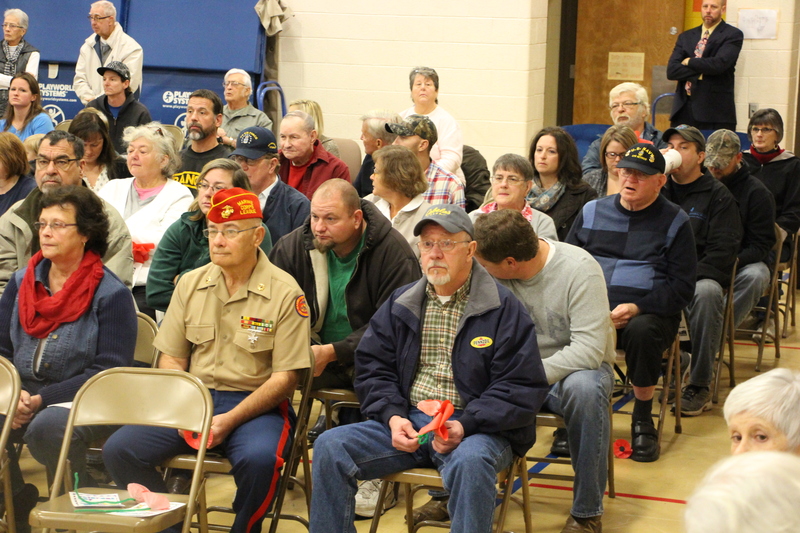 Approximated 150 veterans took part or watched the program. 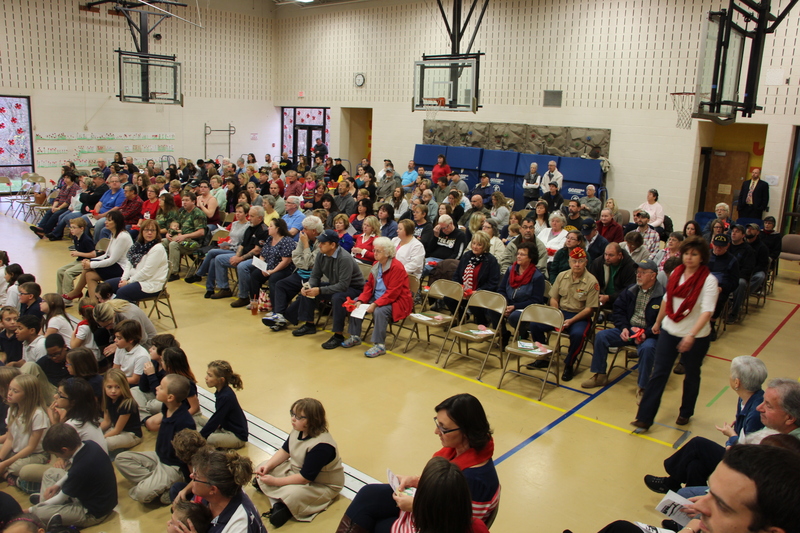 Below is a quick overview of the event. 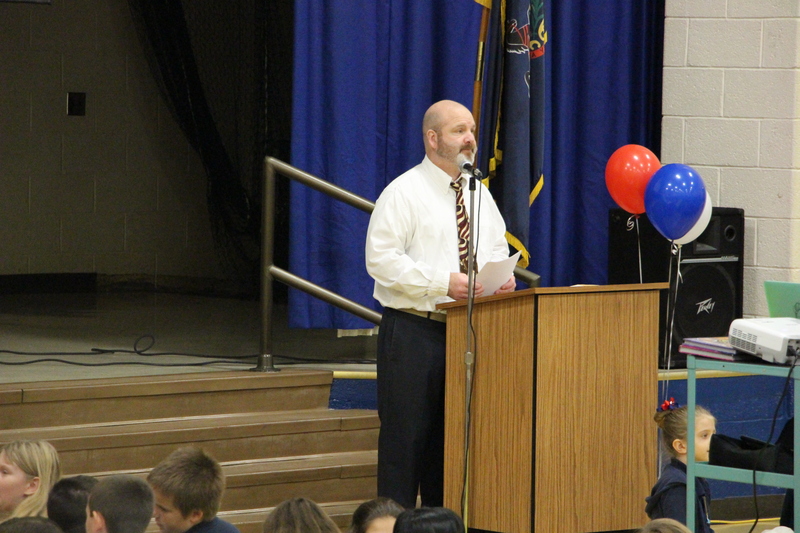 Welcome was given by Steven Behr and James Fasnacht. 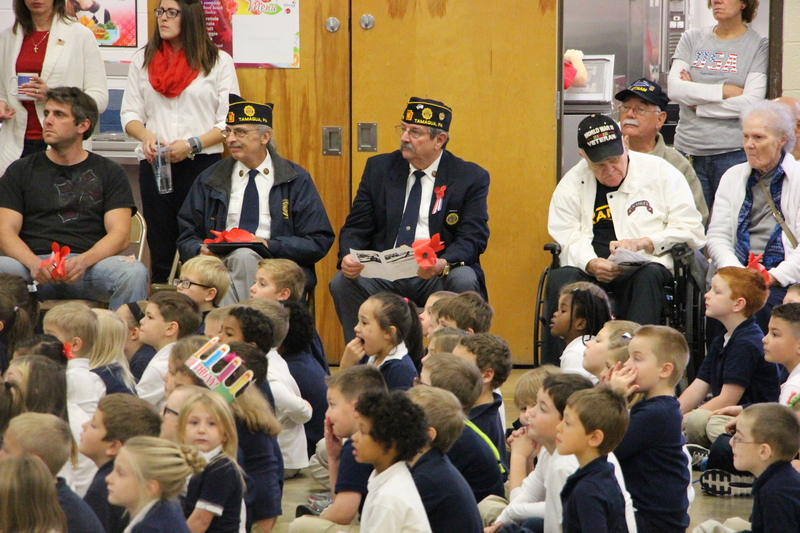 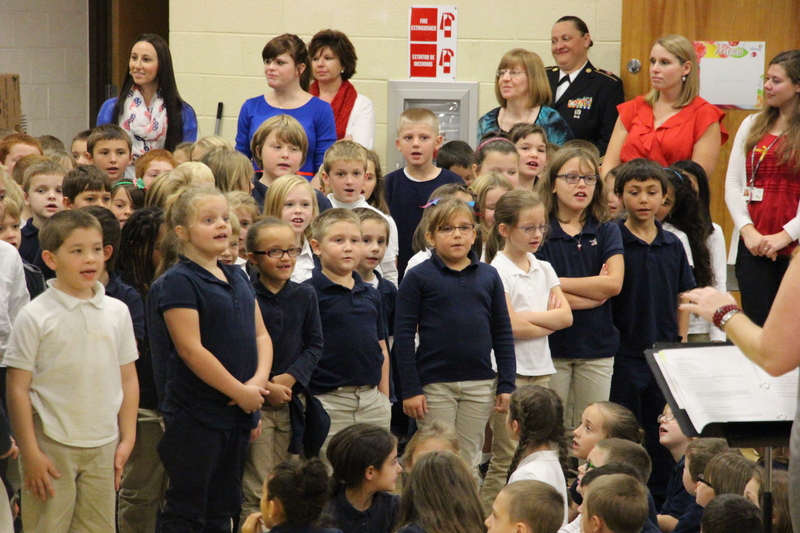 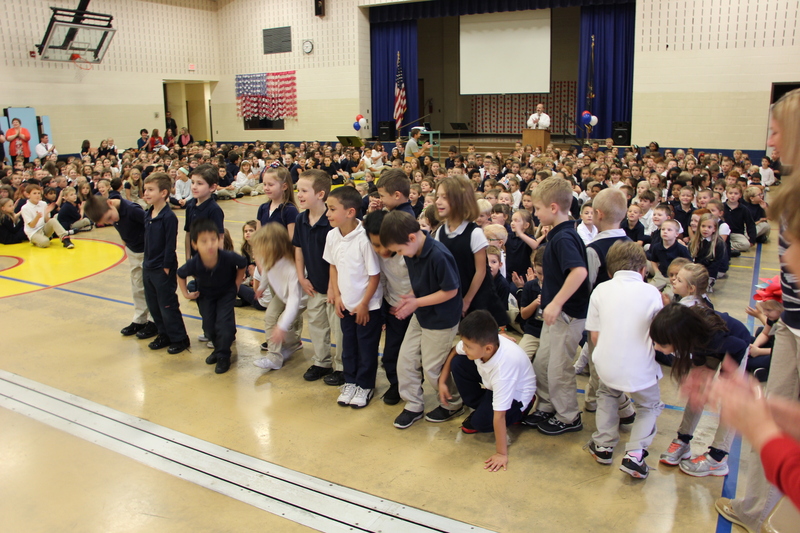 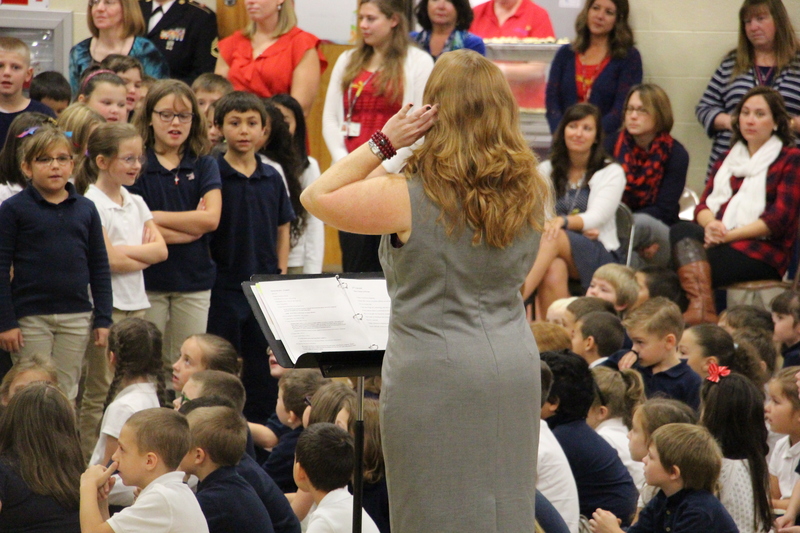 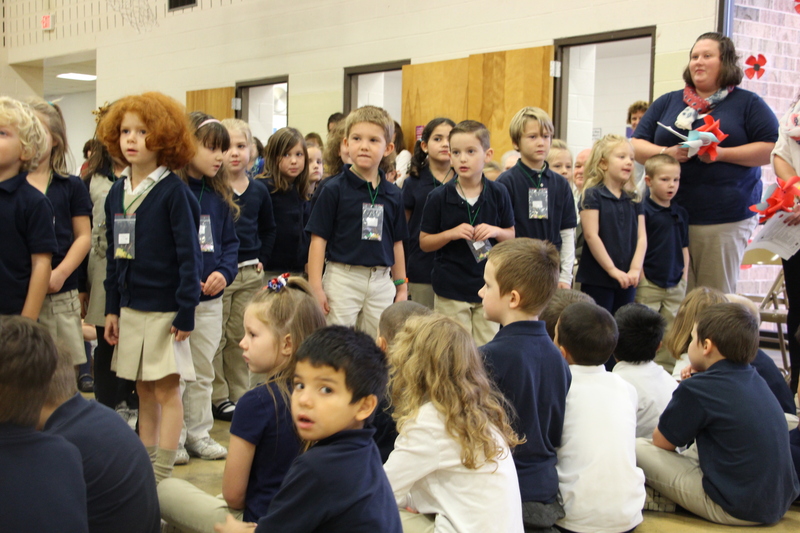 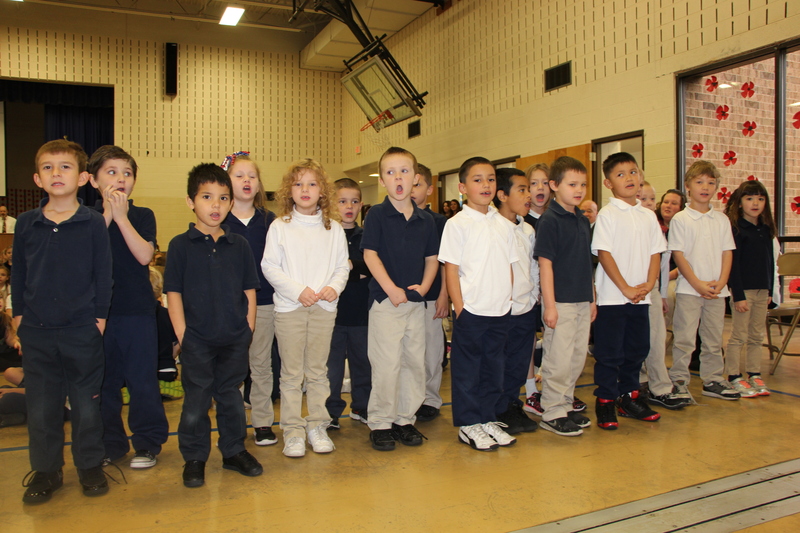 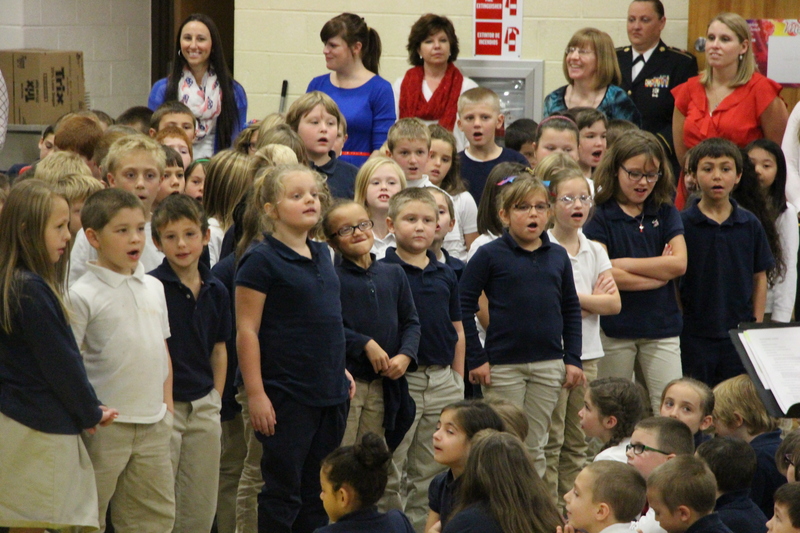 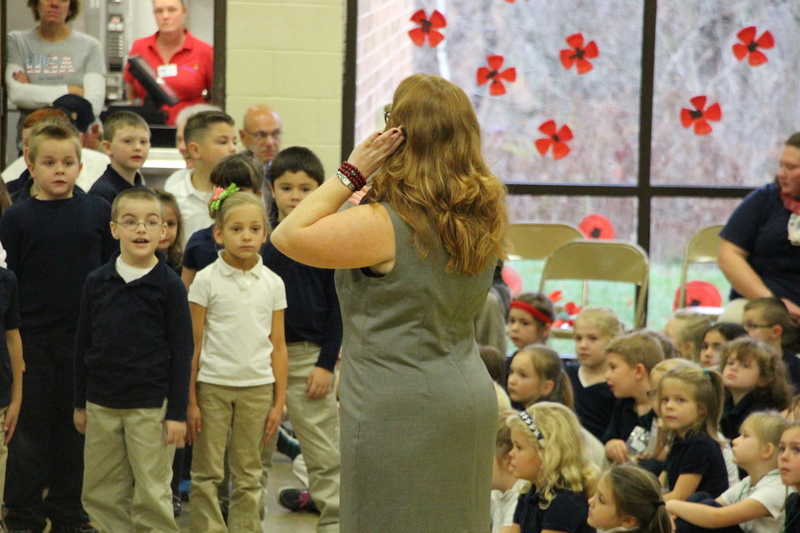 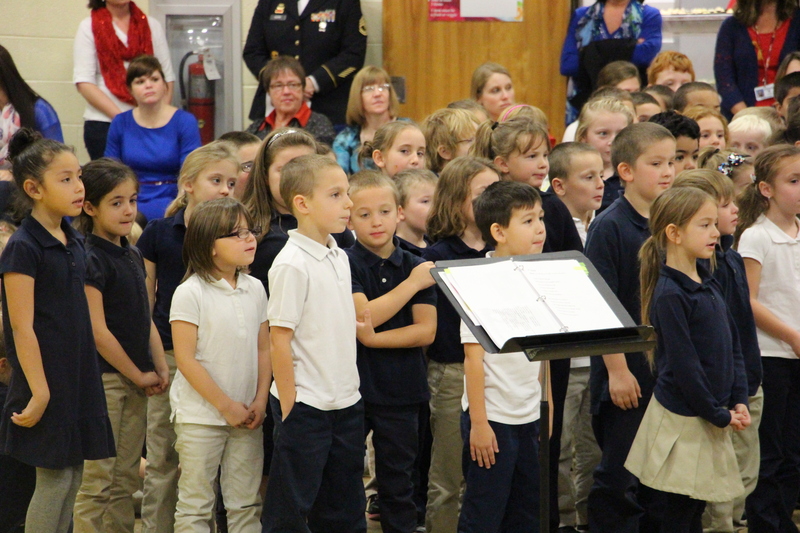 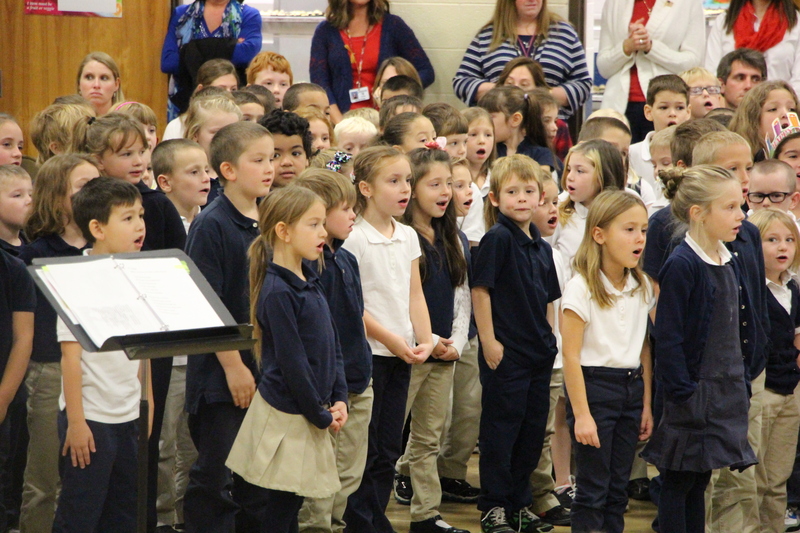 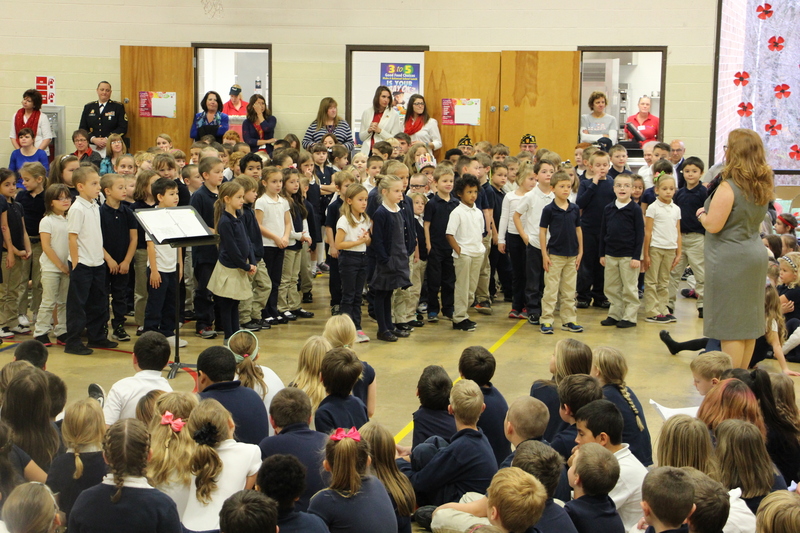 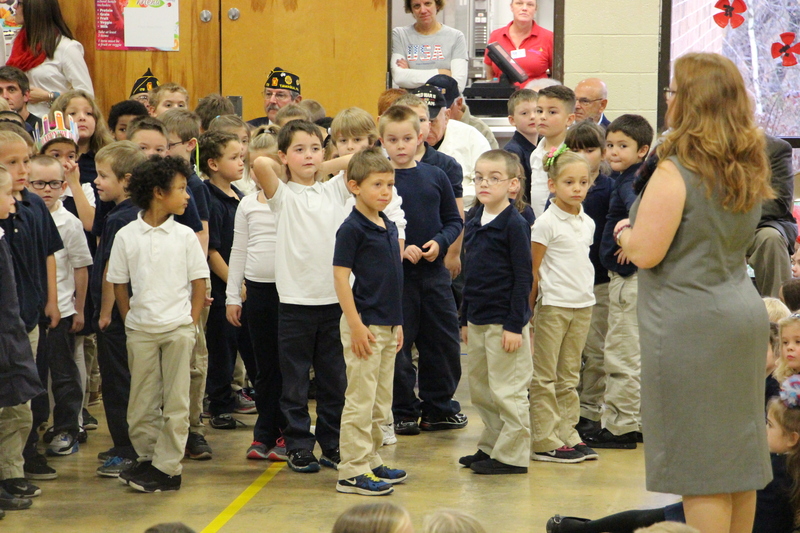 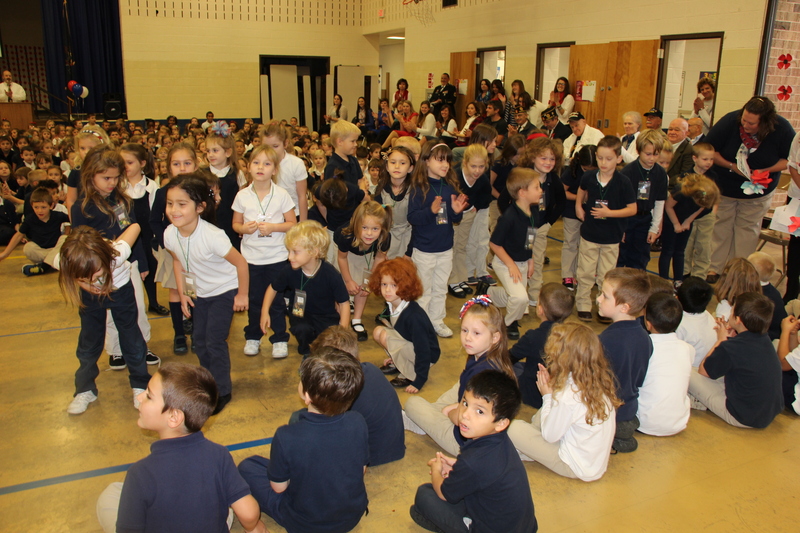 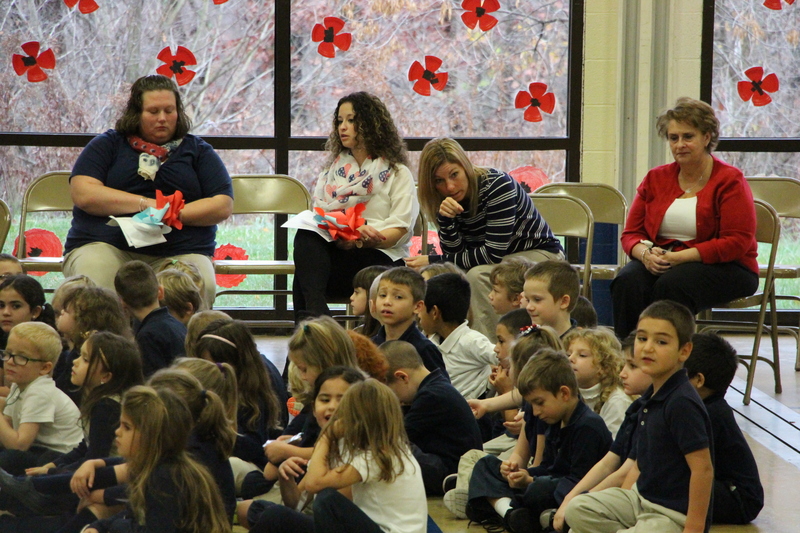 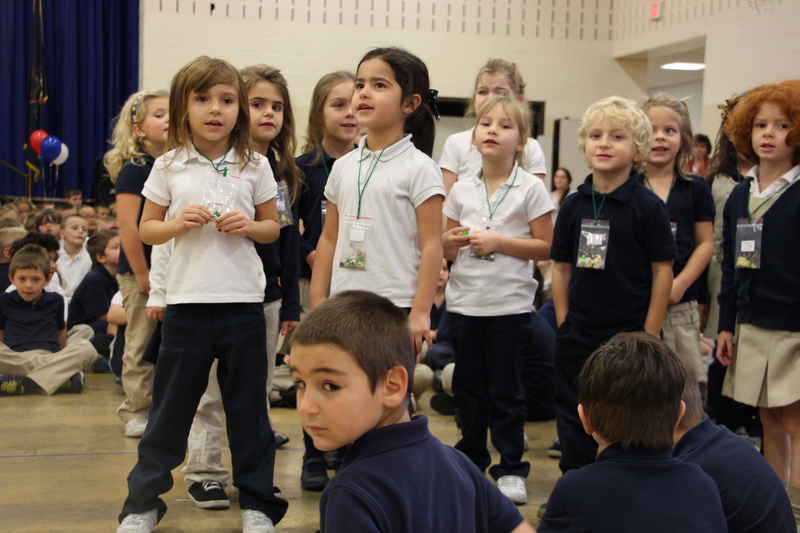 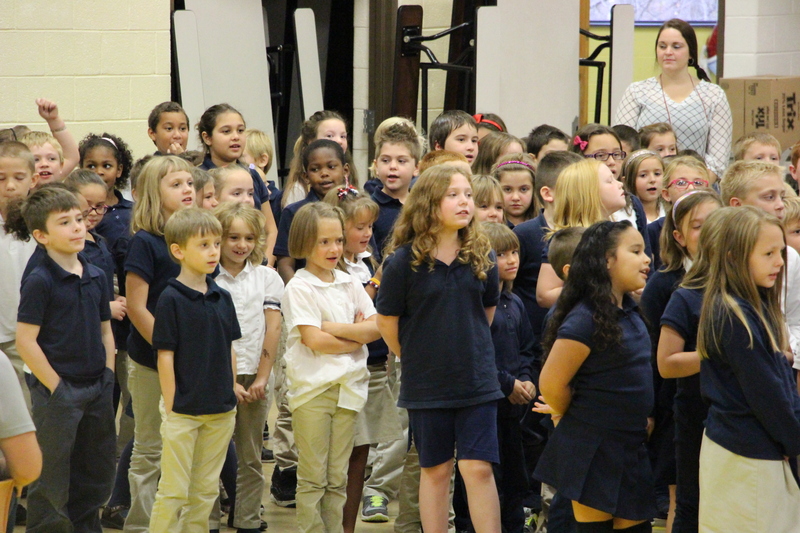 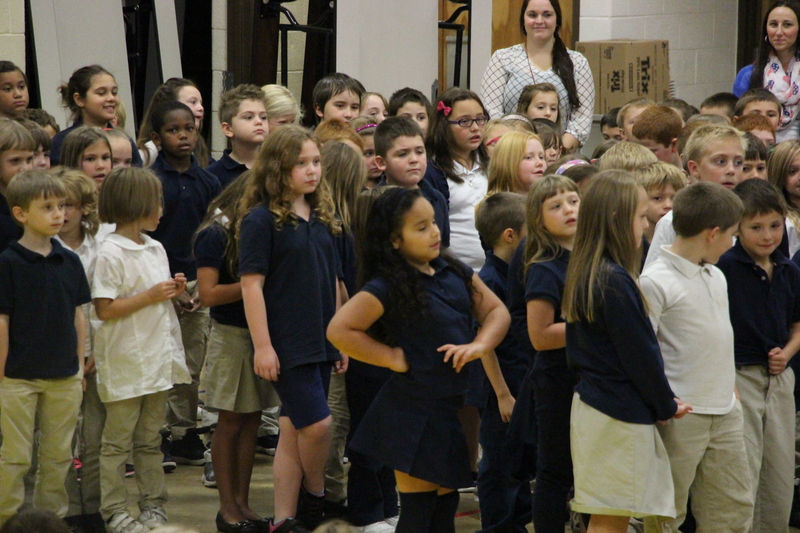 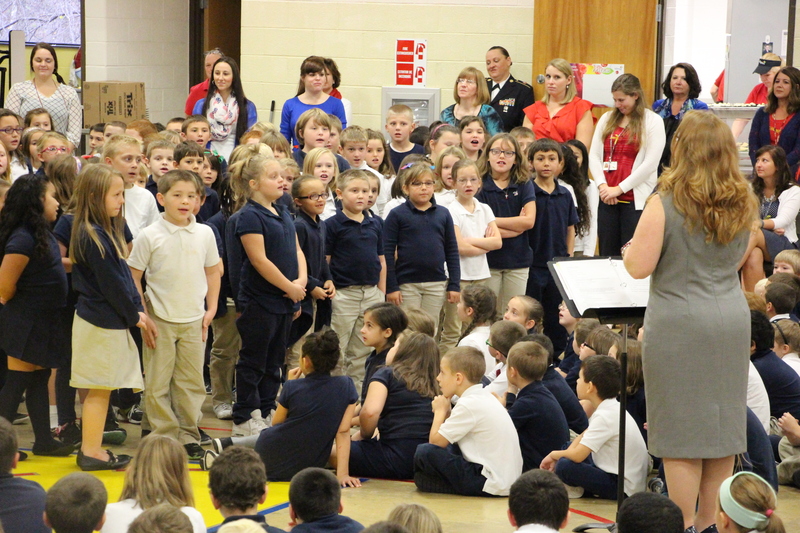 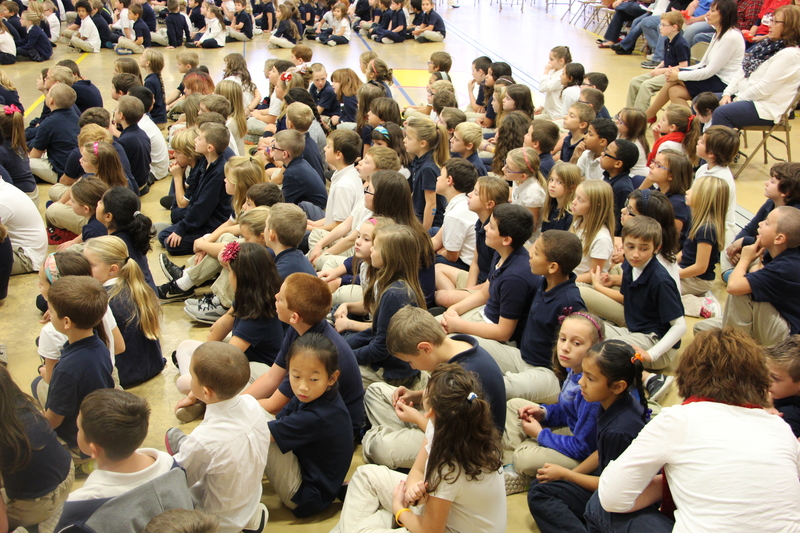 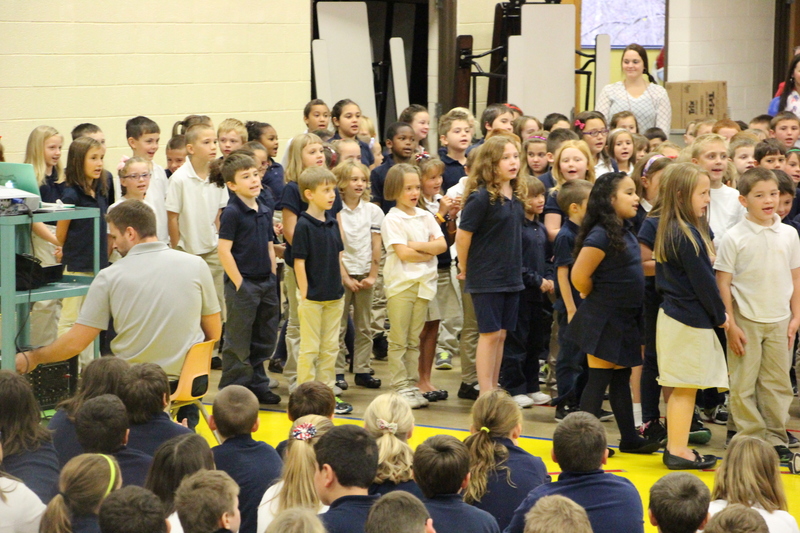 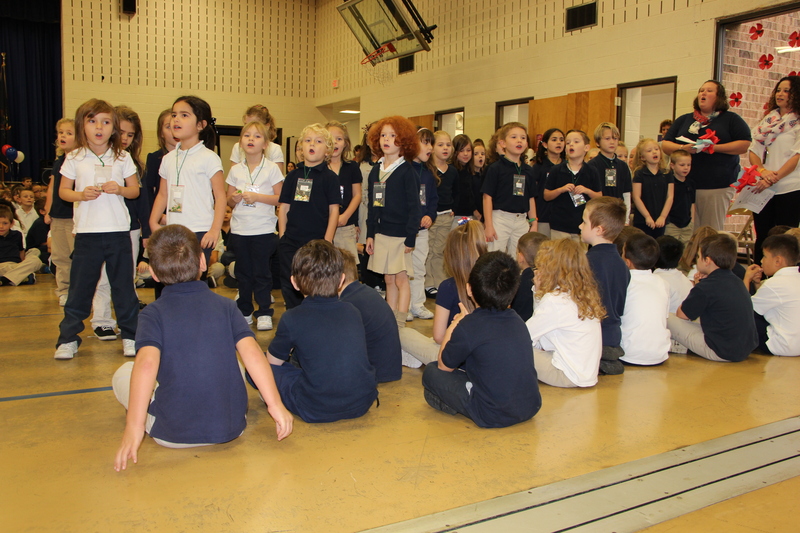 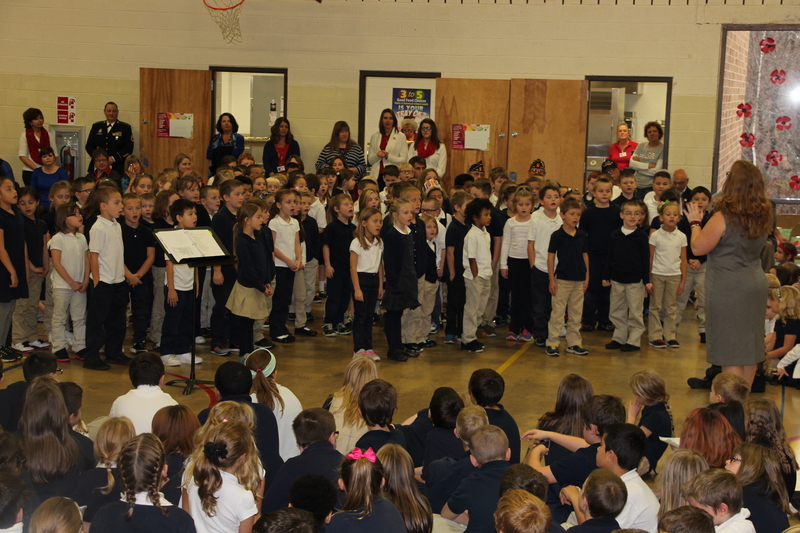 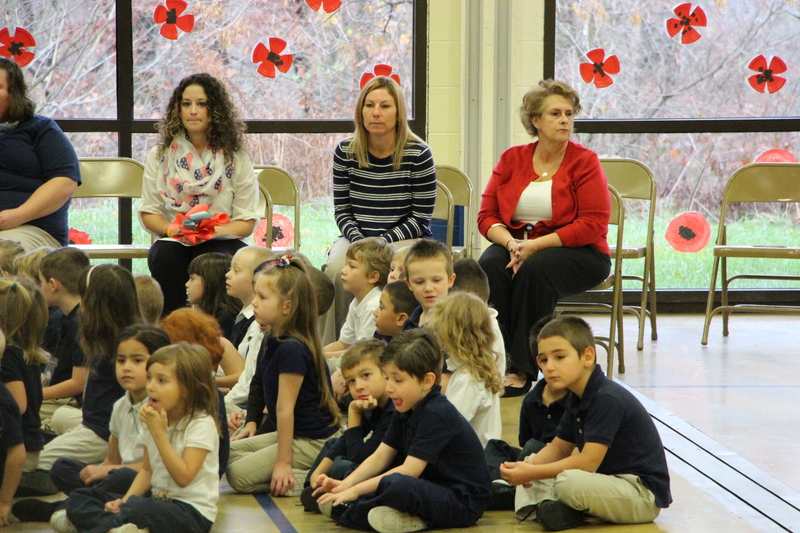 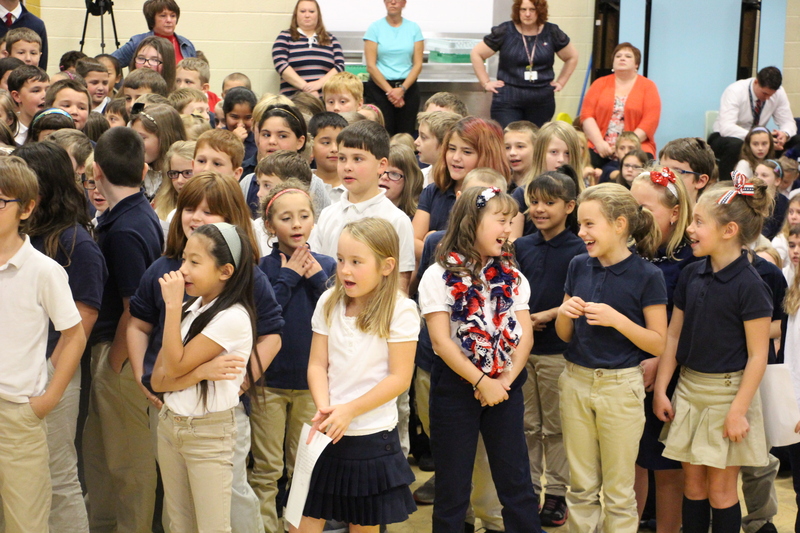 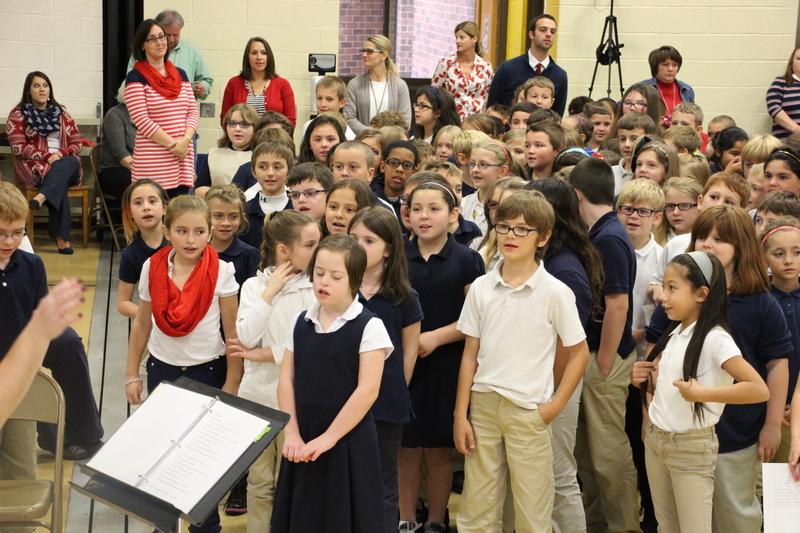 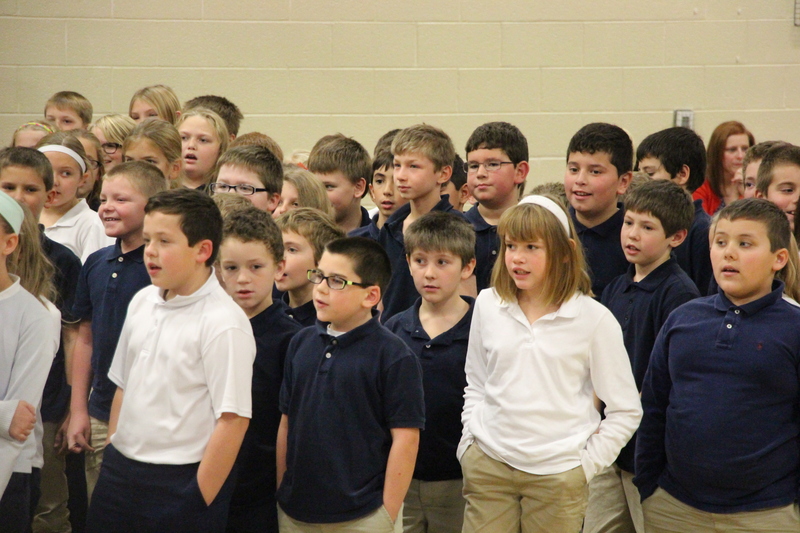 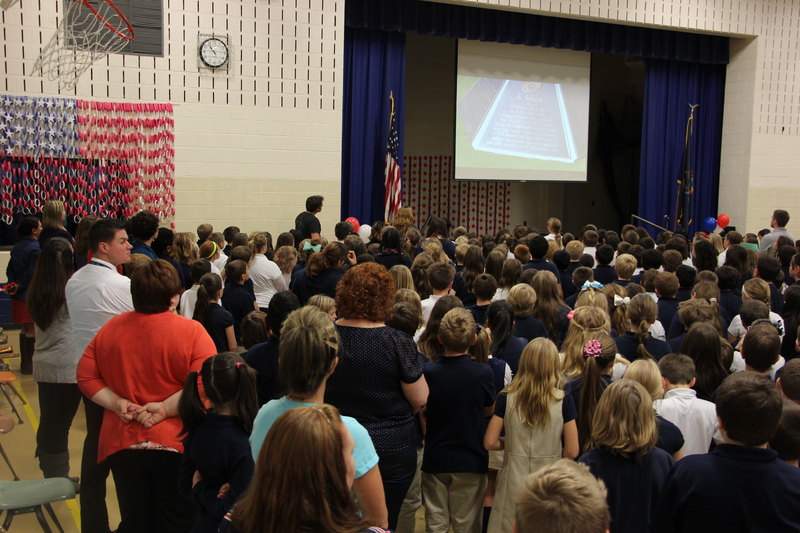 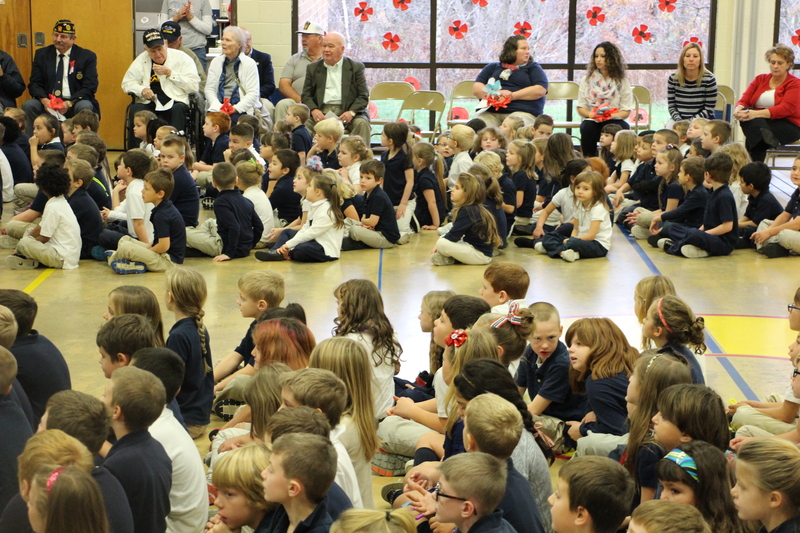 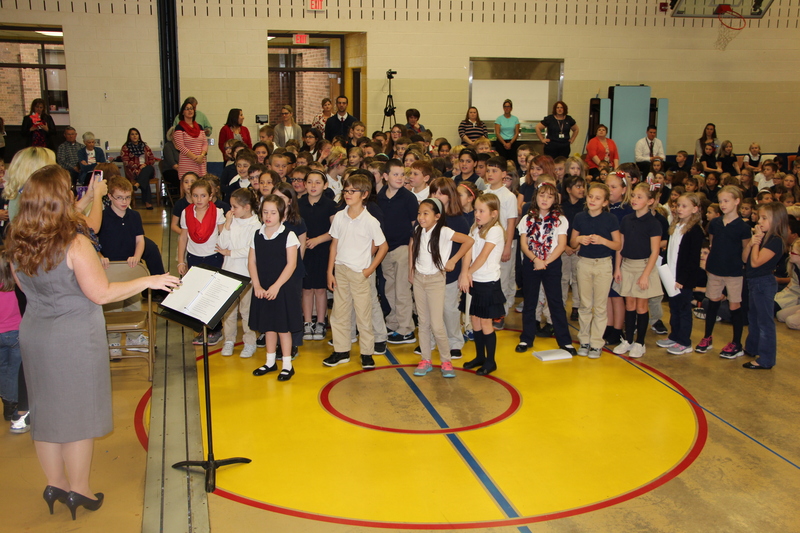 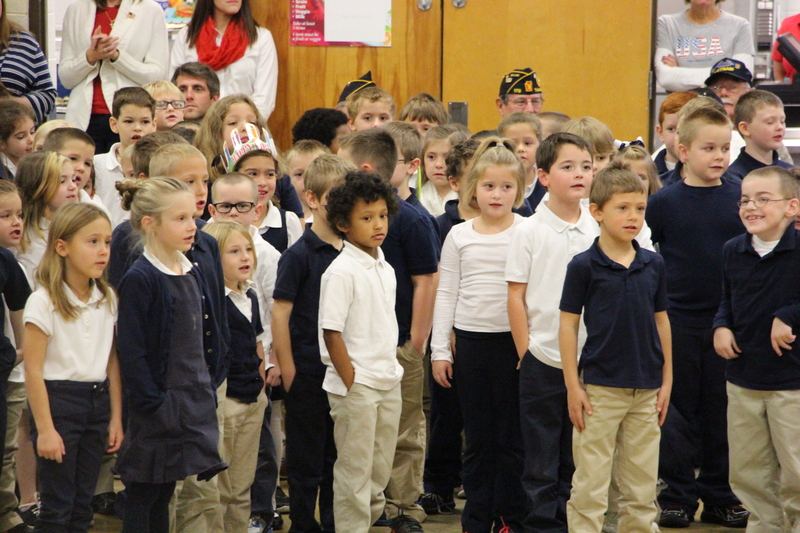 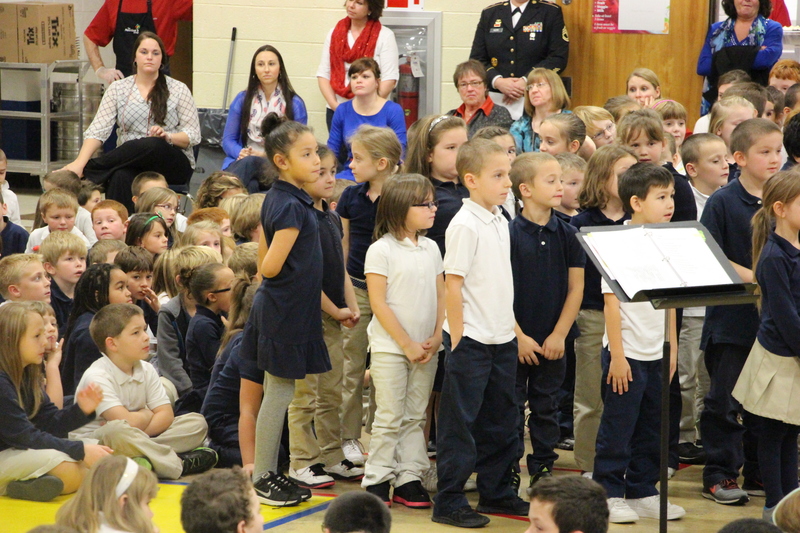 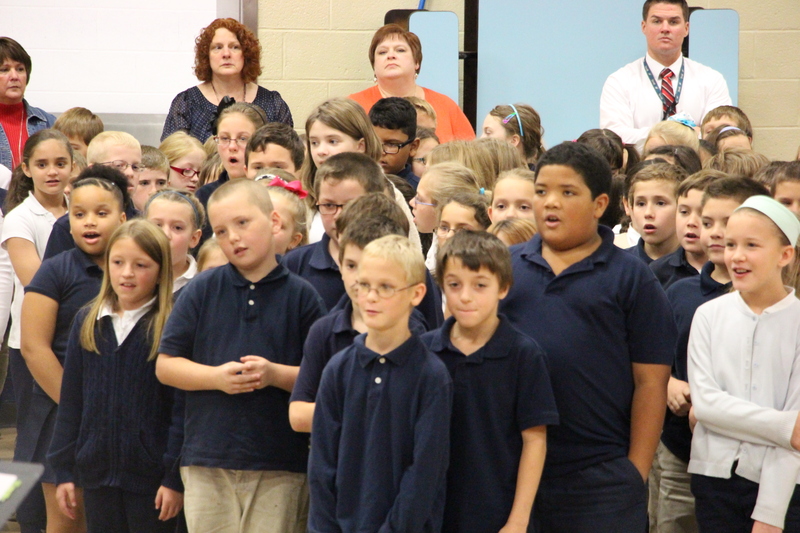 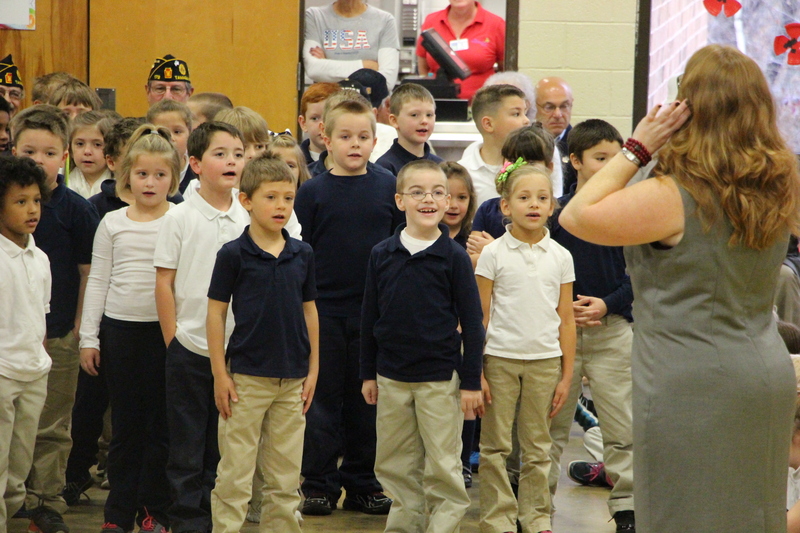 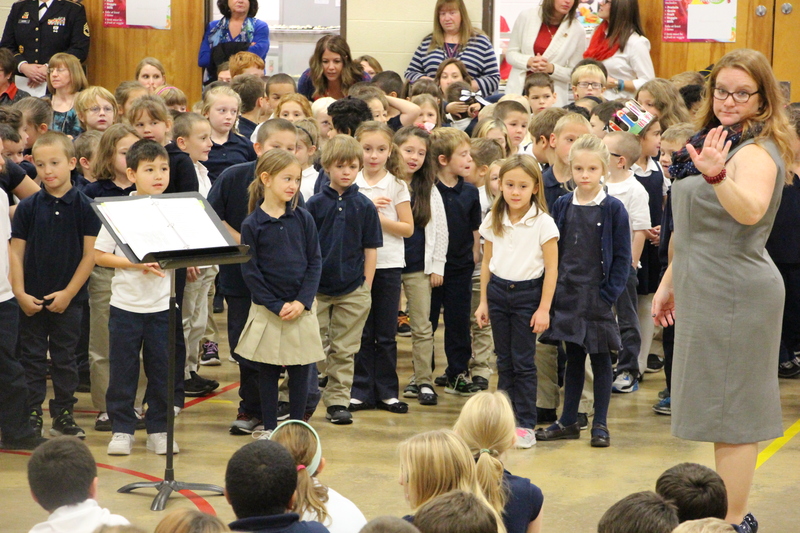 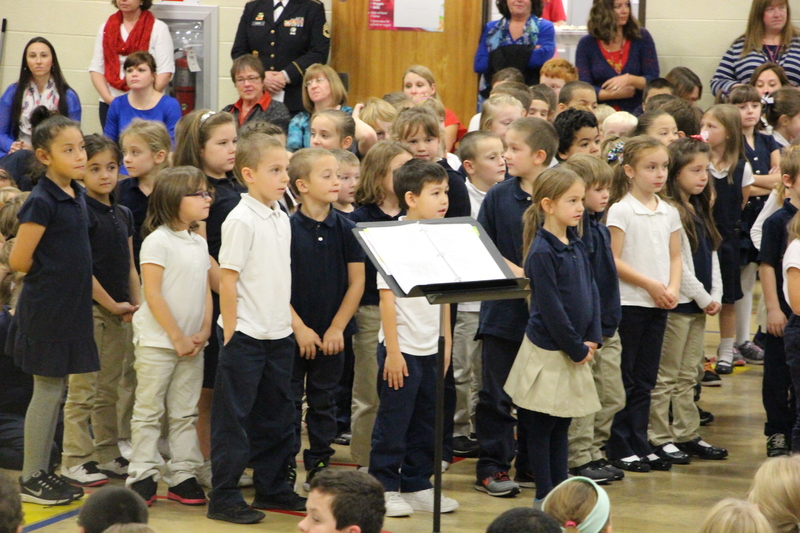 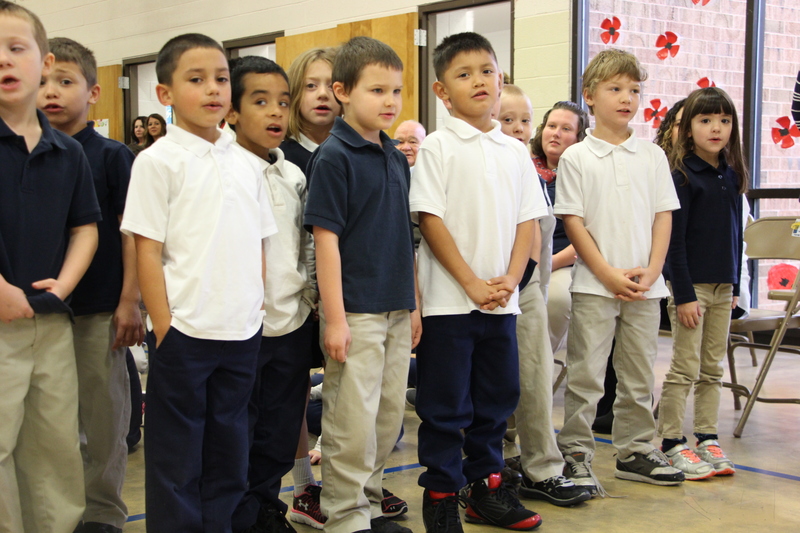 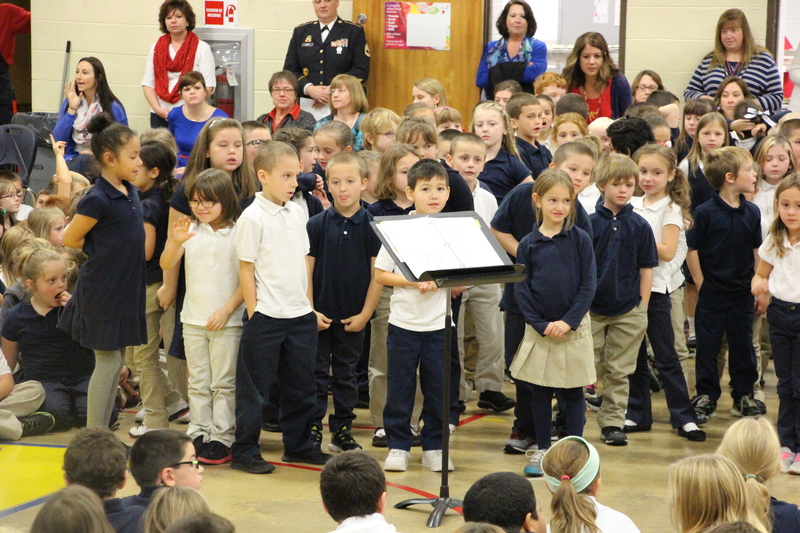 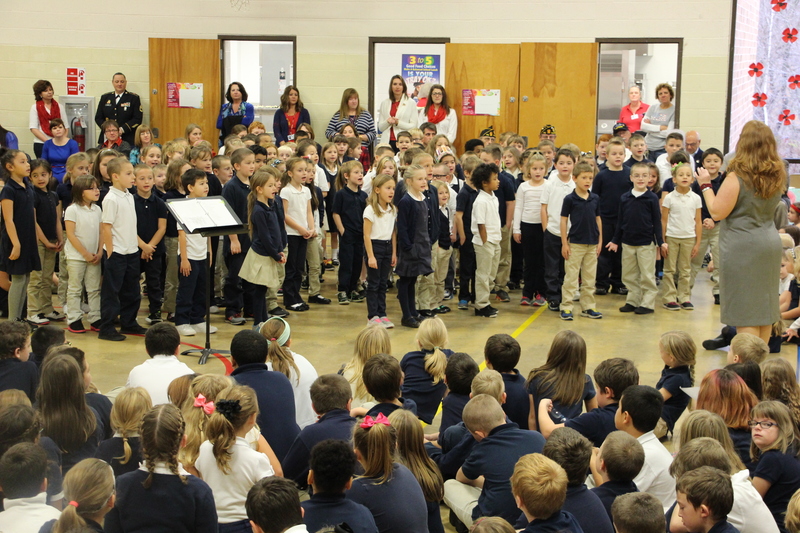 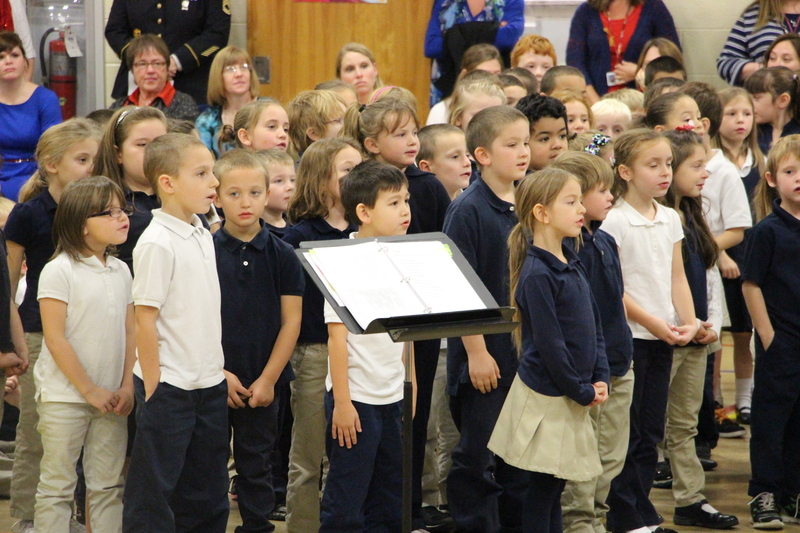 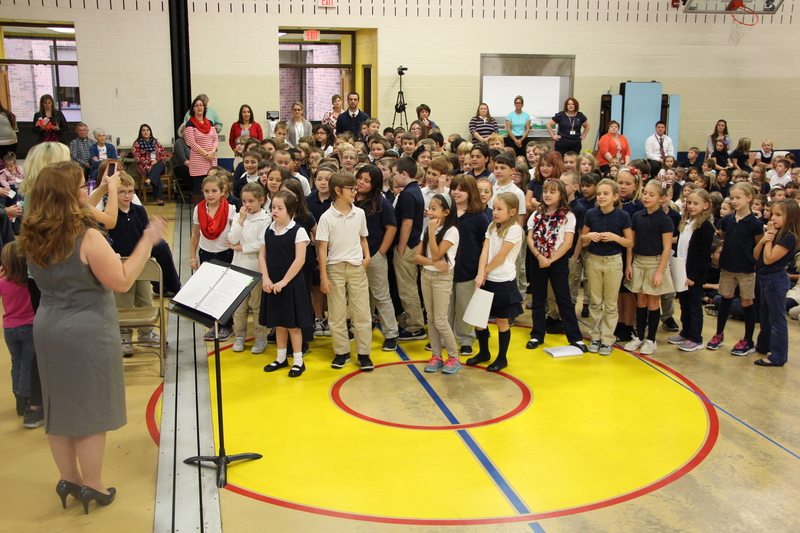 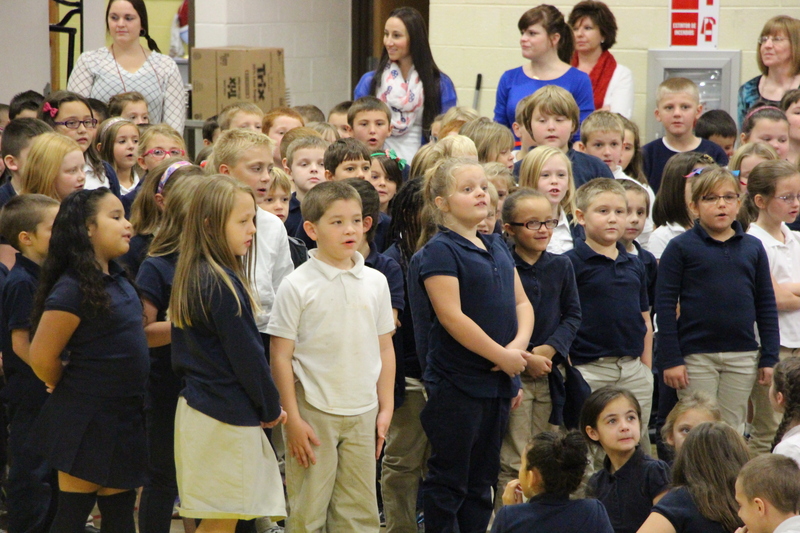 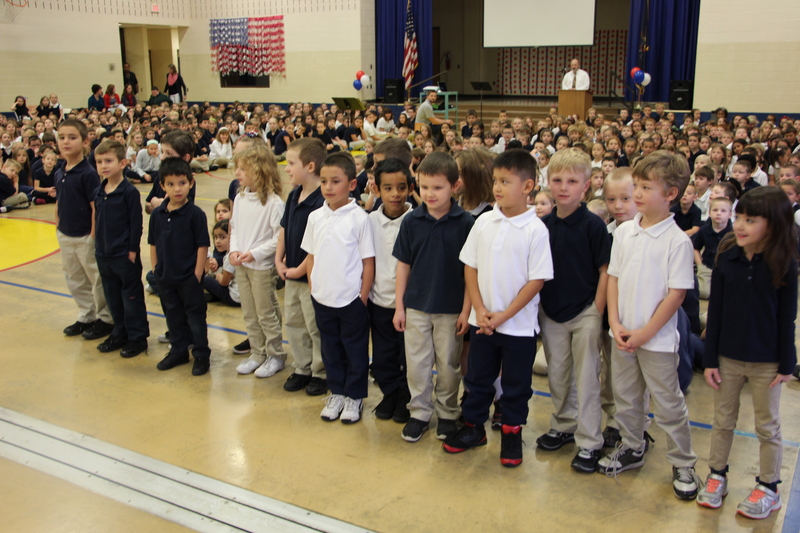 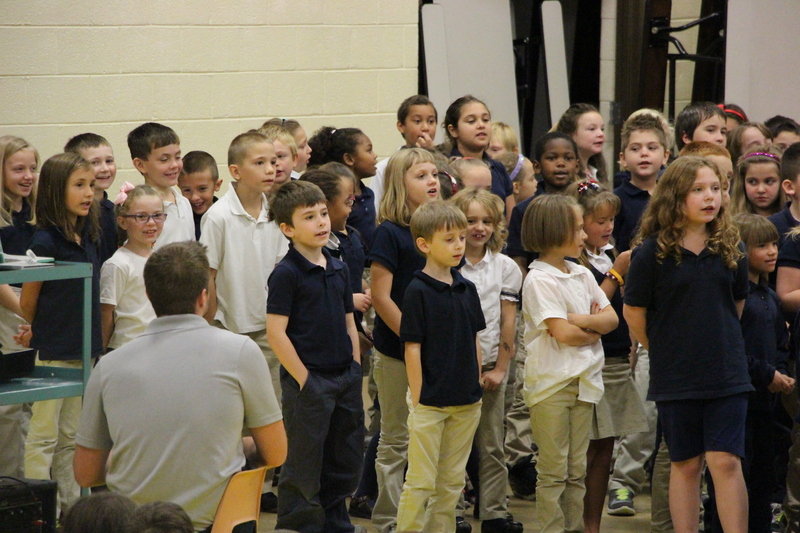 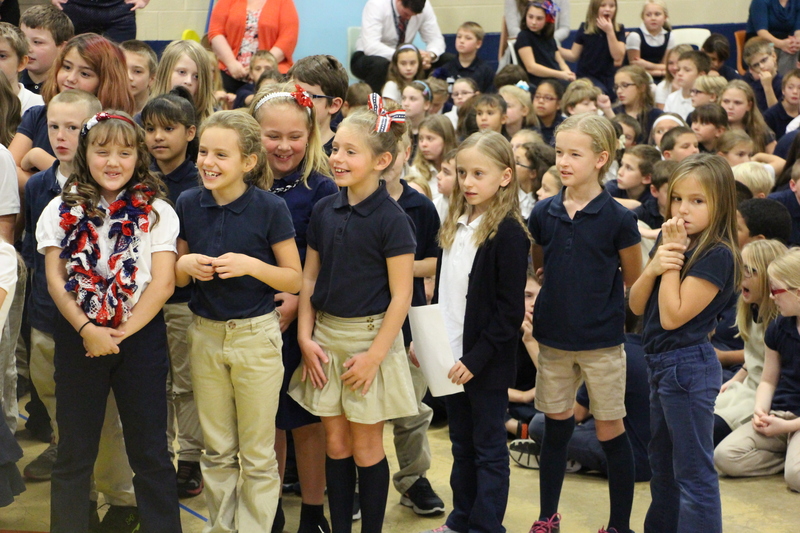 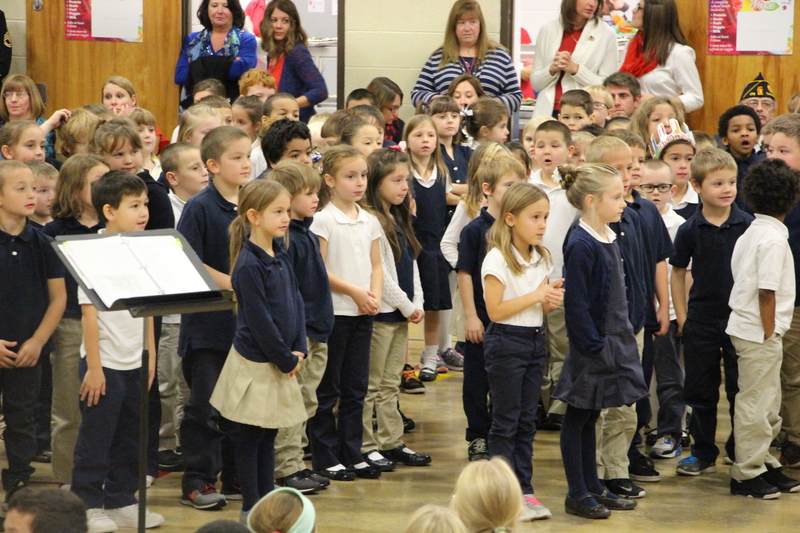 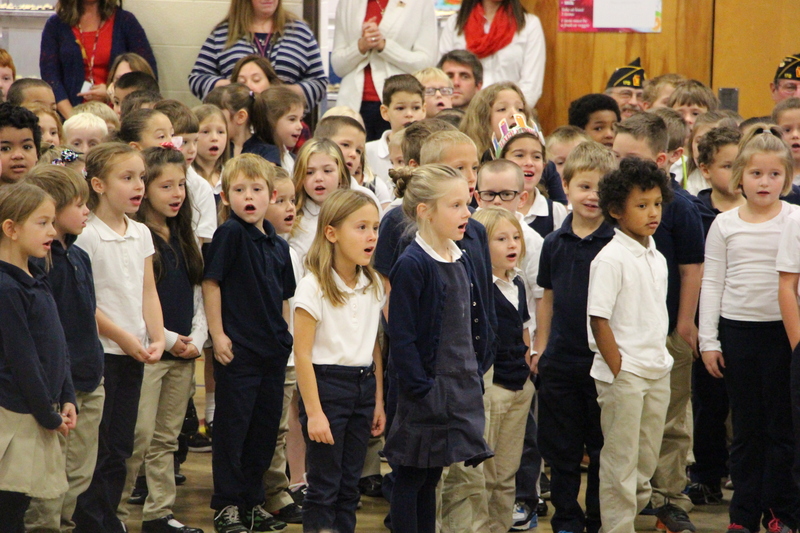 Kindergarten students sang “Veterans, We Thank You”. 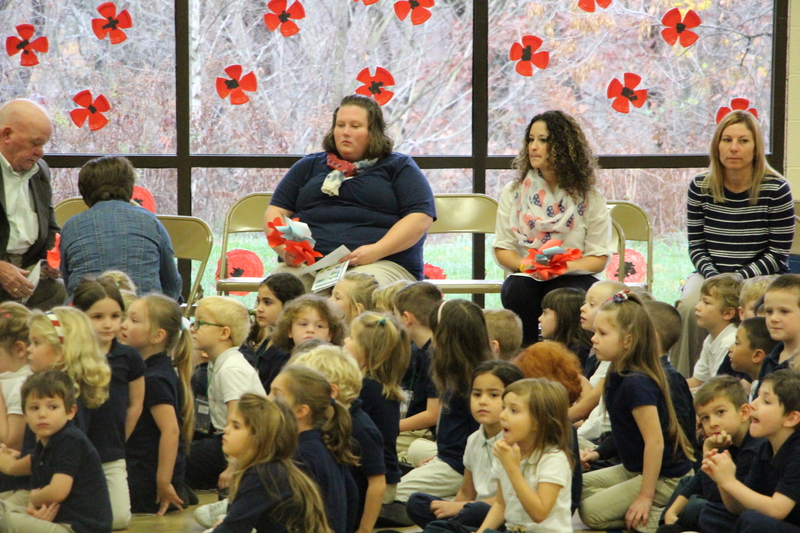 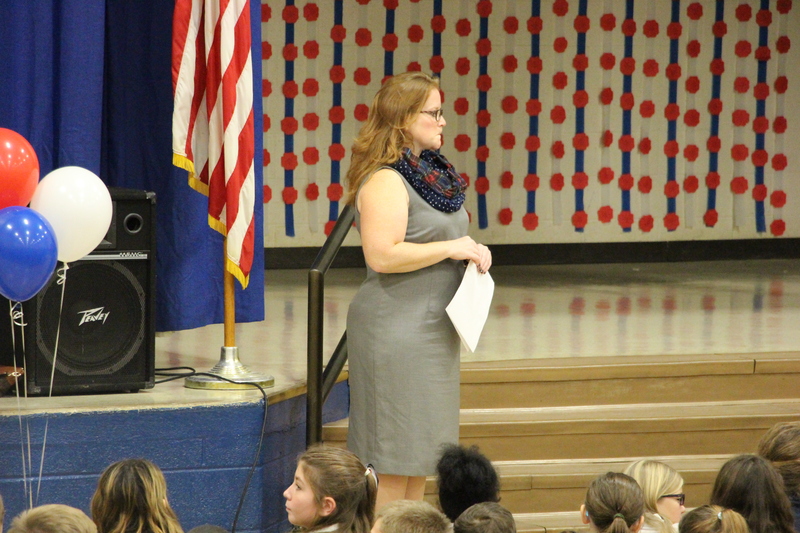 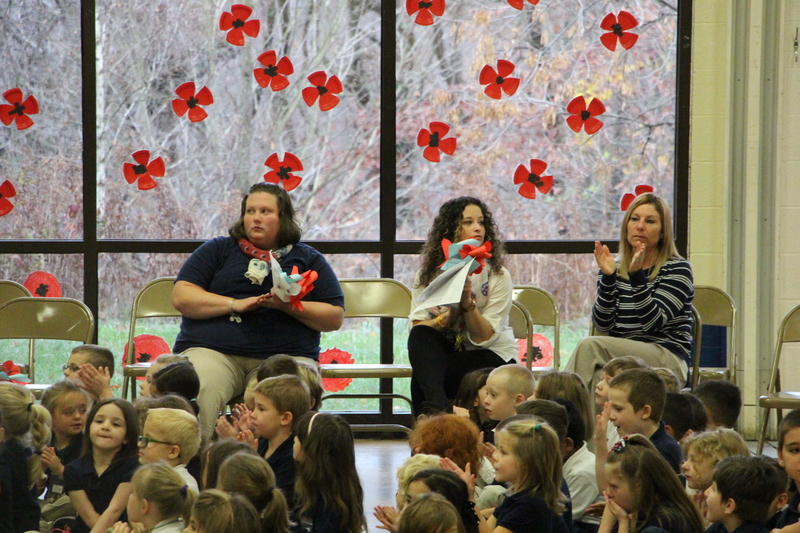 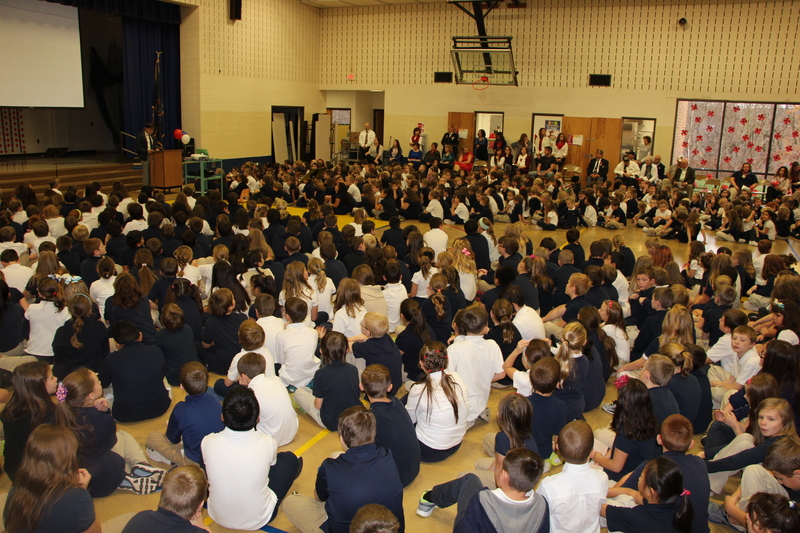 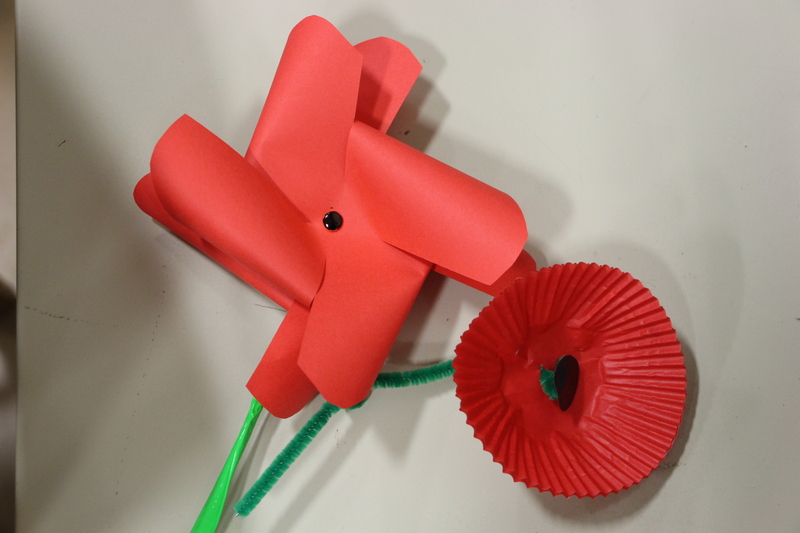 Program coordinator and music teacher Samantha Yachera spoke about why poppies are so important. 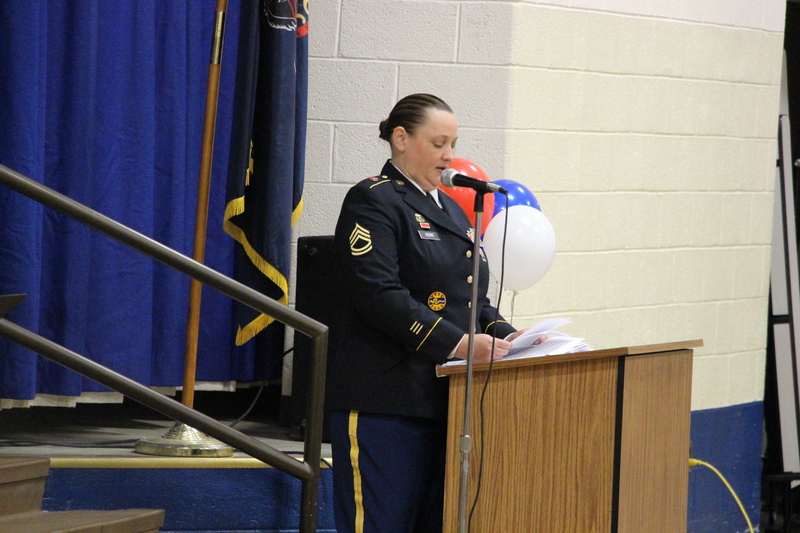 Guest speaker was SFC Amanda Kerr. 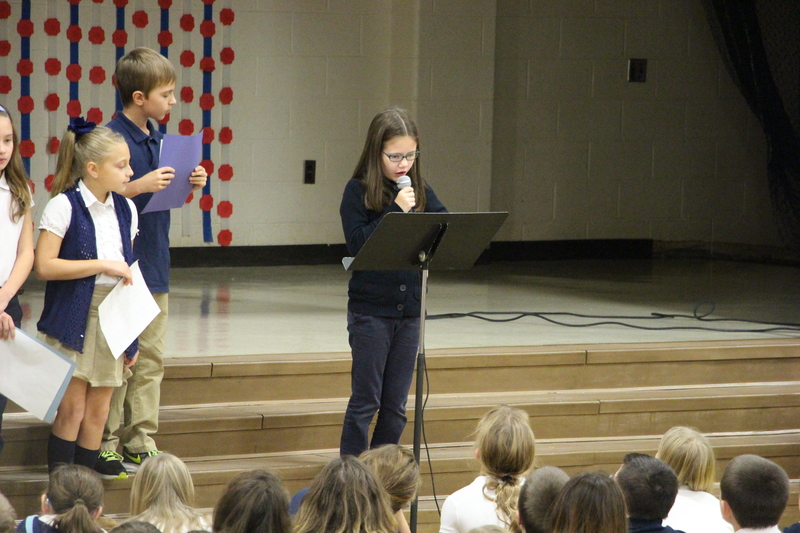 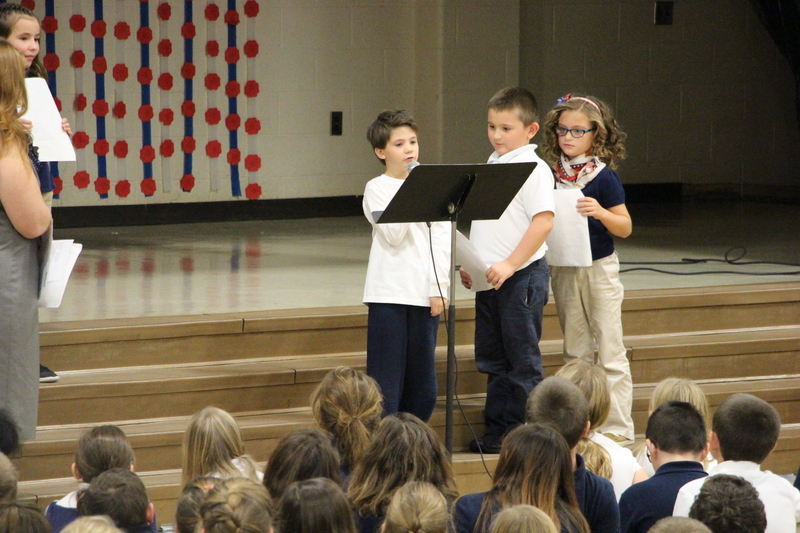 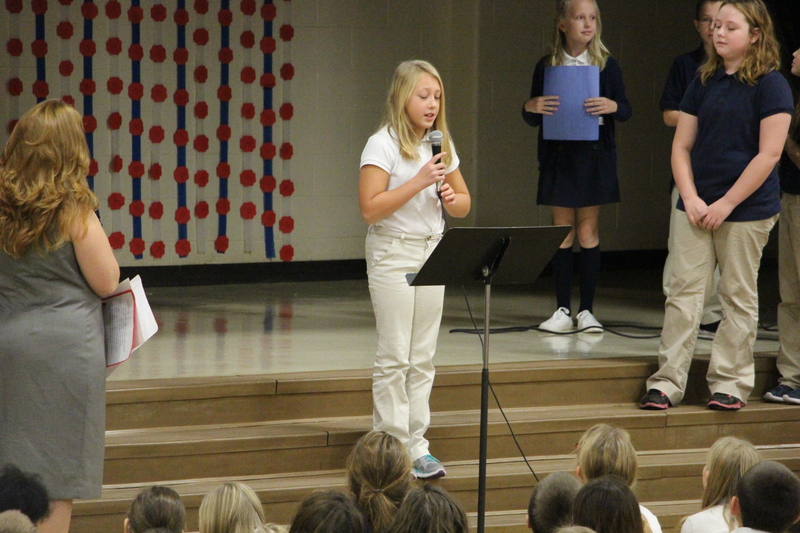 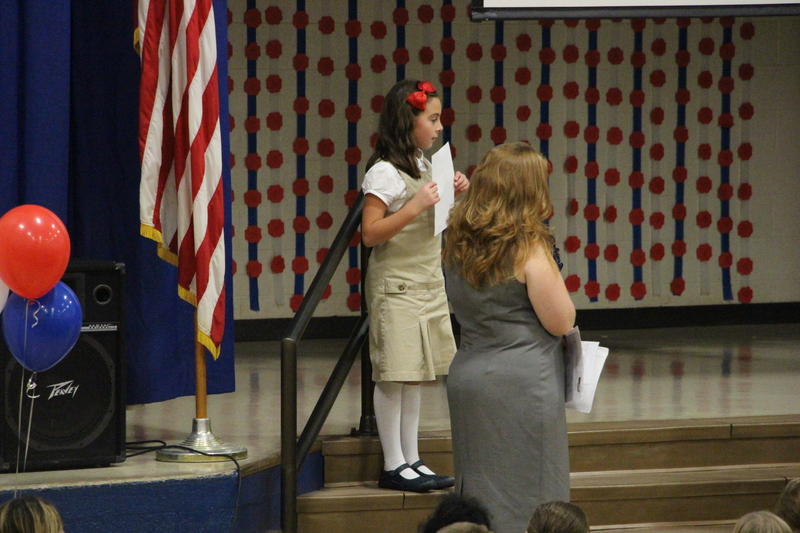 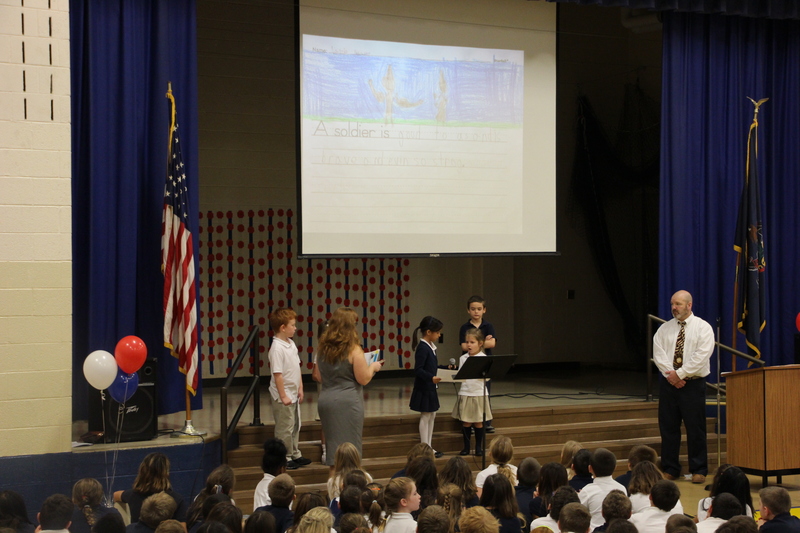 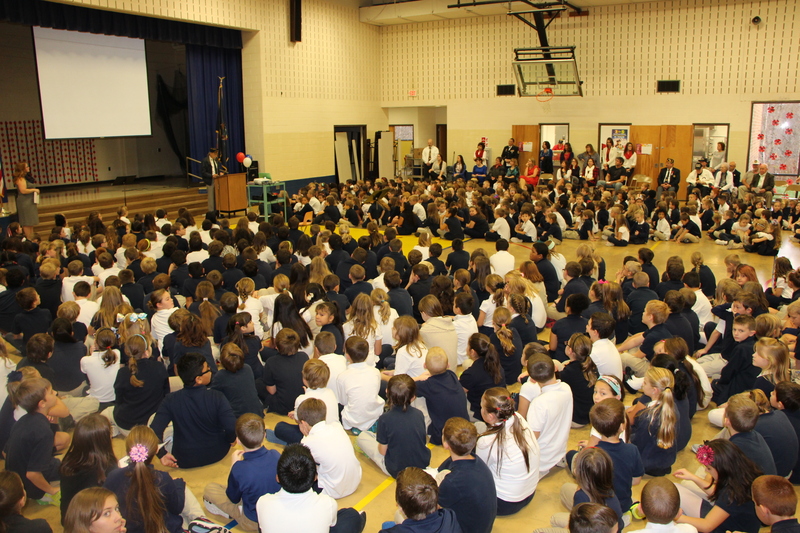 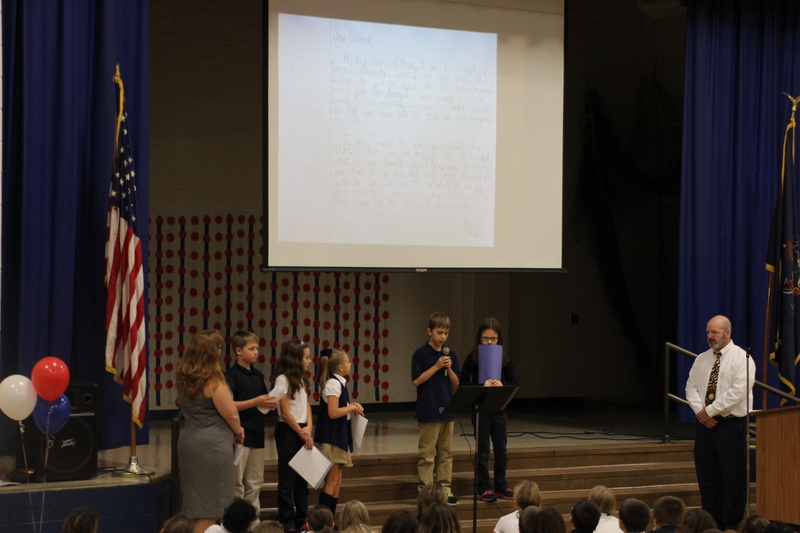 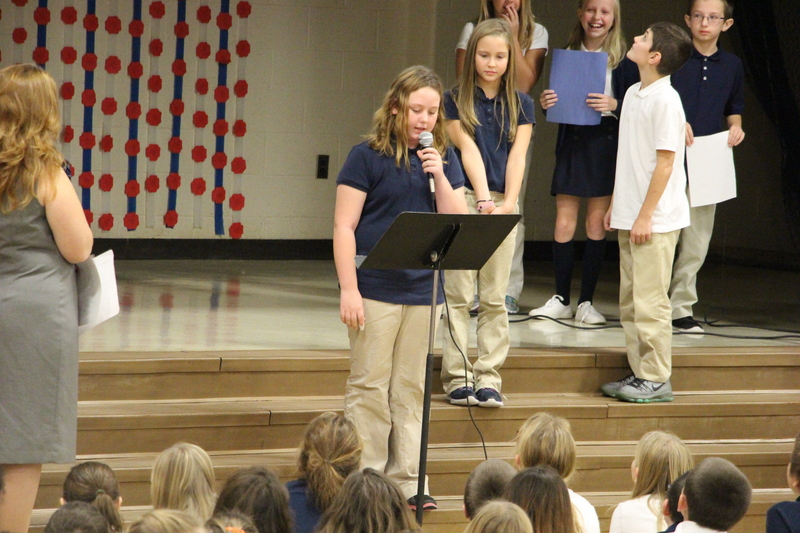 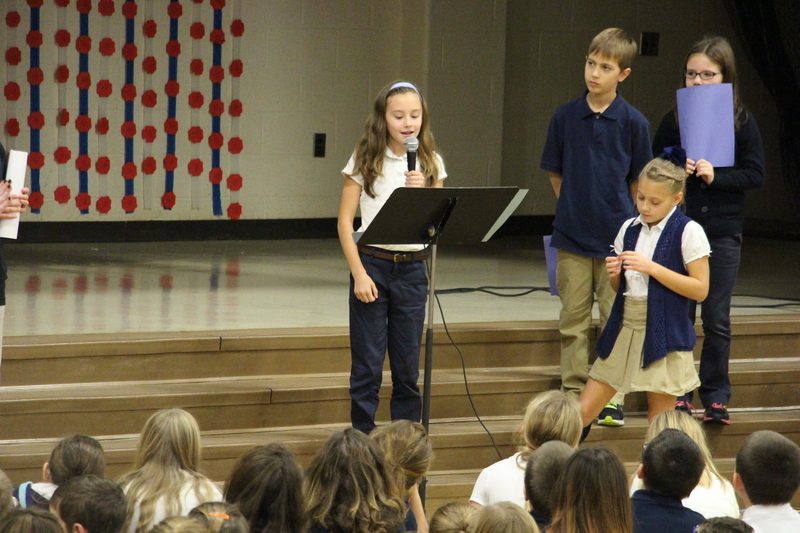 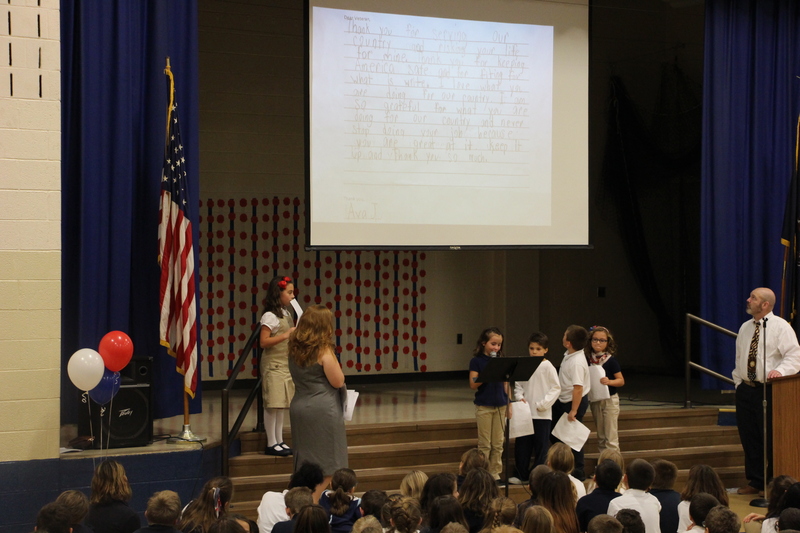 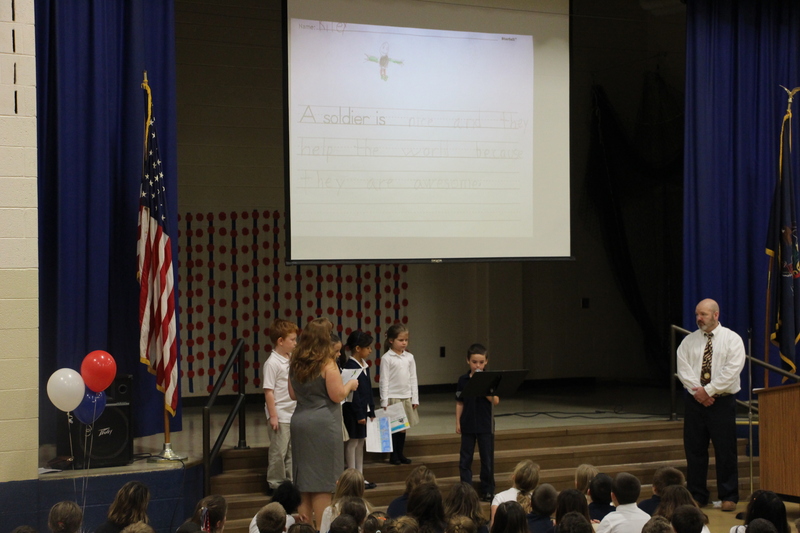 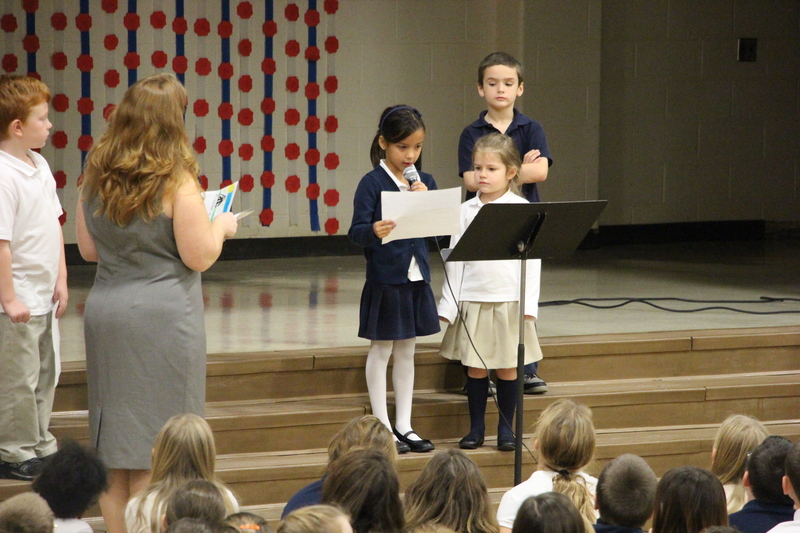 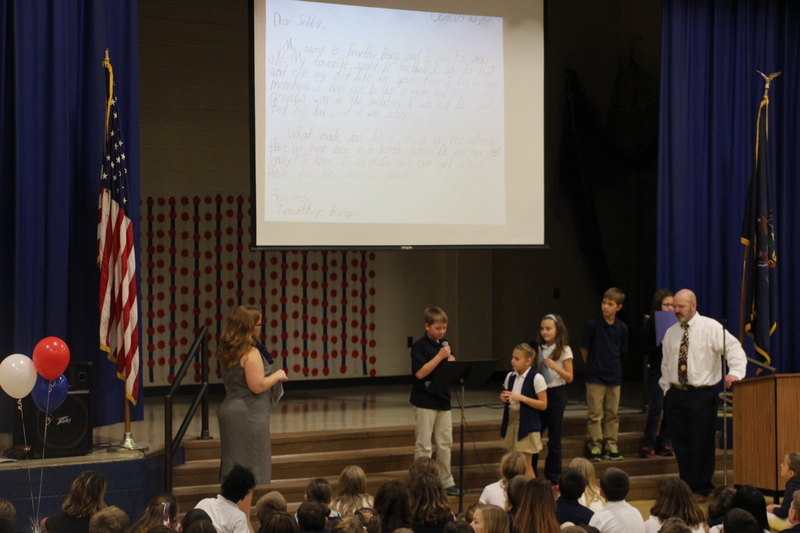 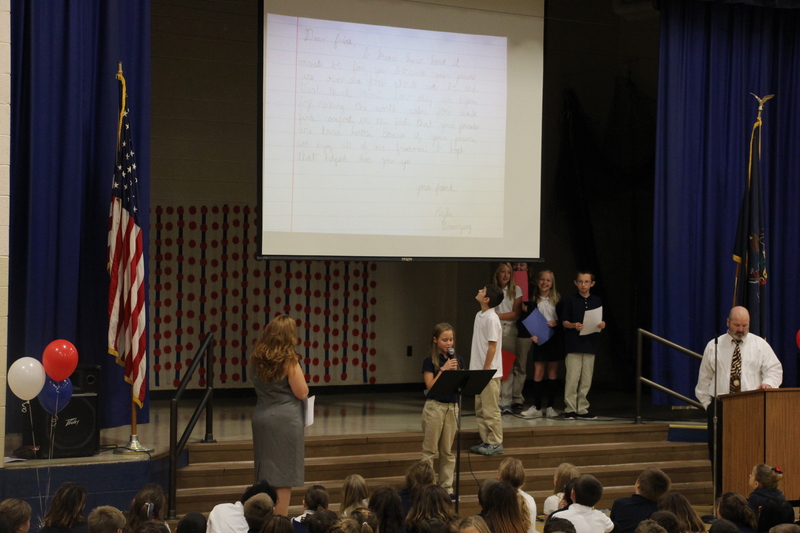 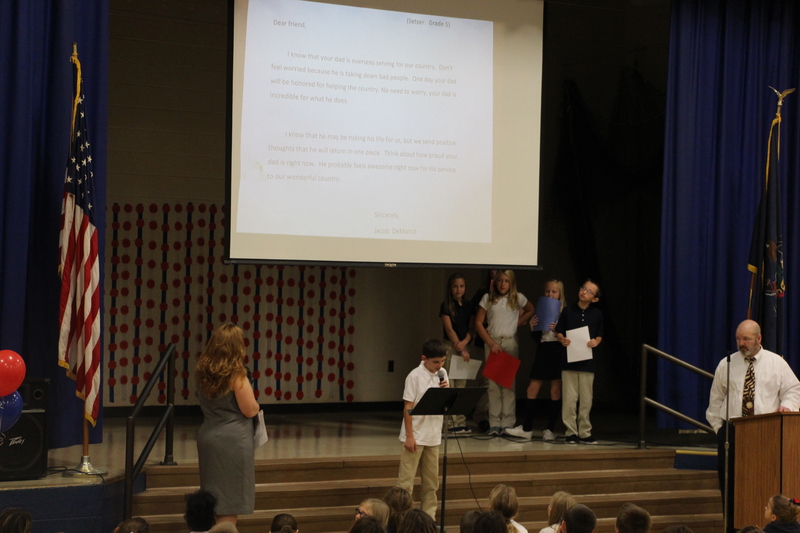 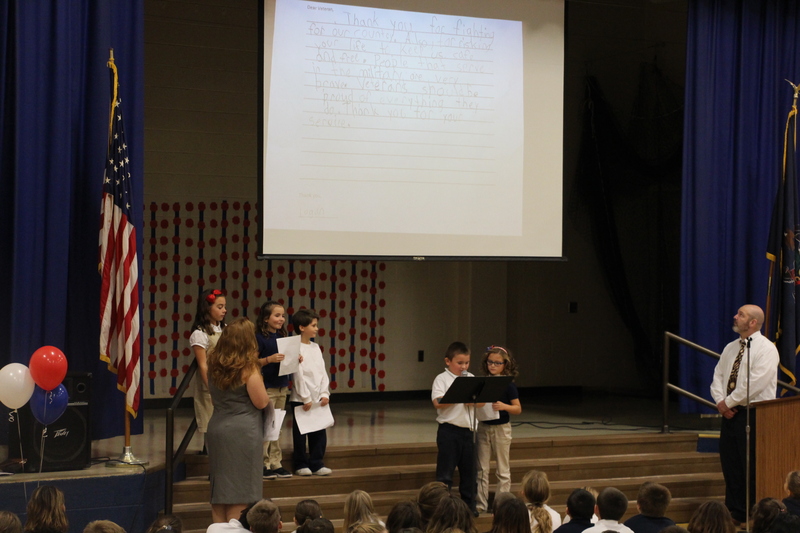 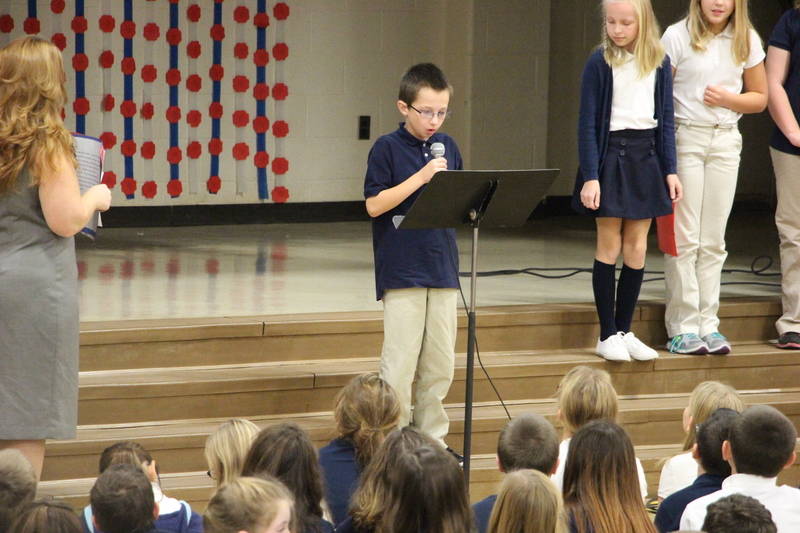 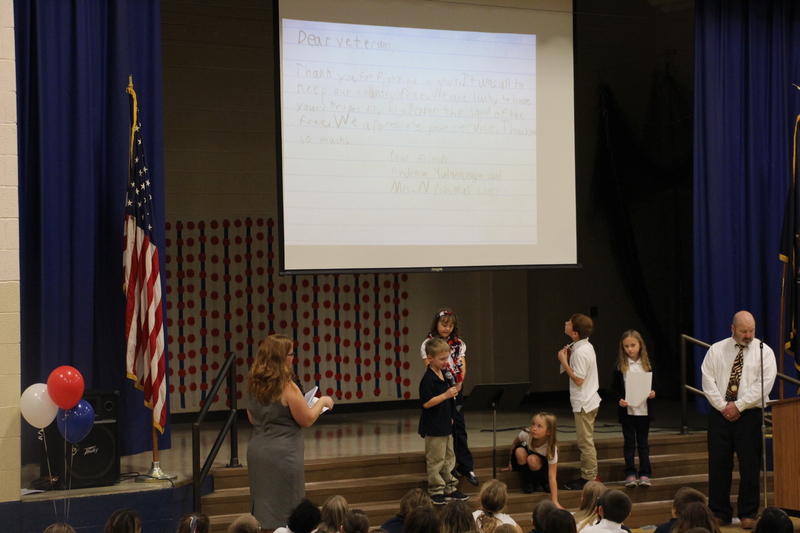 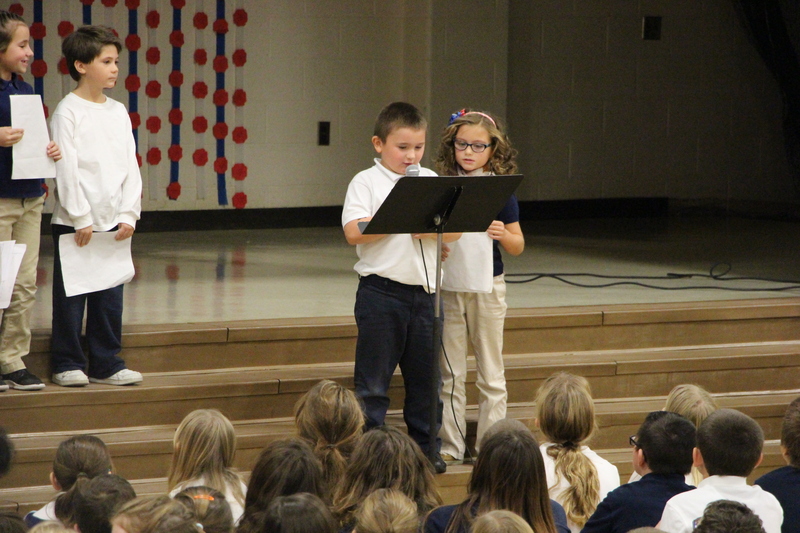 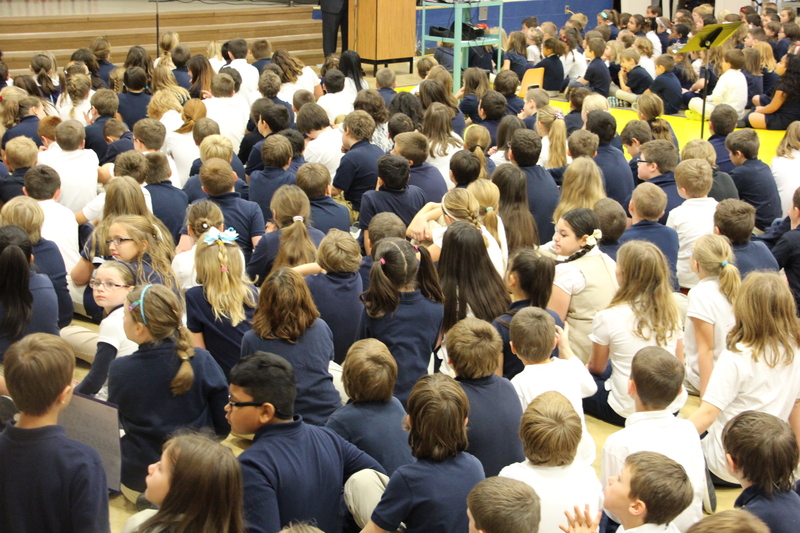 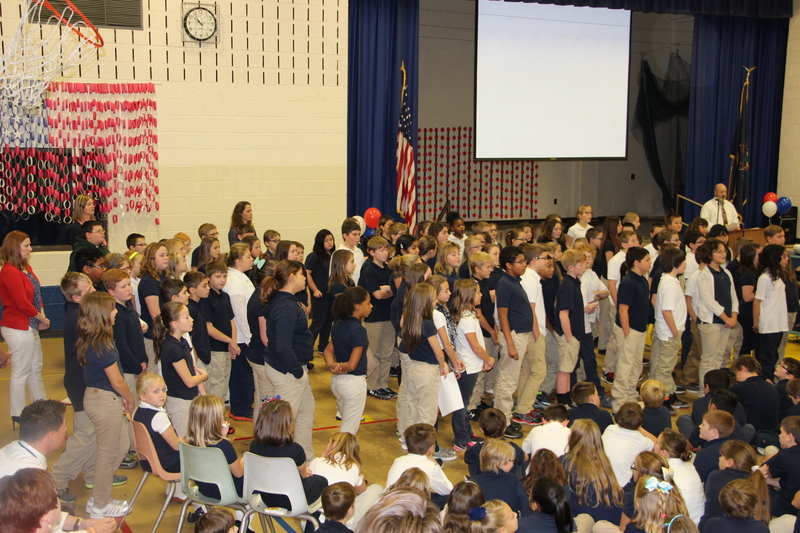 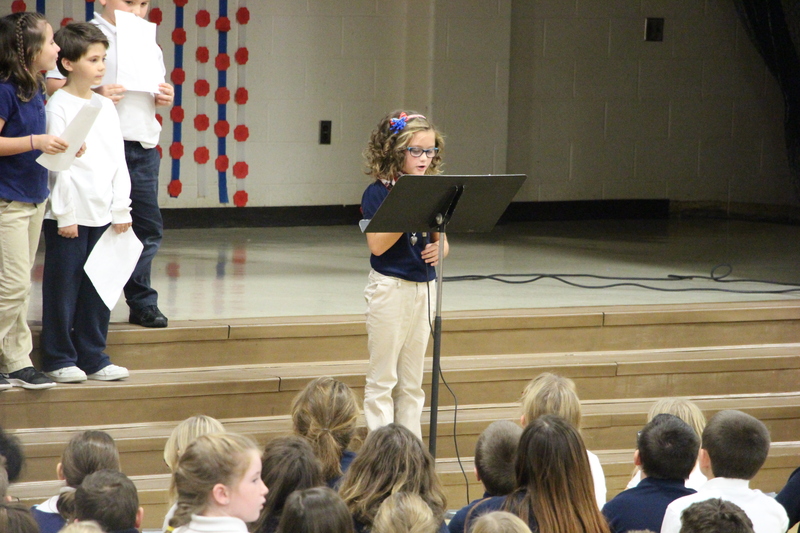 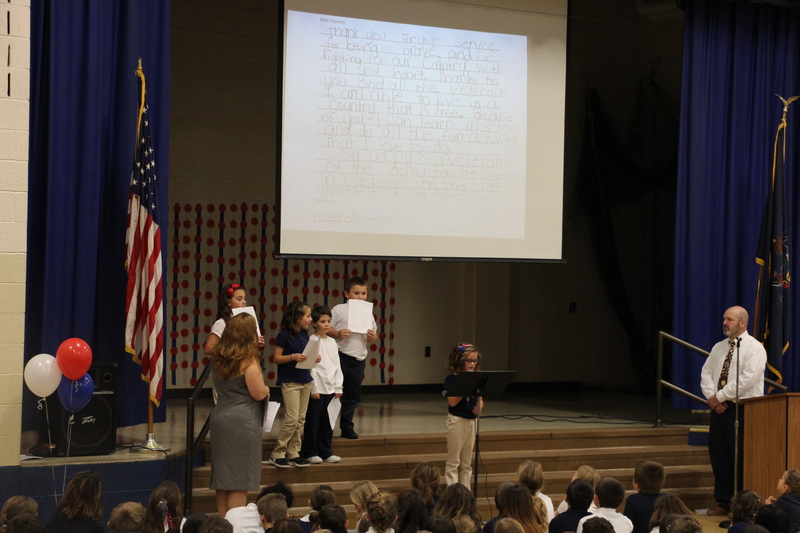 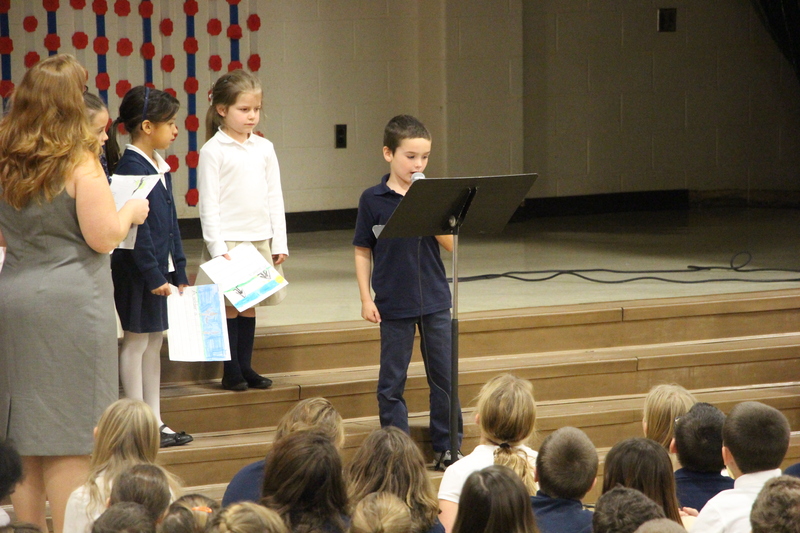 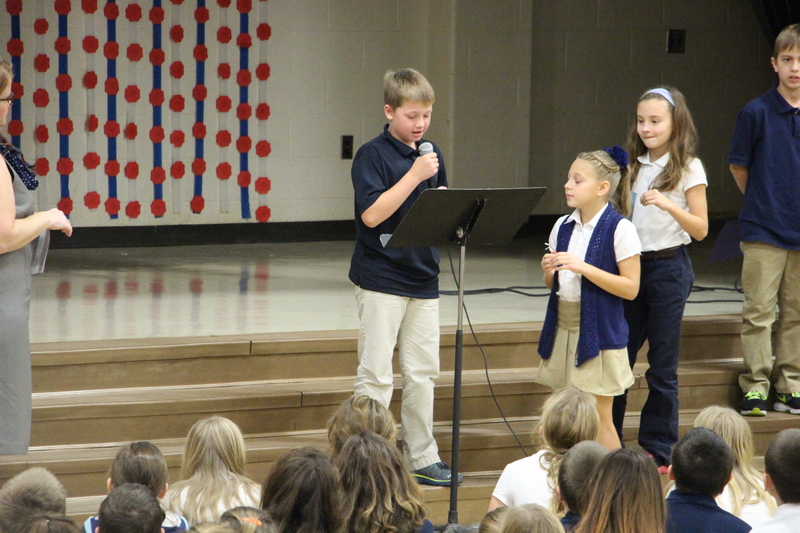 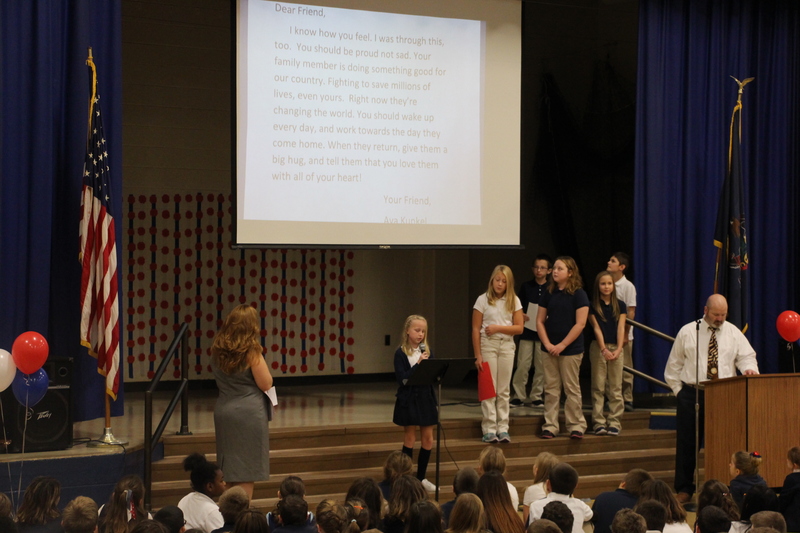 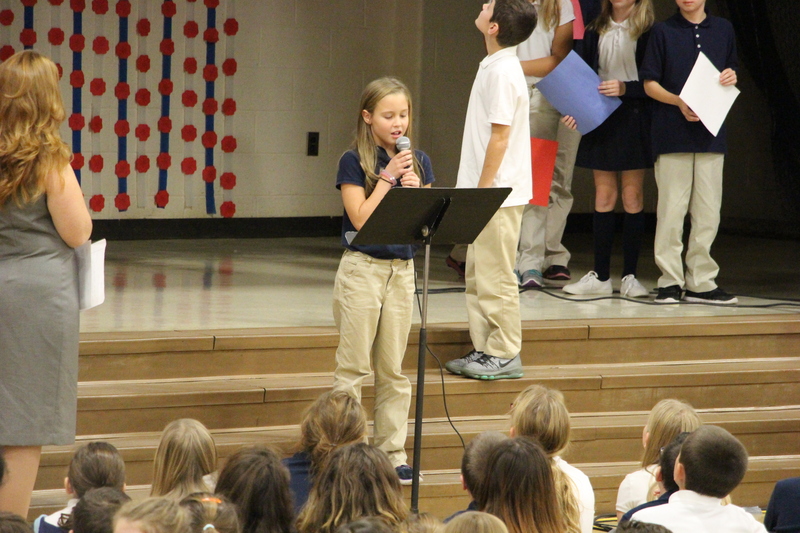 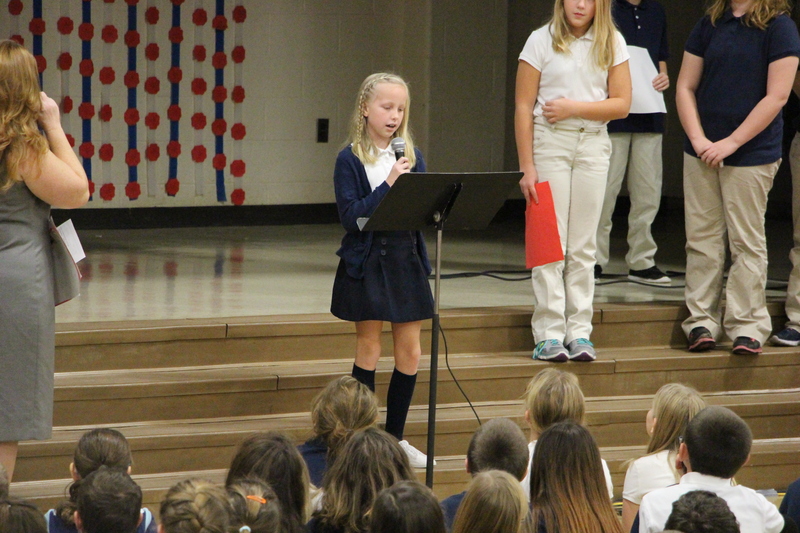 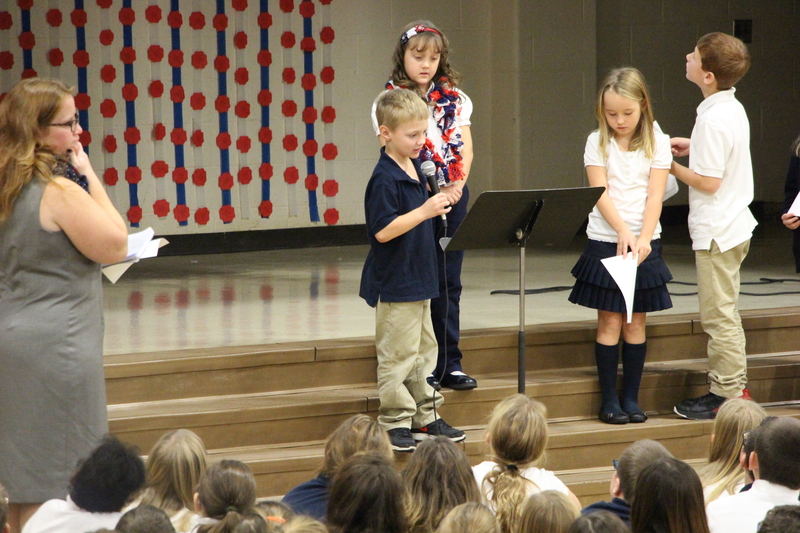 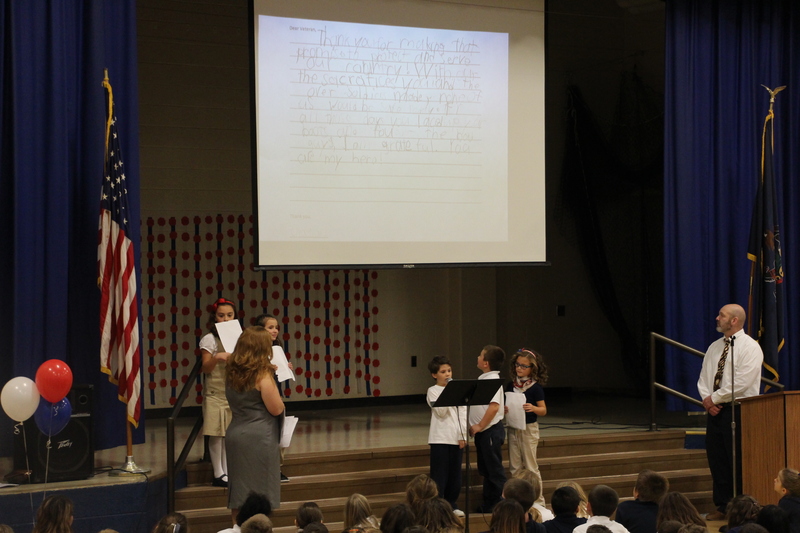 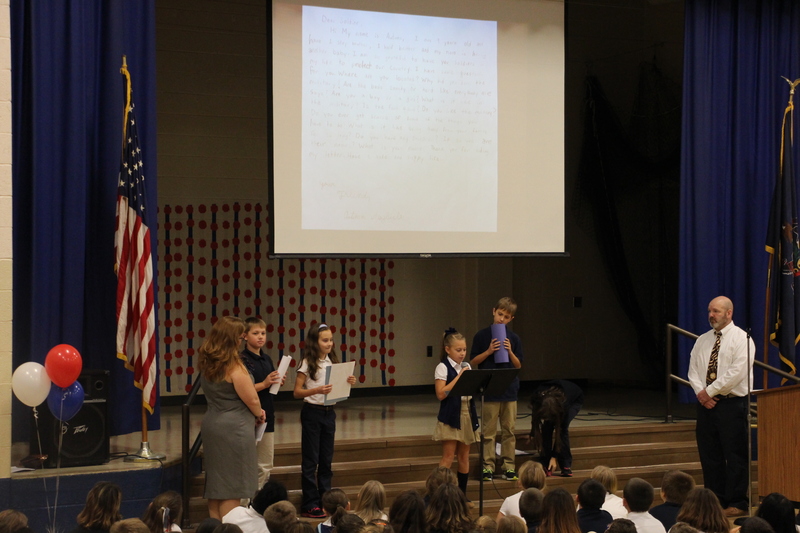 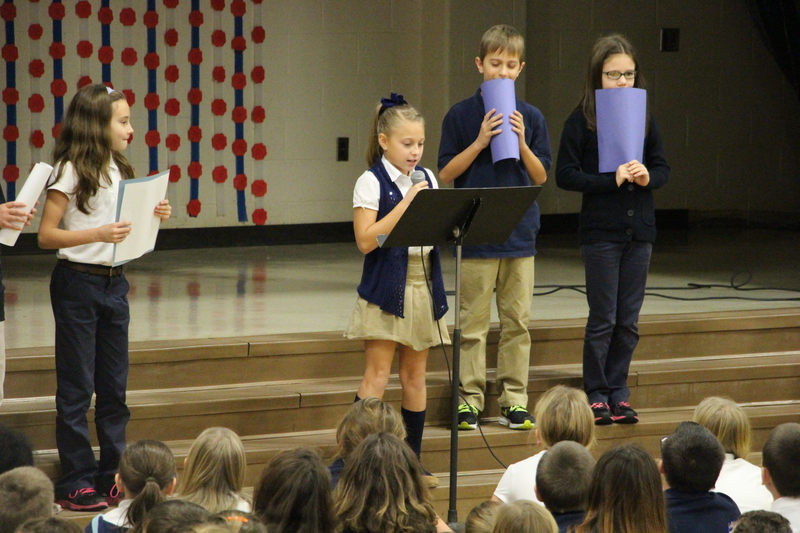 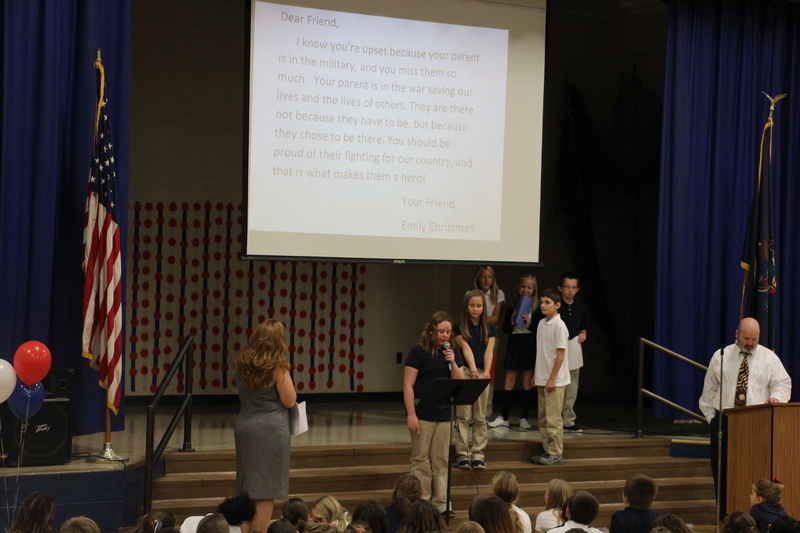 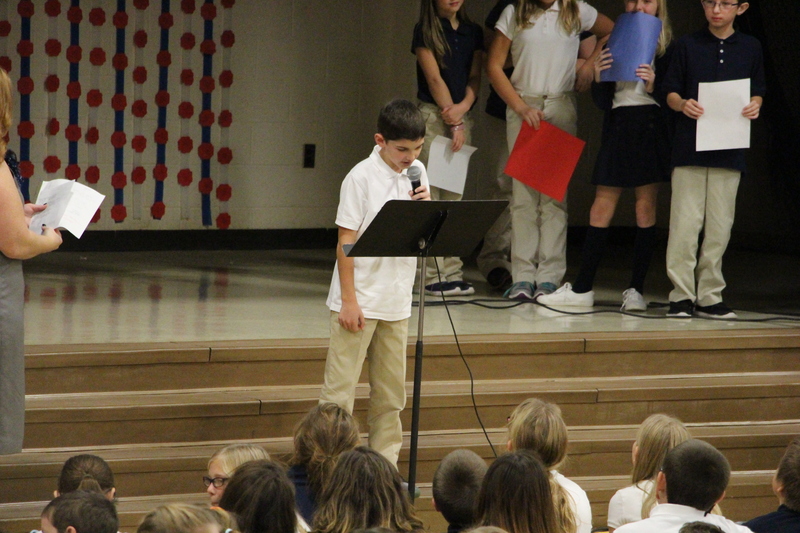 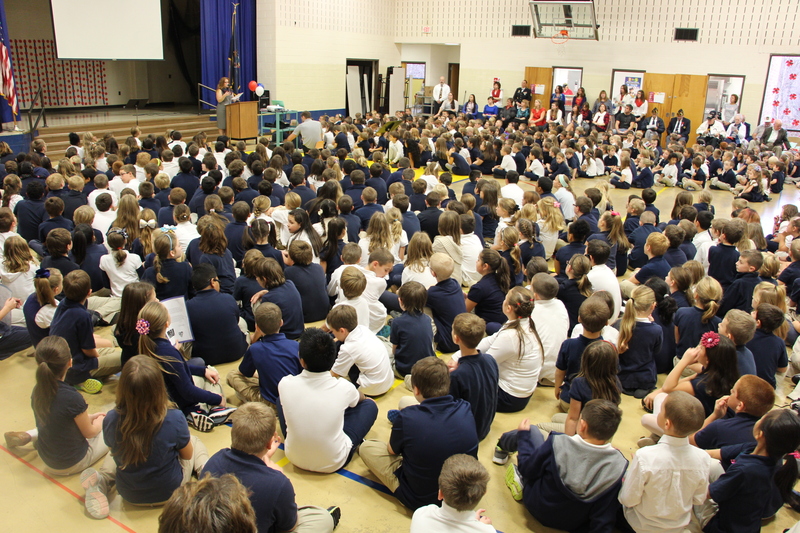 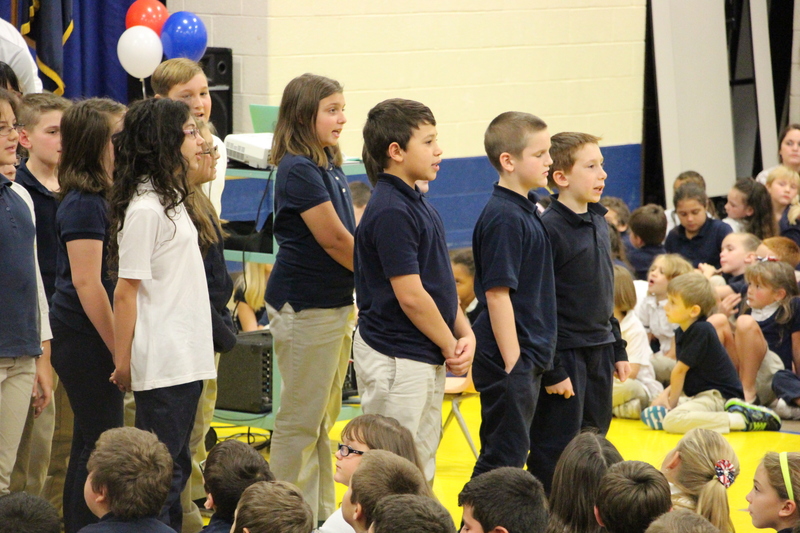 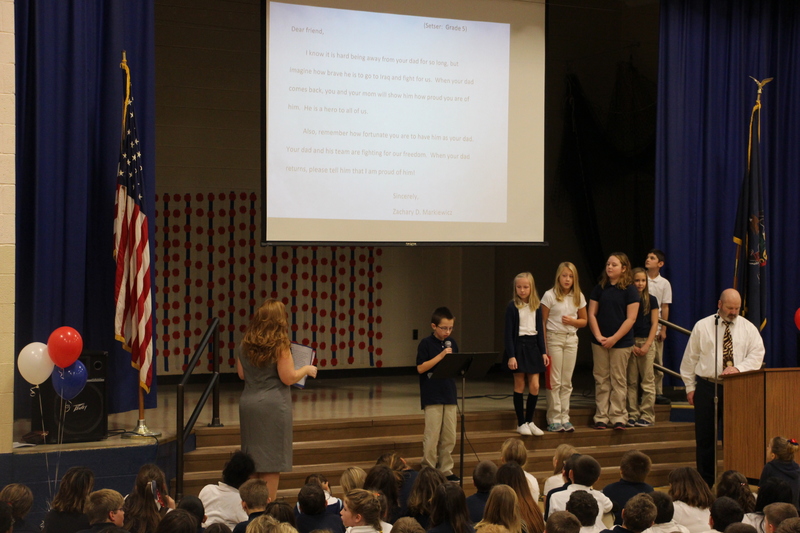 Select third grade students read aloud Letters to Wounded Warriors. 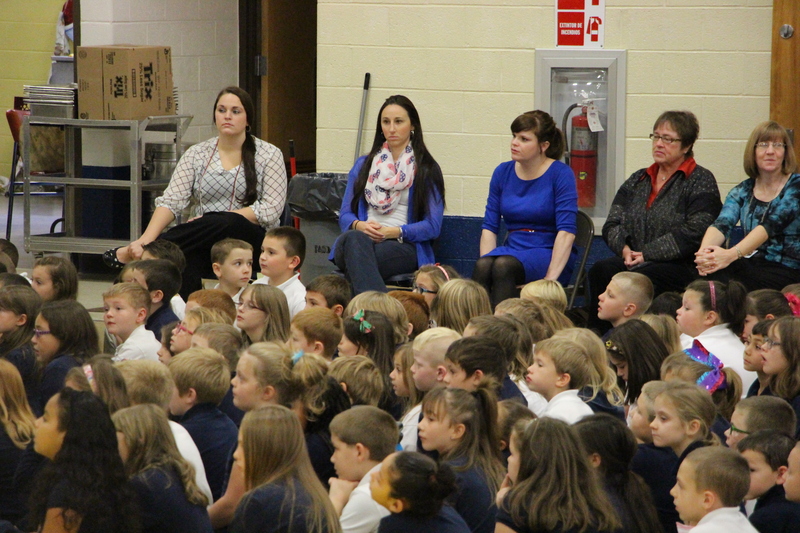 Students were Tammilynn McGeehan, Kendra Forester, Cadance Fannock, Denny Krell, and Andrew Yulanavage. 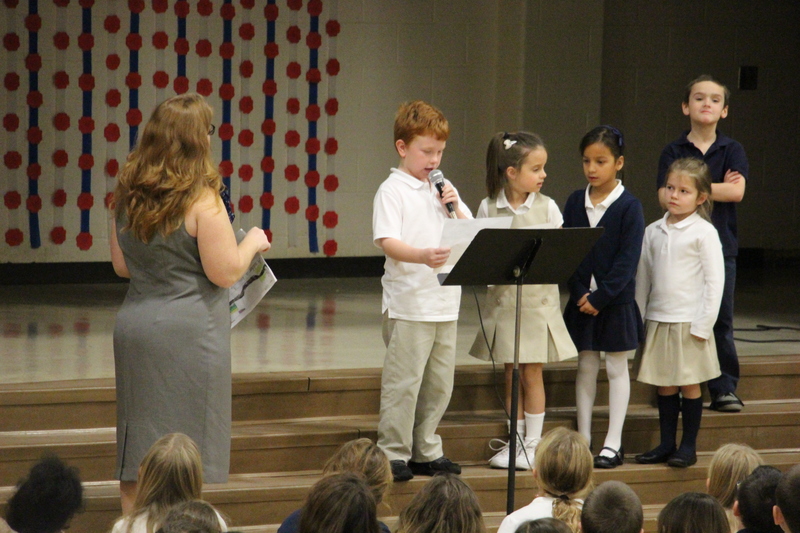 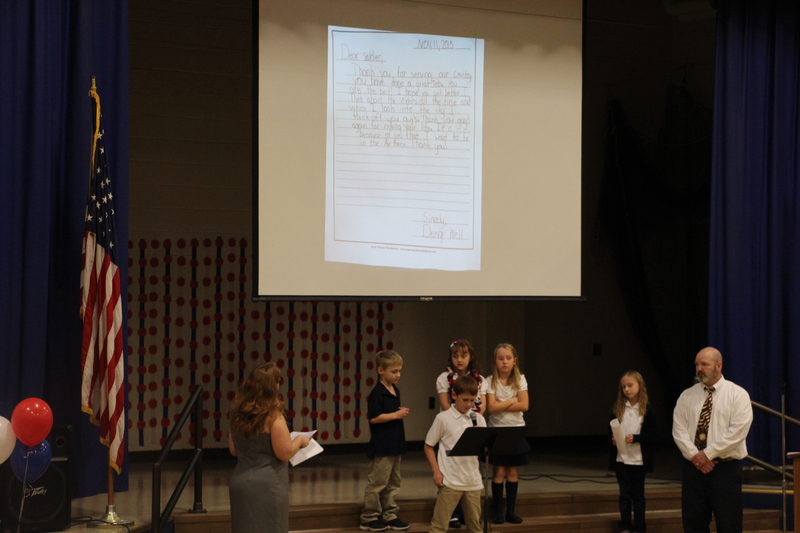 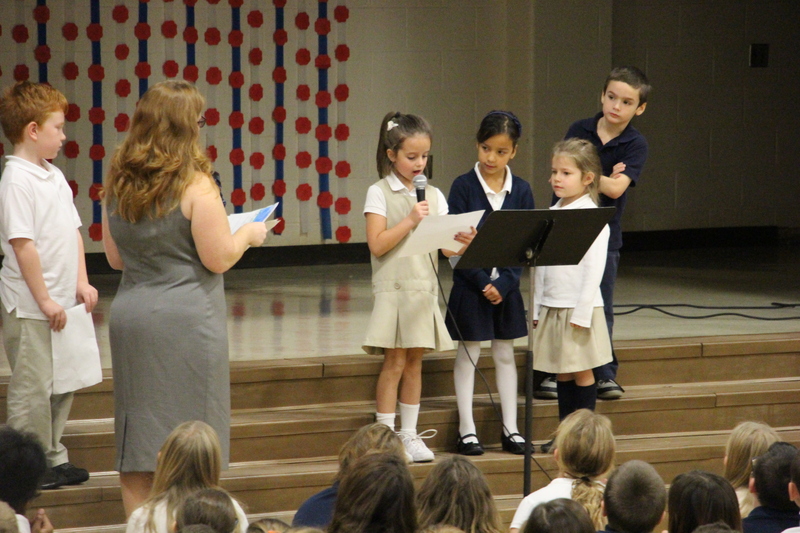 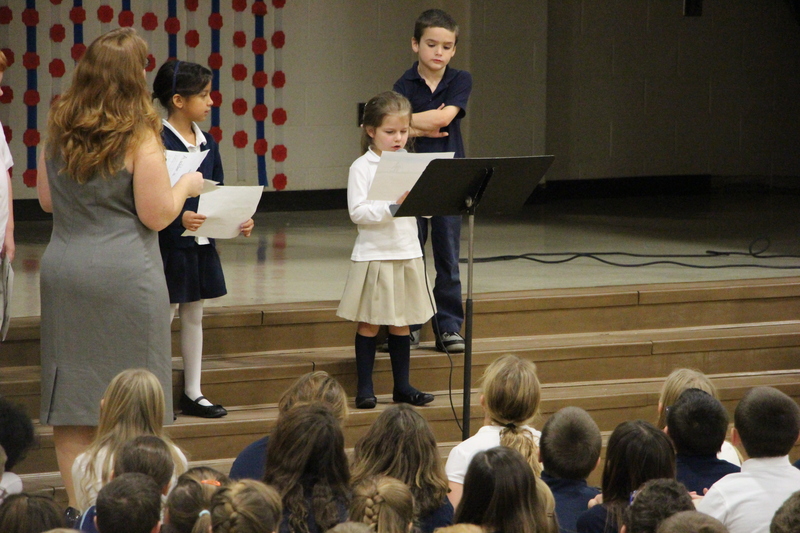 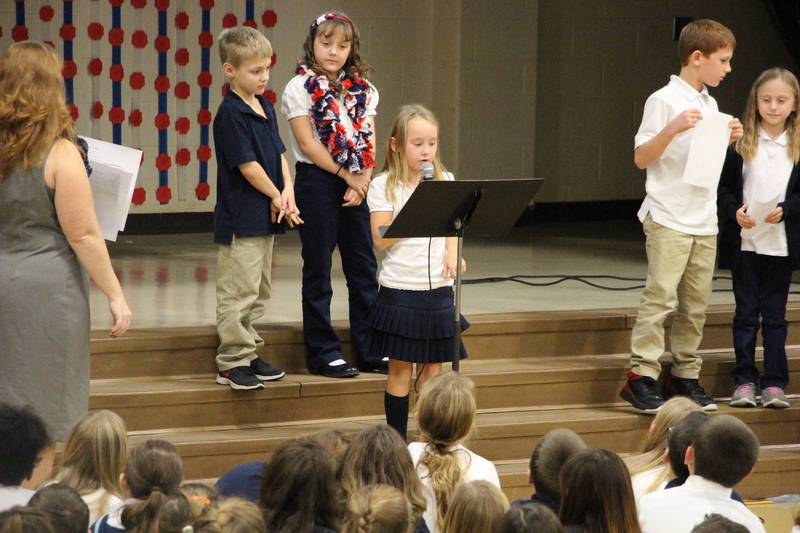 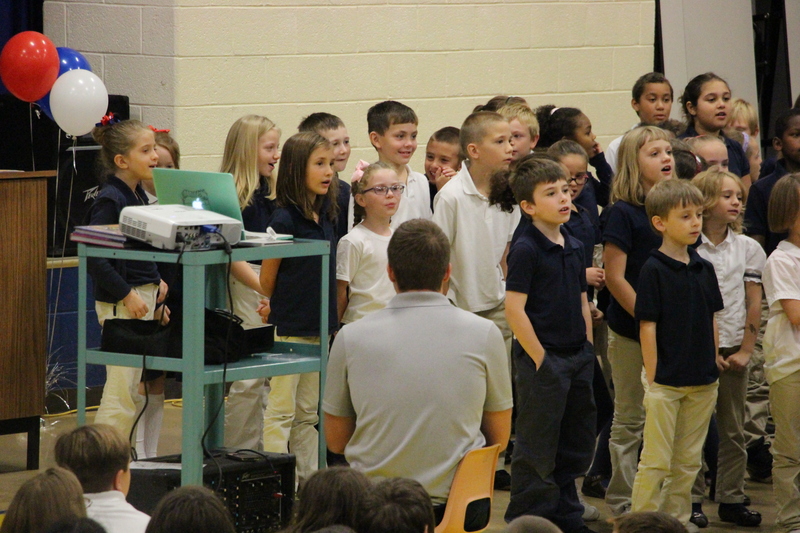 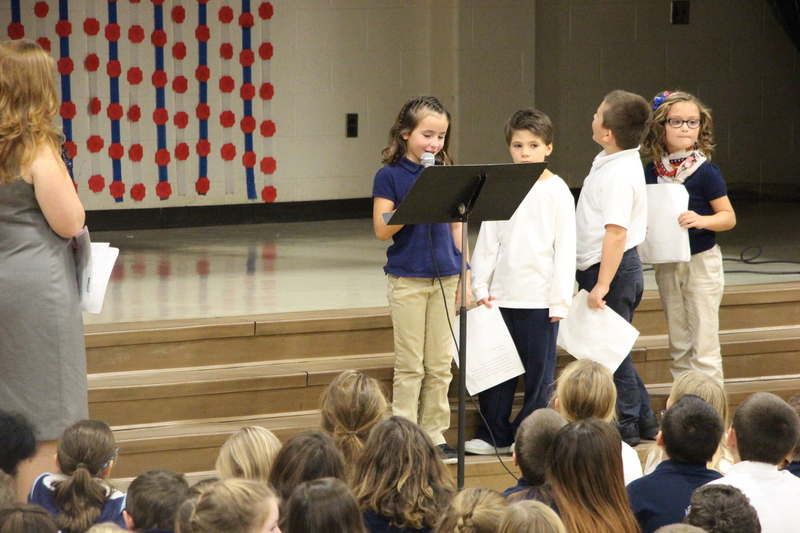 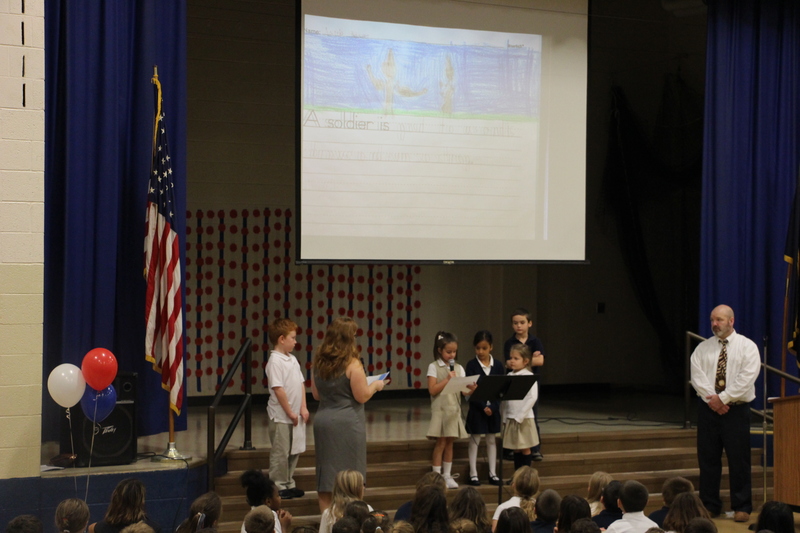 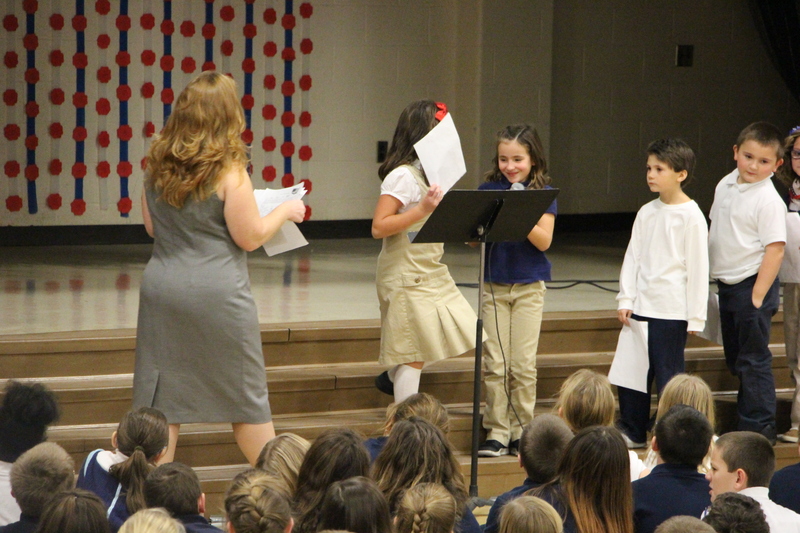 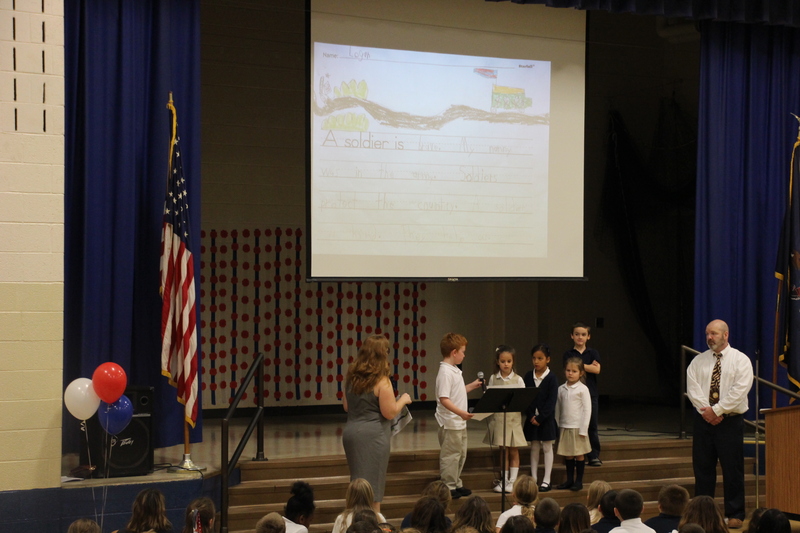 First graders sang a history song and select students read short letters titled, “What Is A Soldier.” Students were Logan Peters, Rylin Arroyo, Mackenzie Moyer, Riley Schuima and Natiya Adams. 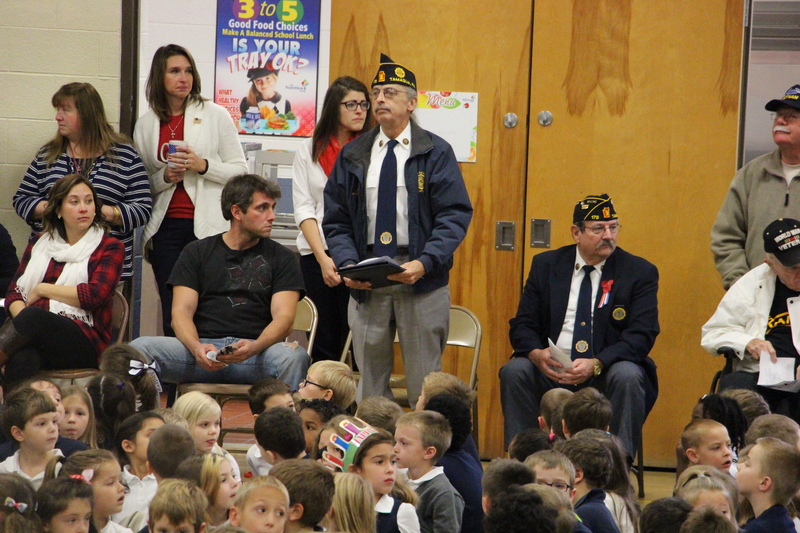 Many of the attending veteran’s names and their branch of service were read aloud. 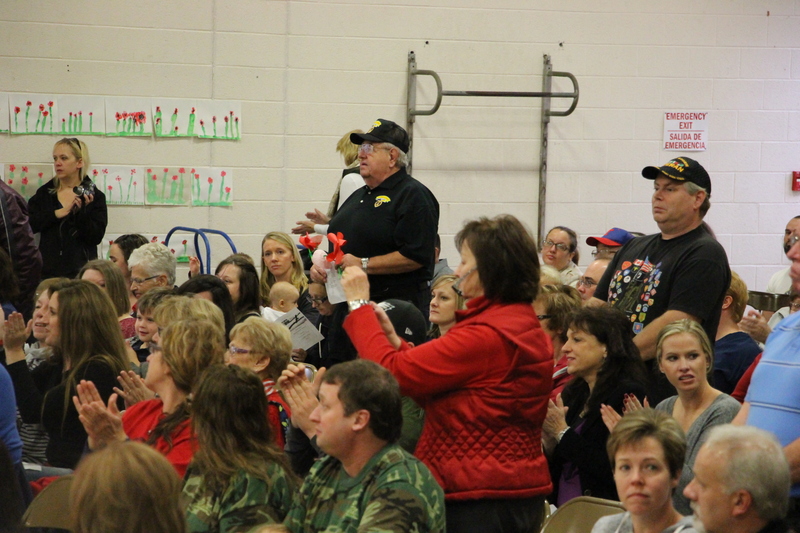 A special video showing area veterans was also played. 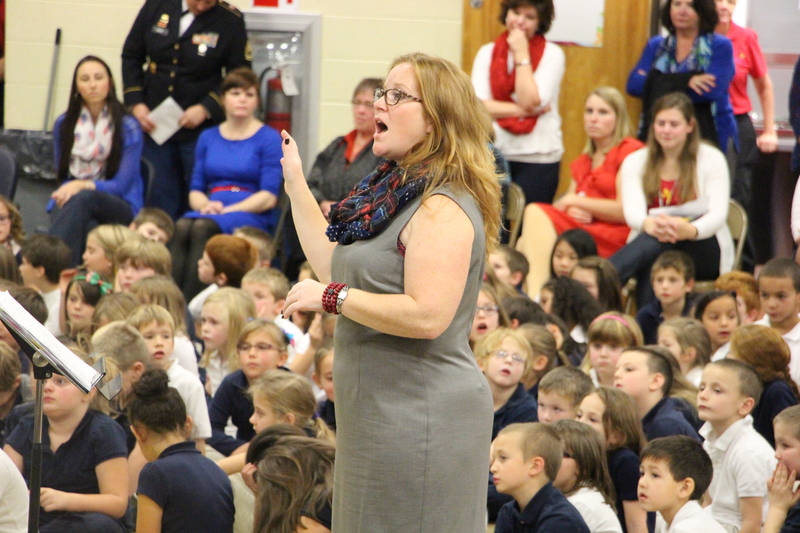 The video was created by teacher Jolene Barron. 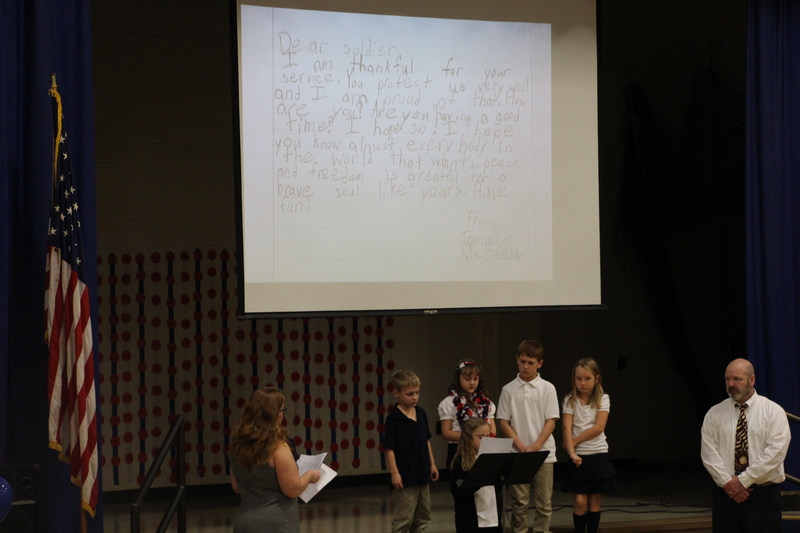 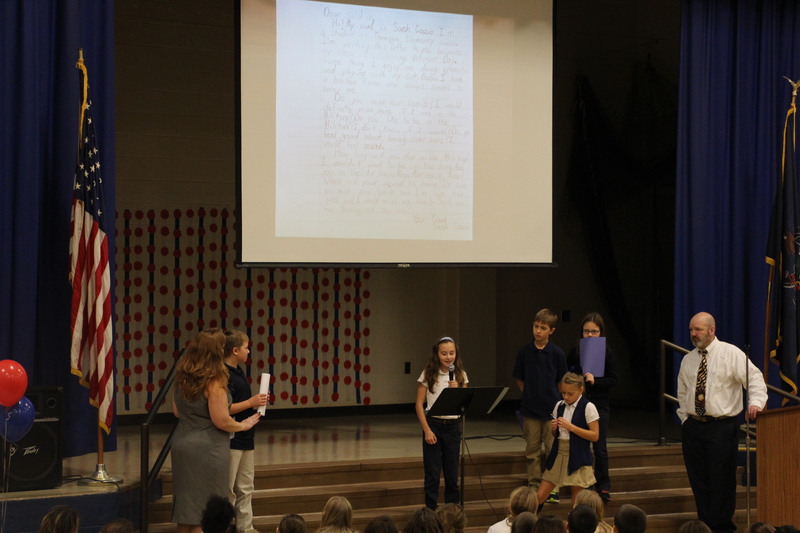 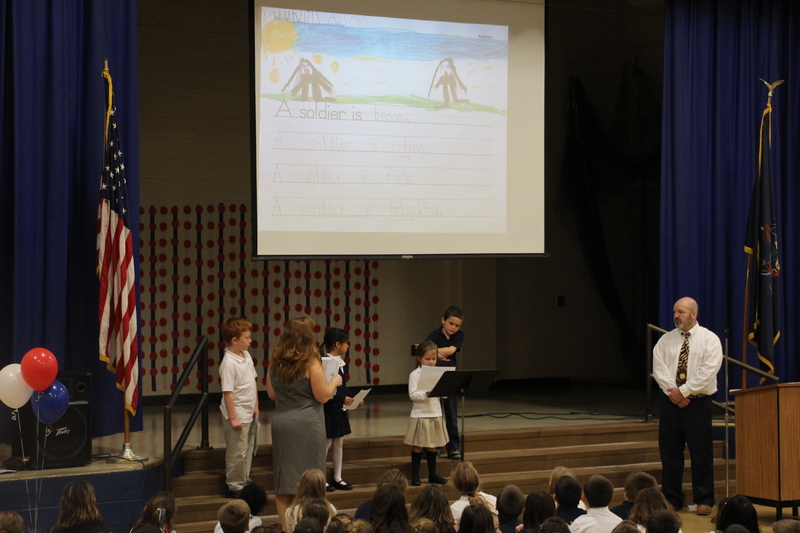 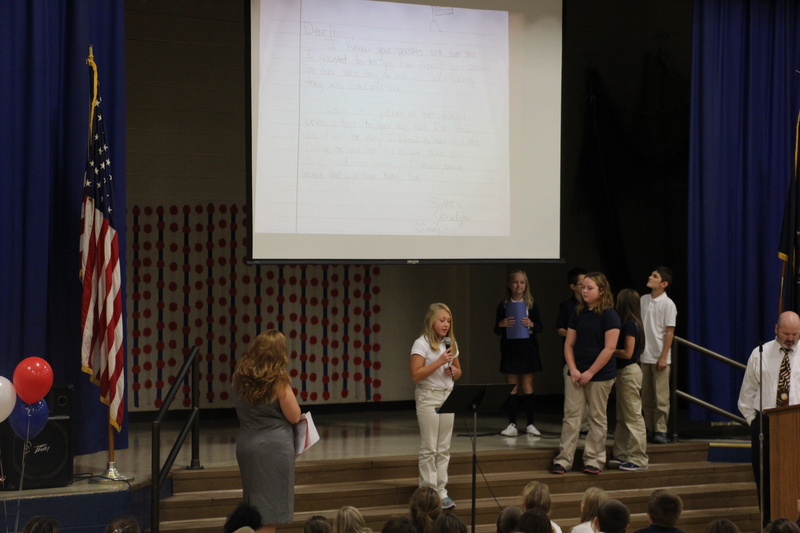 Select fourth grade students read “Letters To Soldiers Overseas.” Students were Timothy Berg, Autumn Magluilo, Sarah Coccio, Ethan DiBonifazio and Grace Slane. 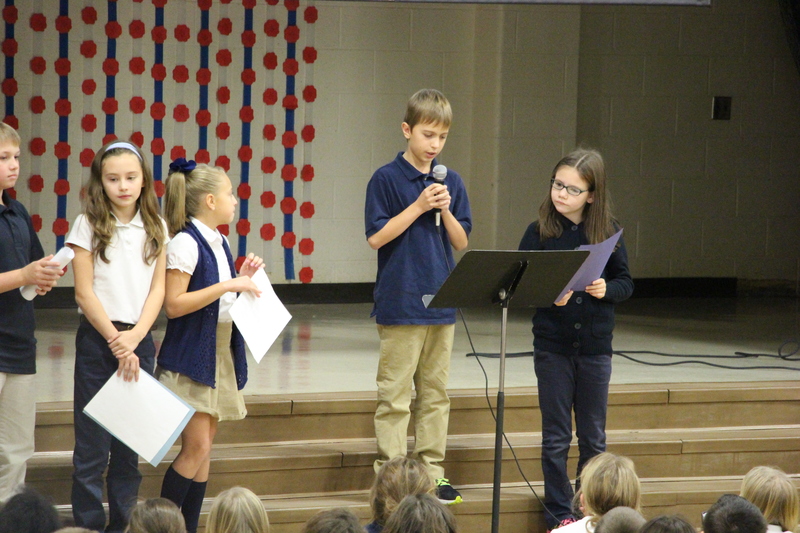 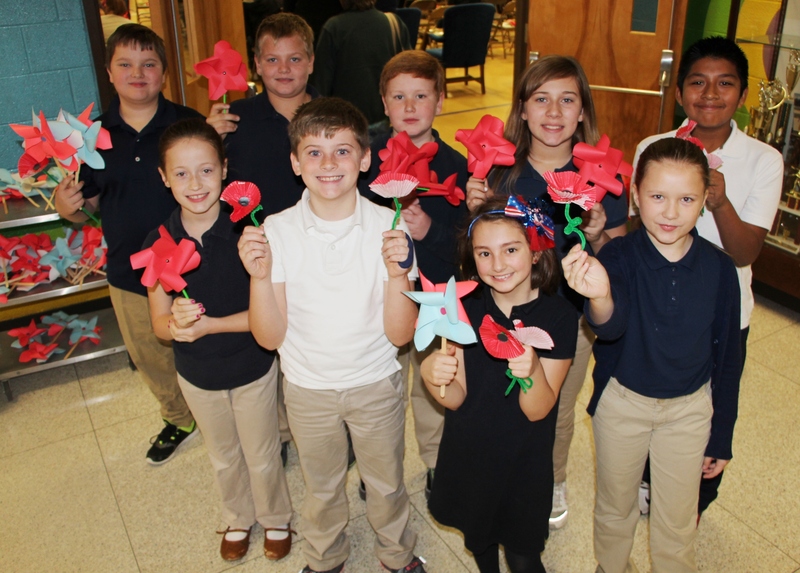 Select fifth grade students read “Letters to Students with A Parent Deployed.” Students were Zachary Markiewicz, Jacob DiMarco, Ava Kunkel, Emily Christman, Joselyn Tamagini and Kylie Greenzweig. 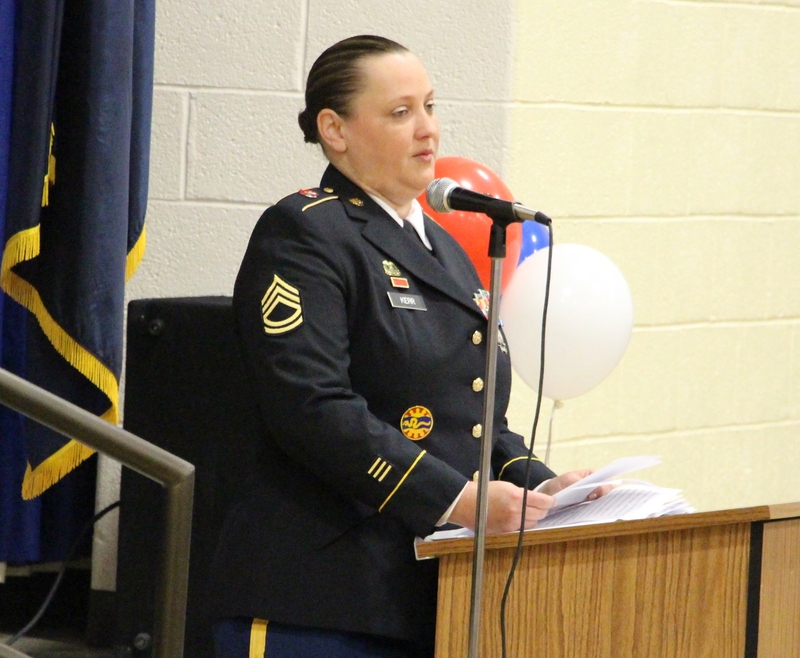 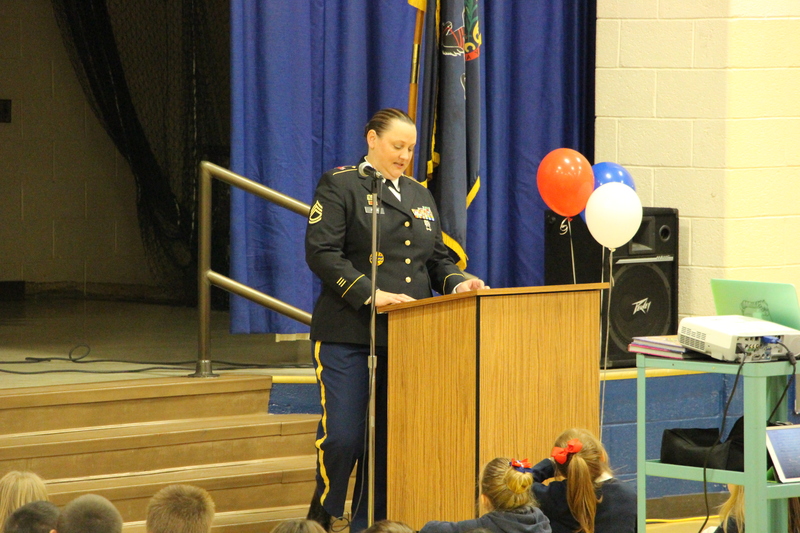 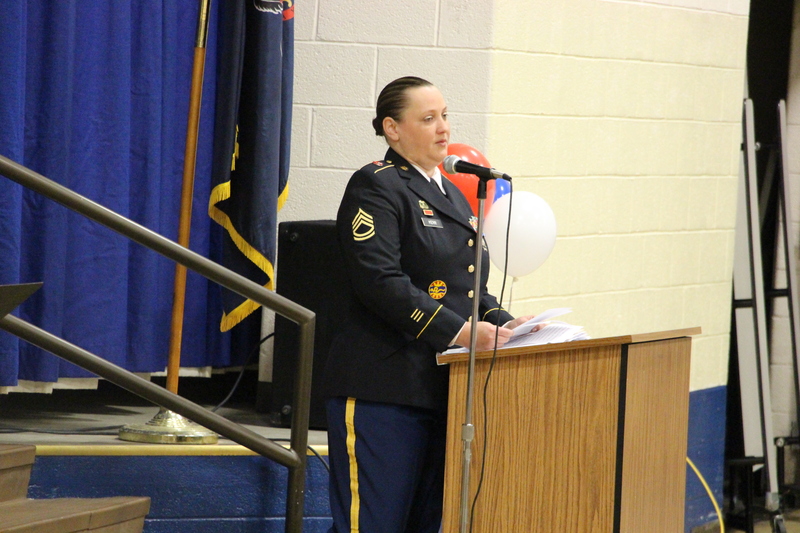 Guest speaker Sergeant First Class Amanda R. Kerr spoke about her experiences while in service. 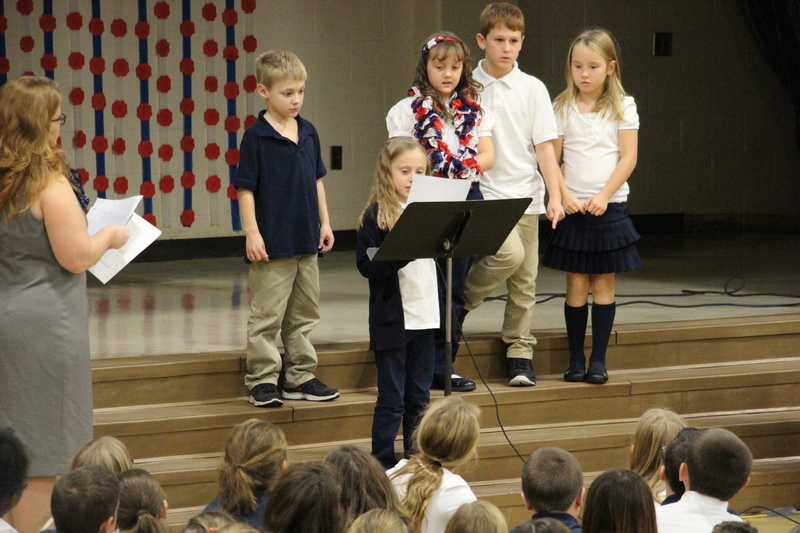 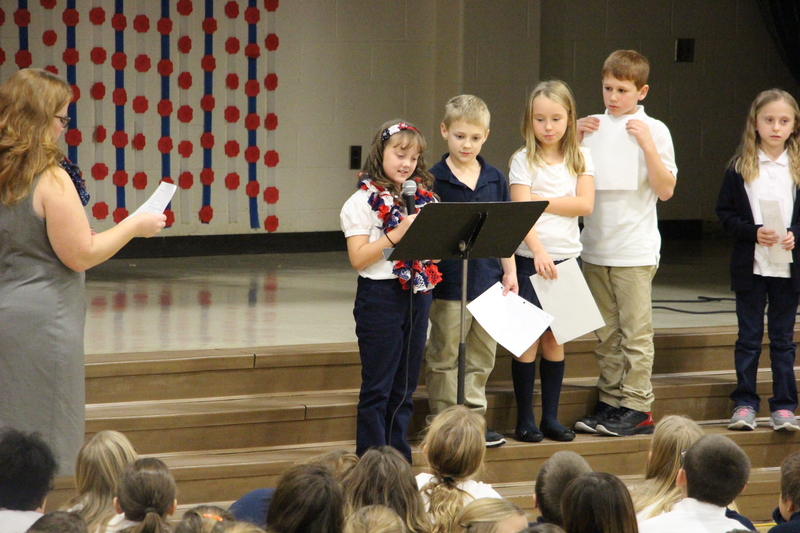 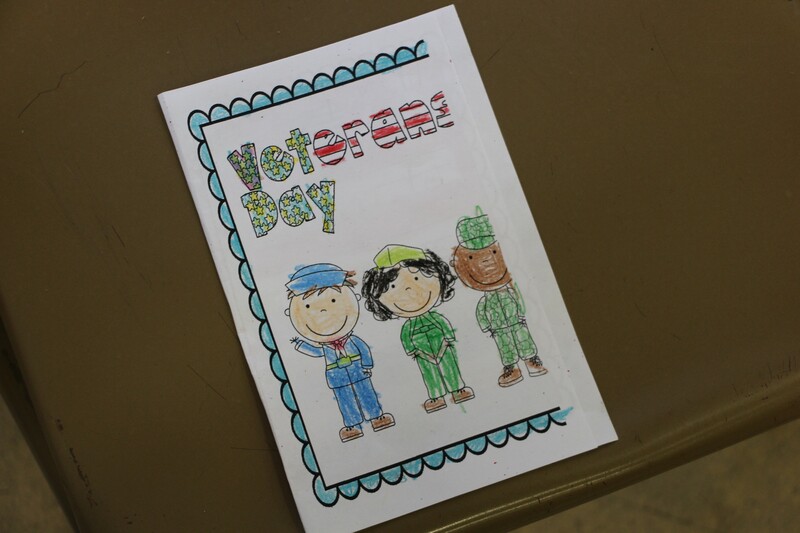 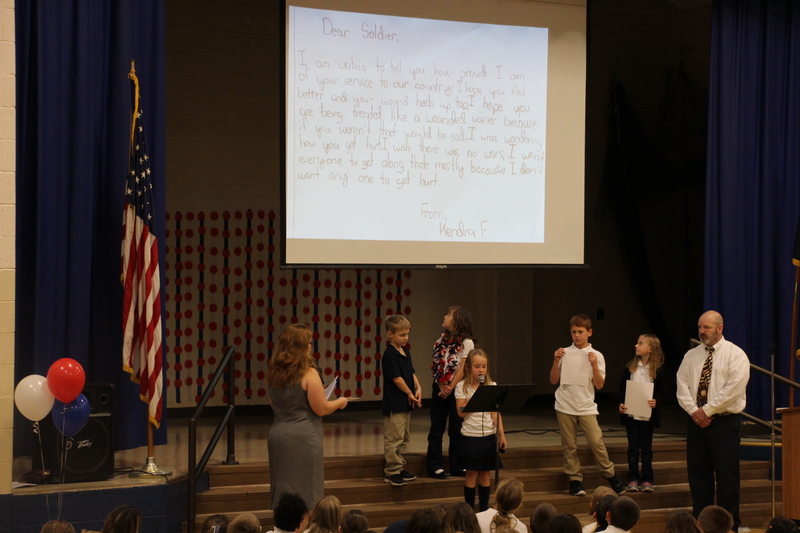 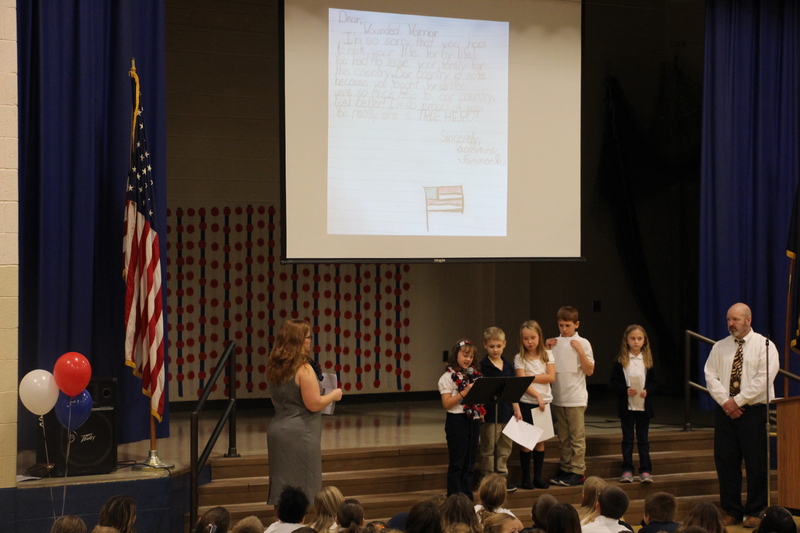 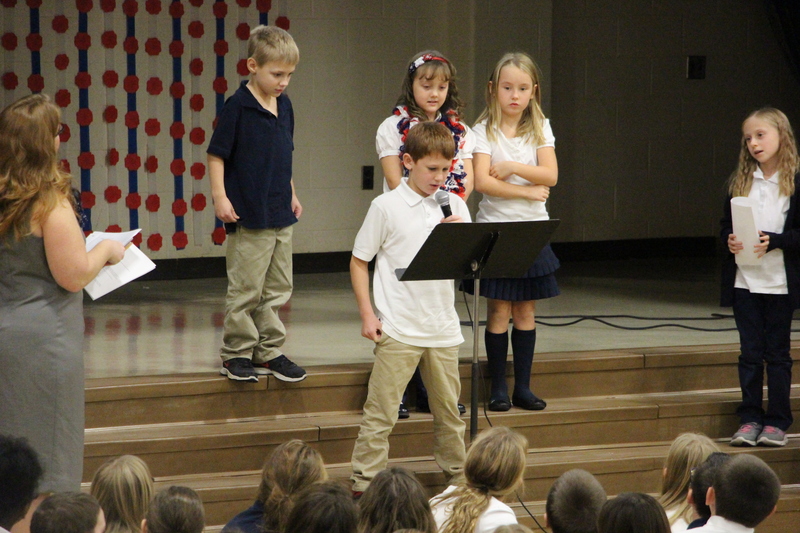 Select second grade students read “Letters to Veterans.” Students were Kendle Miller, Logan Zimmerman, Ava Jones, Koreena Bittner and Christopher Smith. 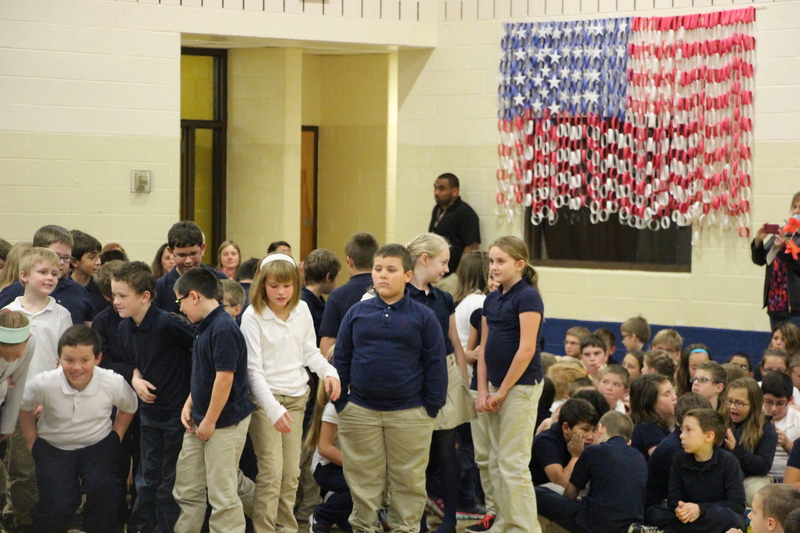 Yachera praised the students for their work preparing for the program. 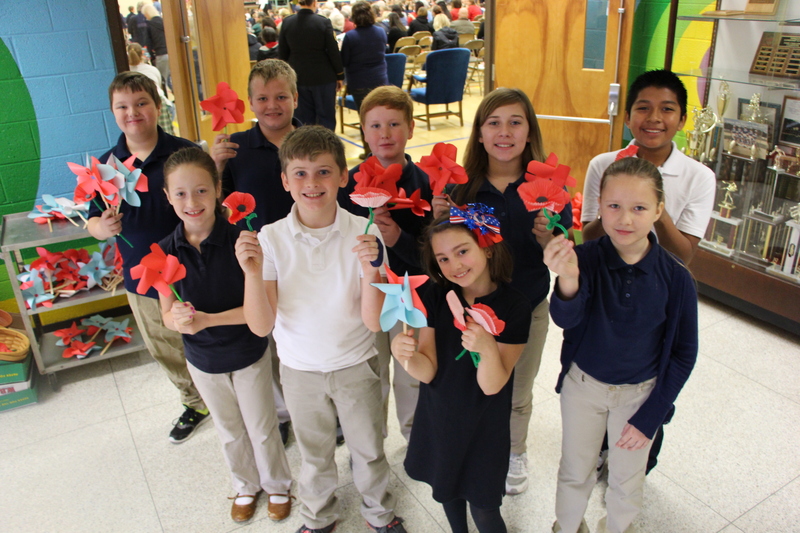 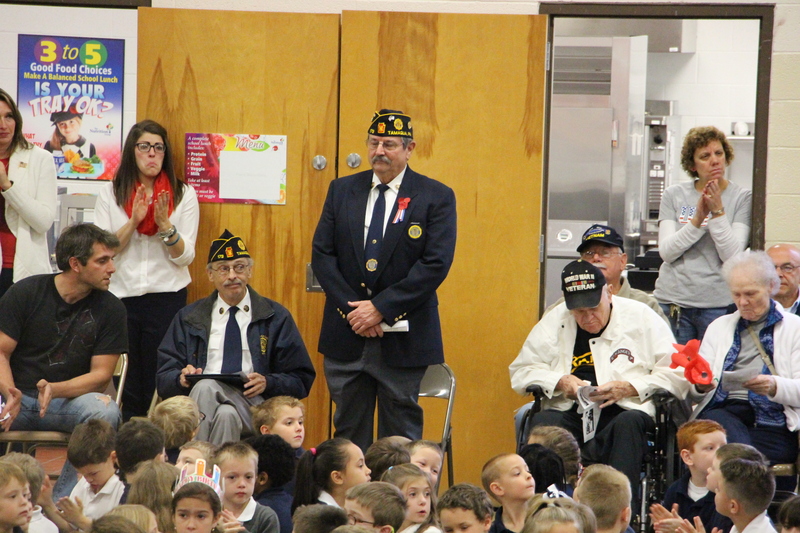 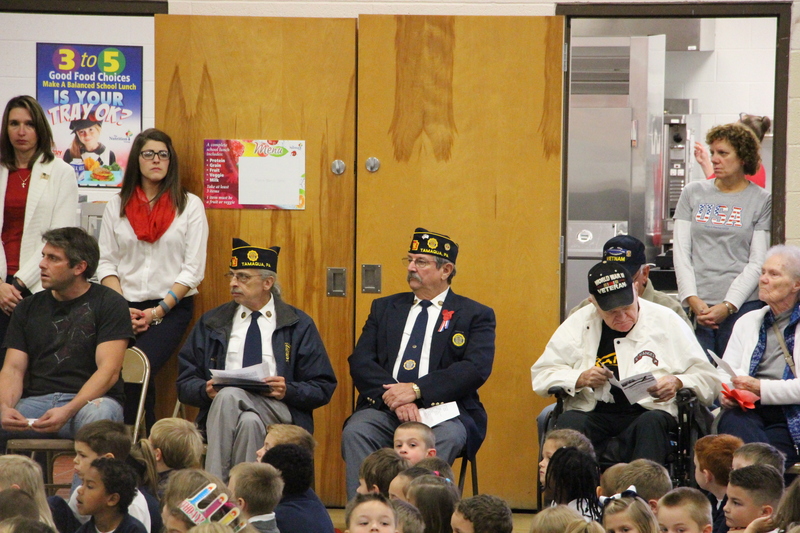 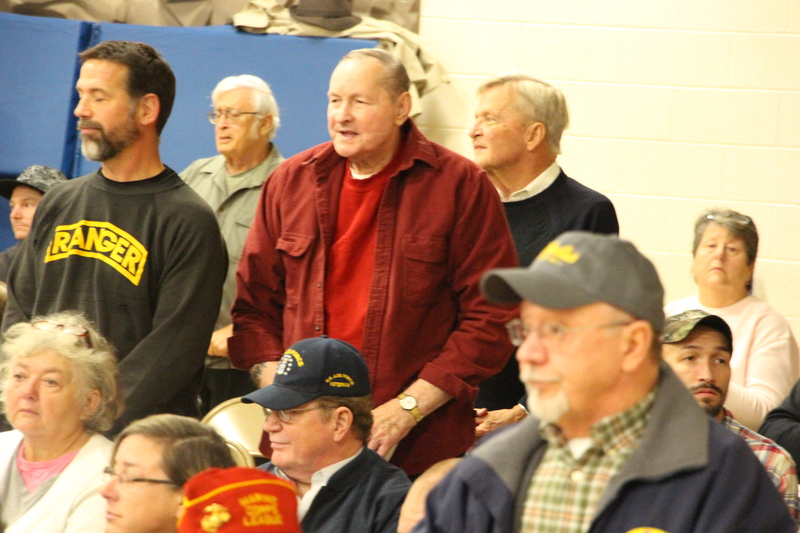 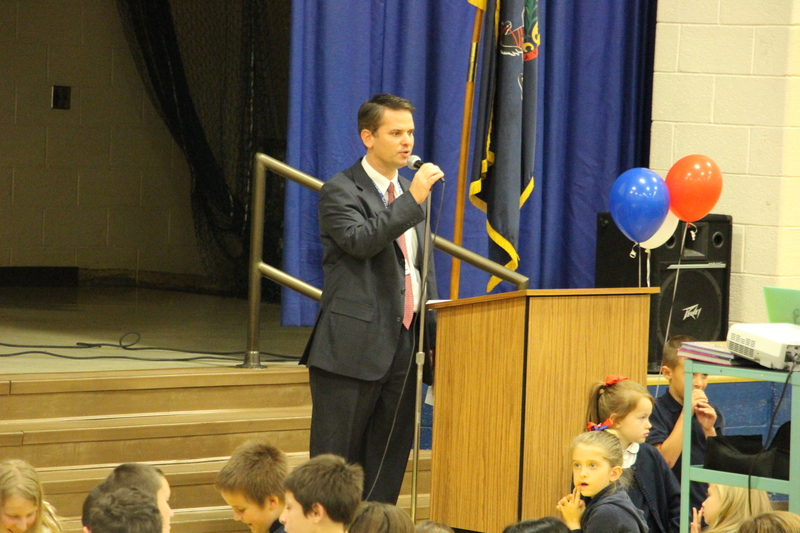 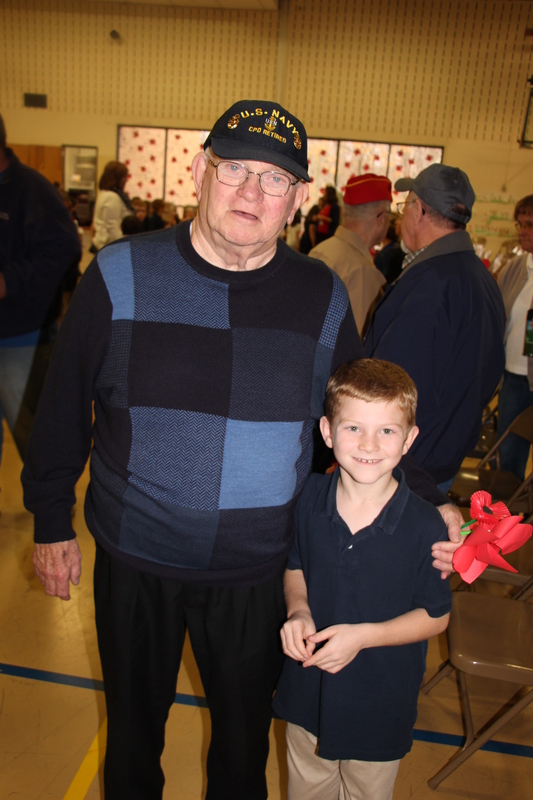 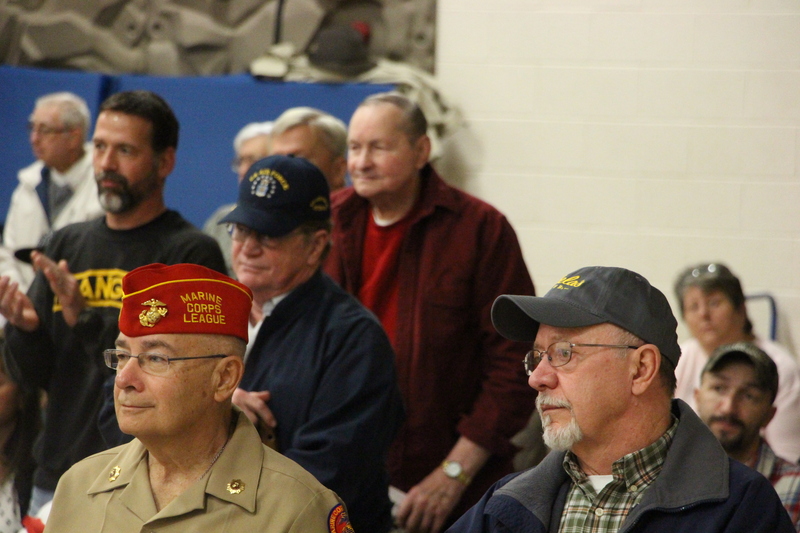 All veterans and guests were treated to a free luncheon by the school following the program. 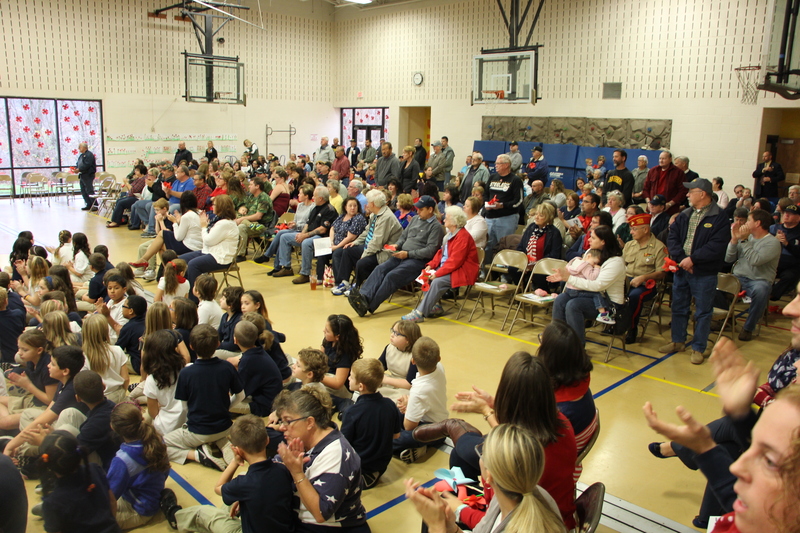 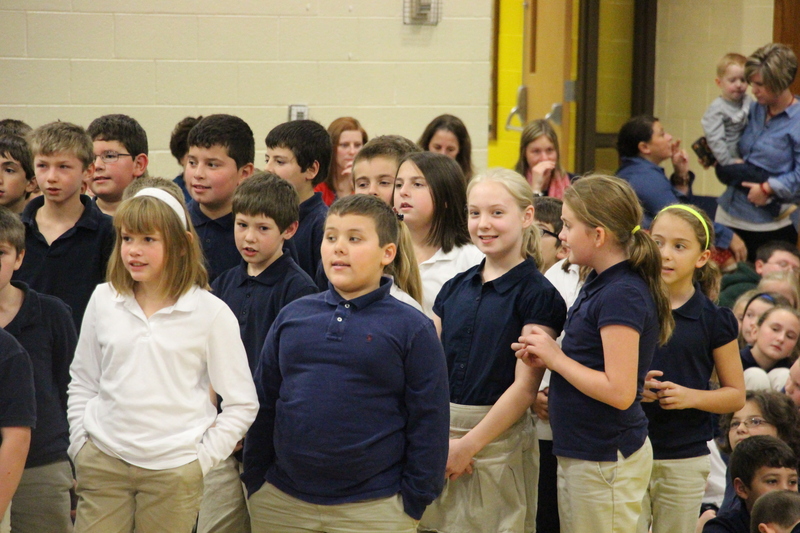 West Penn Elementary School will hold their program tomorrow morning at 9:30 AM. 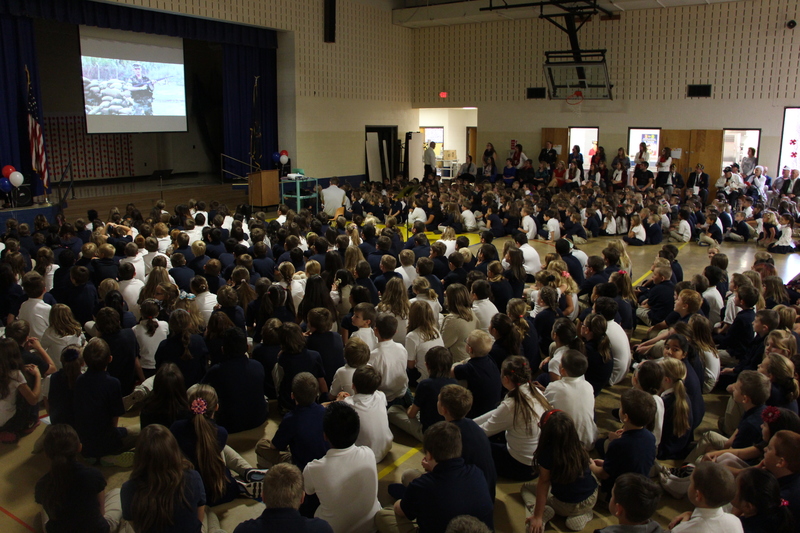 Click HERE to view the slideshow shown during the program.